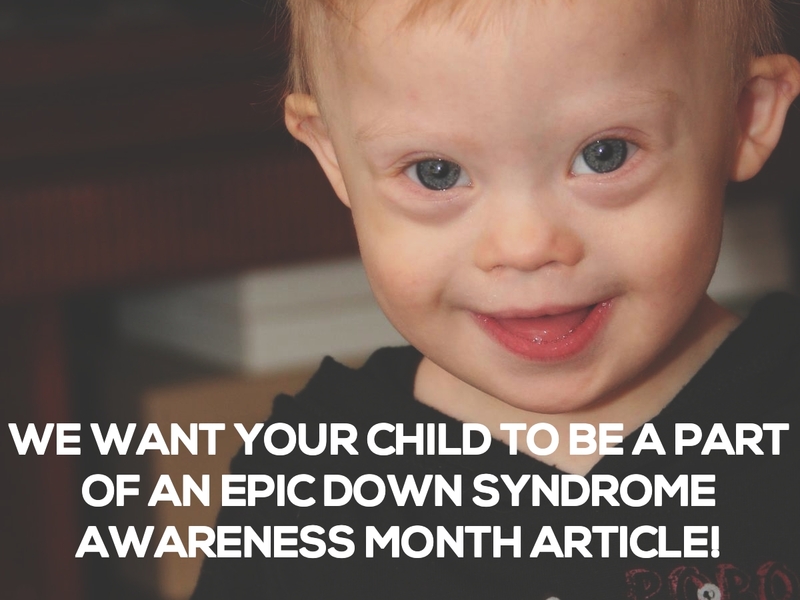 I’m working with a writer from Babble.com who’s writing an article for Down syndrome awareness month and I would love for you to be a part of it! 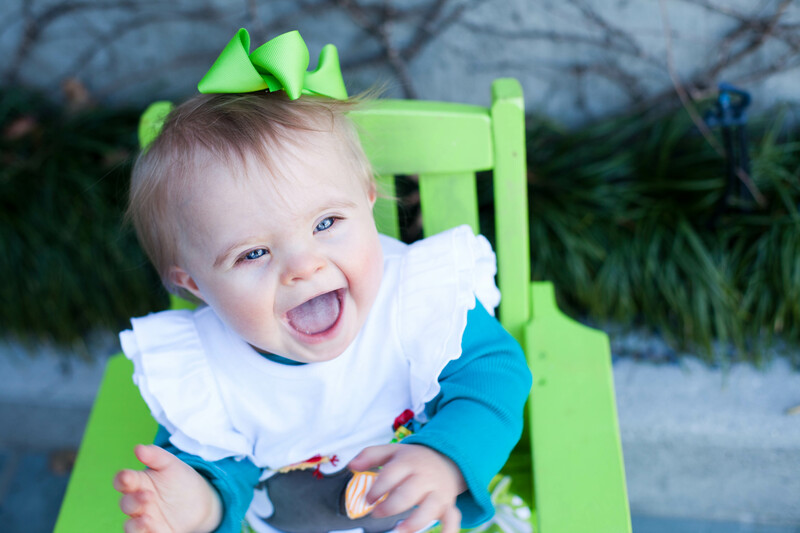 Most people have no idea what it’s like raising a child with Down Syndrome or what it’s like to be born with Down syndrome, the hope of this article (and Down syndrome awareness month) is to help people learn more about kids with Down syndrome. We’ll select eight pictures to a part of the article and to be considered you must include all the information above. 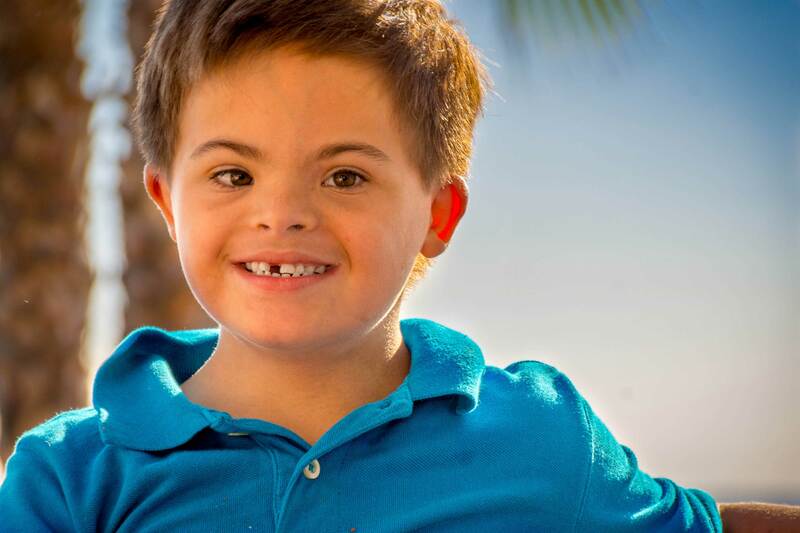 I’m excited about this article as I know it will help the world learn more about children with Down syndrome (and that’s a good thing!) I’m also excited to see your child’s cute mug in this article along side Noah’s! By the way, be sure to sign up for our email list (if you aren’t already) by entering your email in the form below t0 be notified as soon as this post goes live! I can’t wait to see all of the quotes and pictures you share in the comments, and especially can’t wait to share this article from Babble with you! What people don’t get about kids with down syndrome is that we’re all the same it doesn’t define them it’s just a part of who they are ,it’s no different then race, eye color etc. Its just something they were born with. 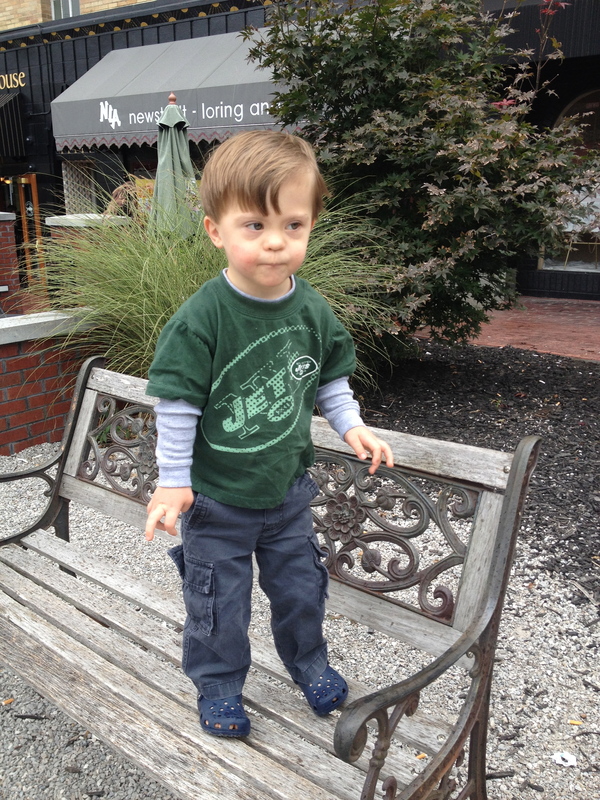 Not perfect..Just a human like everyone else..when I see my son I don’t see down syndrome. 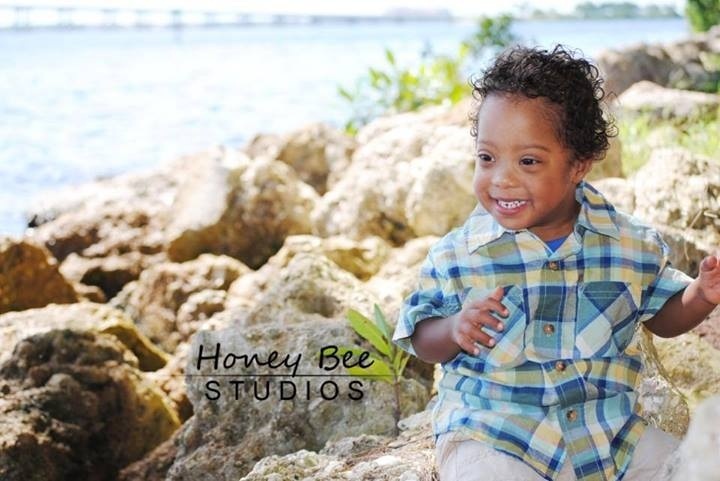 .I see a little – might I say handsome (; -boy just living life.like any other child. 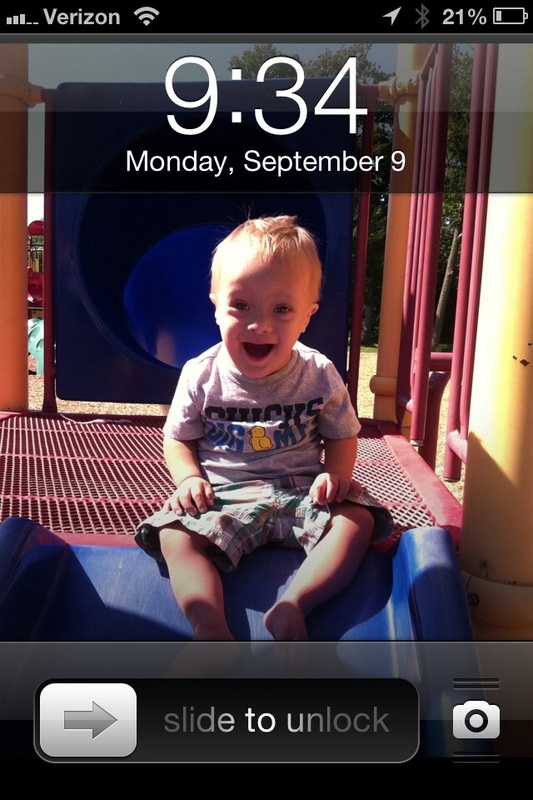 My special little boy is Coby and he is 11 months old. I think what people don’t get is that he is still just a baby! He still babbles and laughs, he still needs his diaper changed and some set routine. He still wants to be cuddled and cries! He still wants to play and interact. At the end of the day, we are all more alike than different! I hope it’s okay that he’s not my child – he’s my brother! What the average person doesn’t know about my brother is that he has an unbelievable capacity for unconditional love. He is also exponentially more enjoyable than he is difficult; more compassionate than he is stubborn; and more hilarious than he is moody – although sadly you may only hear of the latter. And in the strangest way, he gets me. 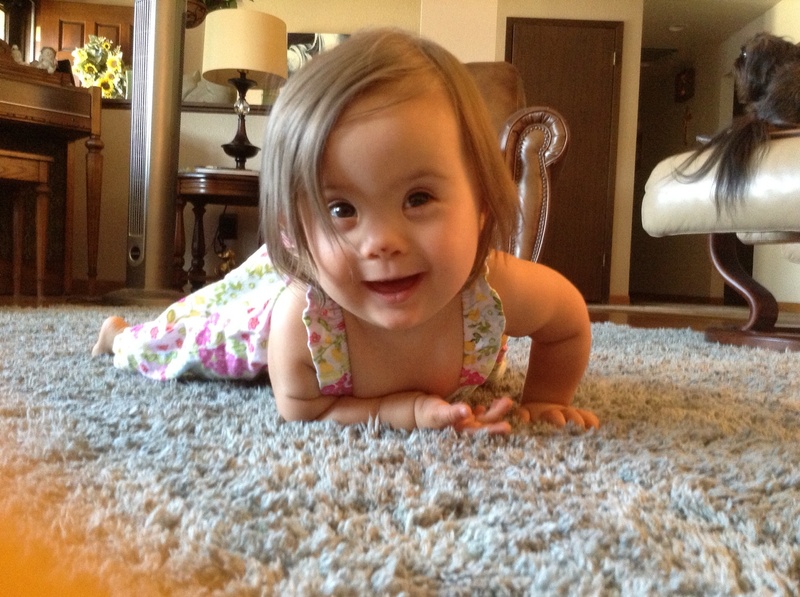 I can’t speak for every Down Syndrome child, because each is different. But I can speak for my brother. 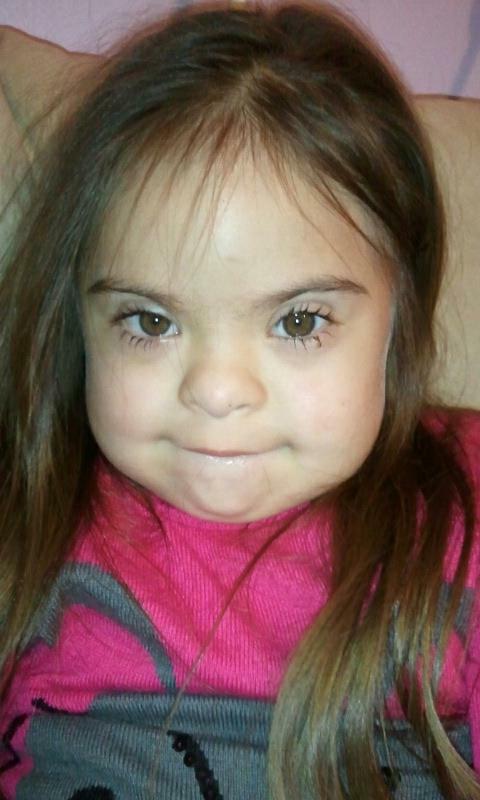 My Quote: When people see Mae they often see “Down syndrome” first . . . but I just want the world to see my sweet Mae. She does absolutely everything her peers do and is by far my best child (don’t tell her siblings I said that!). Eli 2.5 years. He’s just like any other boy who wants to play and have fun. Eli is child 9 of 10 and if you ask any of his siblings, well the ones that can talk, they will all tell you he is the favorite of everyone with his personality and smile. Eli is Eli, and we wouldn’t change him! I wish everyone could experience the love we feel. It would change the world! Agostina, 10 months. 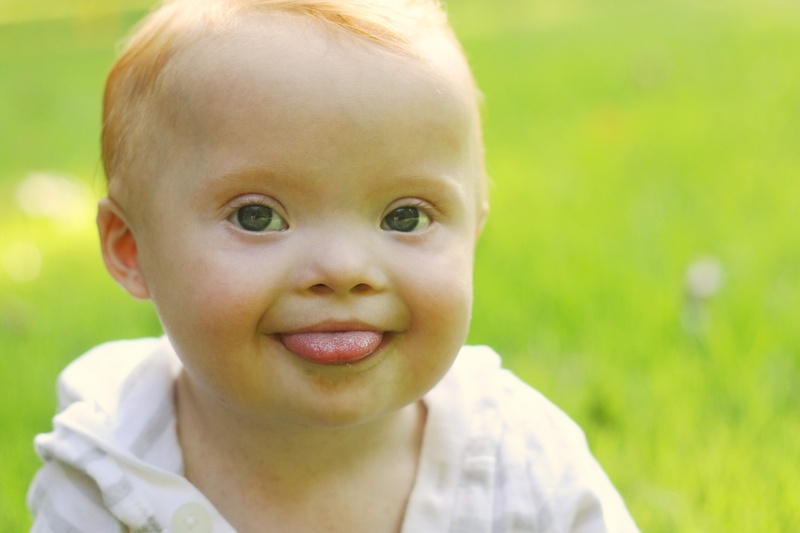 People with Down Syndrome have their own personalities, from the scratch. People always say- “you are so lucky. He is happy all the time.” I kindly tell them (and sometimes show photos) that he has a range of emotions, just like any other person! 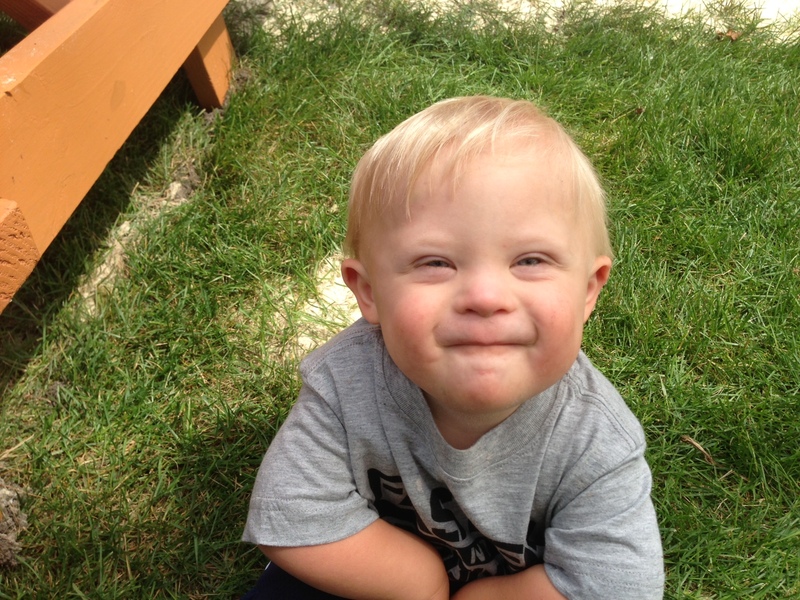 There are a lot of things people don’t get about children with Down syndrome. The main thing I see is that they are just like any other child. I honestly don’t see much of a difference in chambers than I saw in her brother or sister at her age!! She is amazing in everything she does each day… Just like they were!! Keeley is 16 months old. 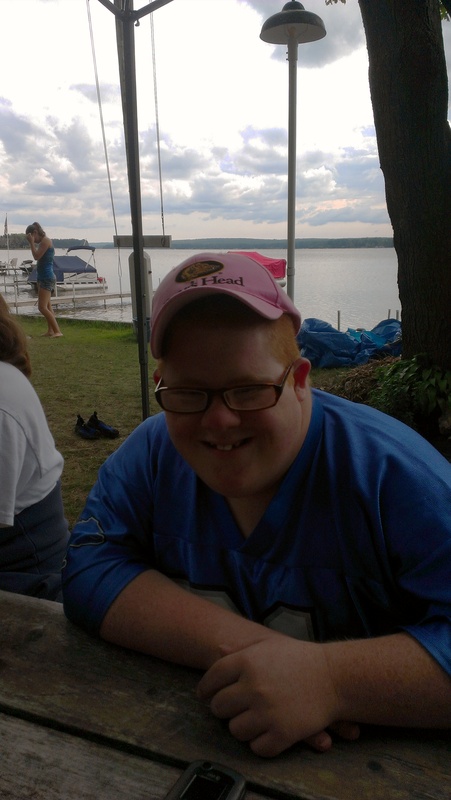 People don’t get that kids with Down syndrome change your life in ways you never imagined! Their smile lights up your world. They teach you to live life to the fullest and celebrate everything! 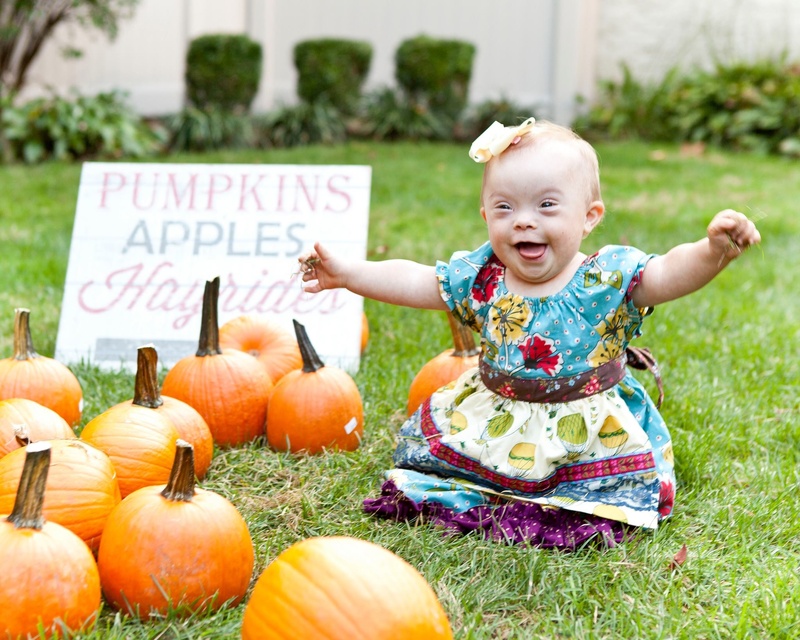 A child with Down syndrome just shines so bright! They think Down’s Syndrome means they’re slow/retarded but that shows how little they know & ignorant they are. People with DS are as normal as we you & I – they put their pants on one leg at a time as you & I! My son’s name is Bennett, he will turn 1 on Oct 26th. 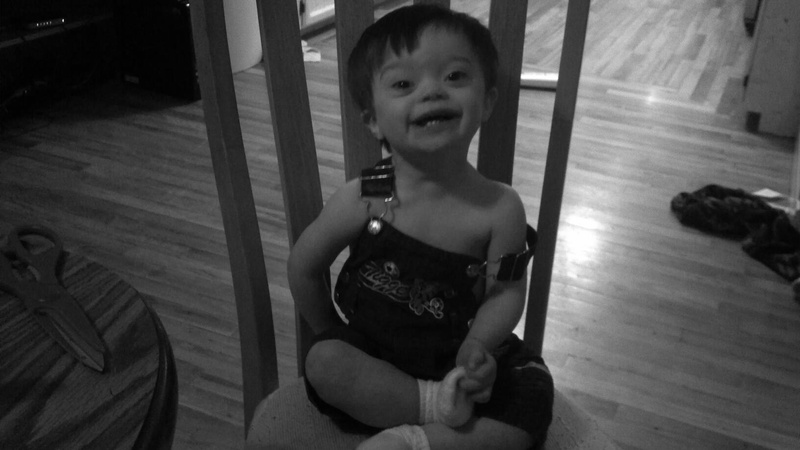 The one thing that I think people don’t understand is that I feel privileged to have a child with Down Syndrome. Other parents I know may think I’m just saying that. However, I’ve learned so much about unconditional love and Bennett has taught me things I may never have learned had he not had DS. 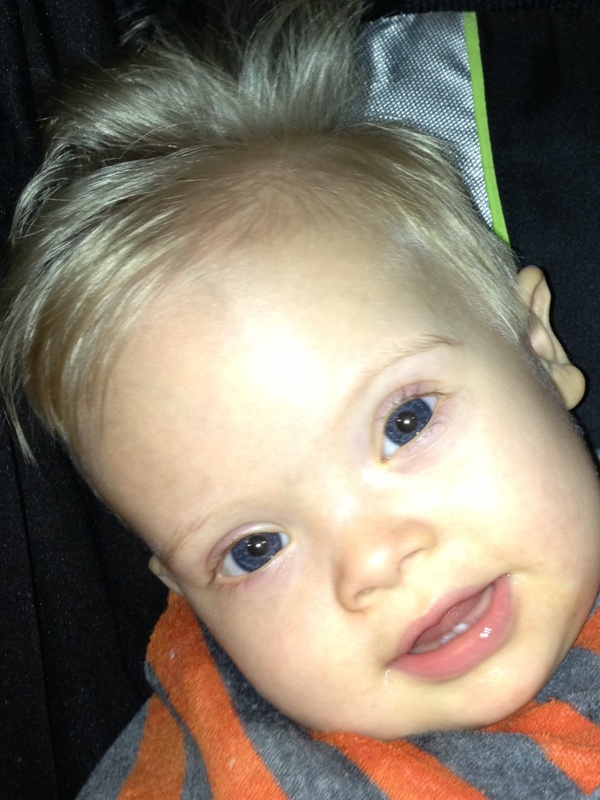 I believe that Bennett having Down Syndrome has made me a better mom. This is such a wonderful answer…and I couldn’t agree more with you as a fellow “priveleged” mommy! 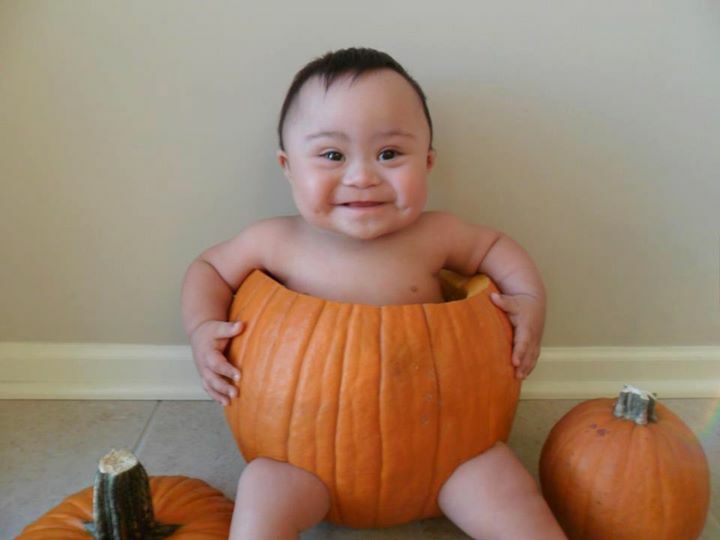 People don’t get that kids with Down Syndrome are not sweet ALL the time. They get upset too and will let you know when they are! My name is Katy, my son is Caleb. Sorry. My daughter, Loren Olivia is 11 years old. 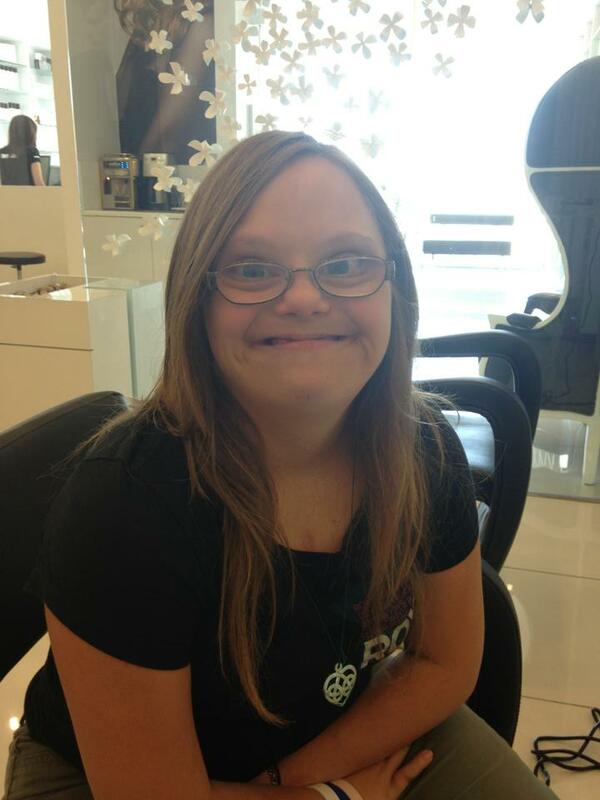 Loren doesn’t set limits for herself because she has Down Syndrome and no one else should set limits for her either. My son’s name is Brayden and he is 7 years old. What people don’t get is that even though the speech is delayed they understand just about everything they hear. And communicate in their own special way. Eli 2.5 years. He’s just like any other boy who wants to play and have fun. Eli is child 9 of 10 and if you ask any of his siblings, well the ones that can talk, they will all tell you he is the favorite of everyone with his personality and smile. Eli is Eli, and we wouldn’t change him! 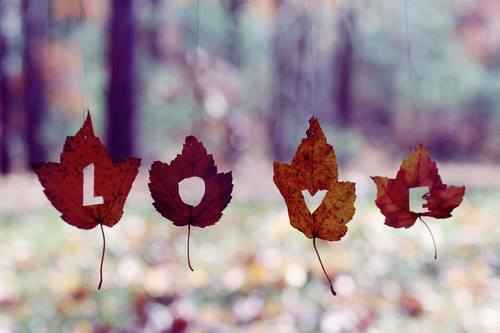 I wish everyone could experience the love we feel. It would change the world! We are the lucky ones! Peter 8 years old. 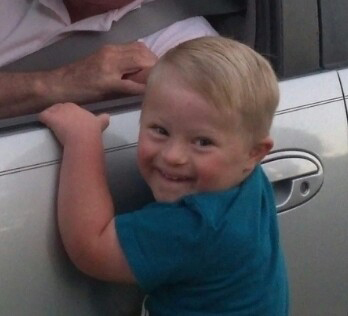 I really dislike the ignorance of people who assume just because a child has Down Syndrome, they )(including my son’s father, think they are sick!! 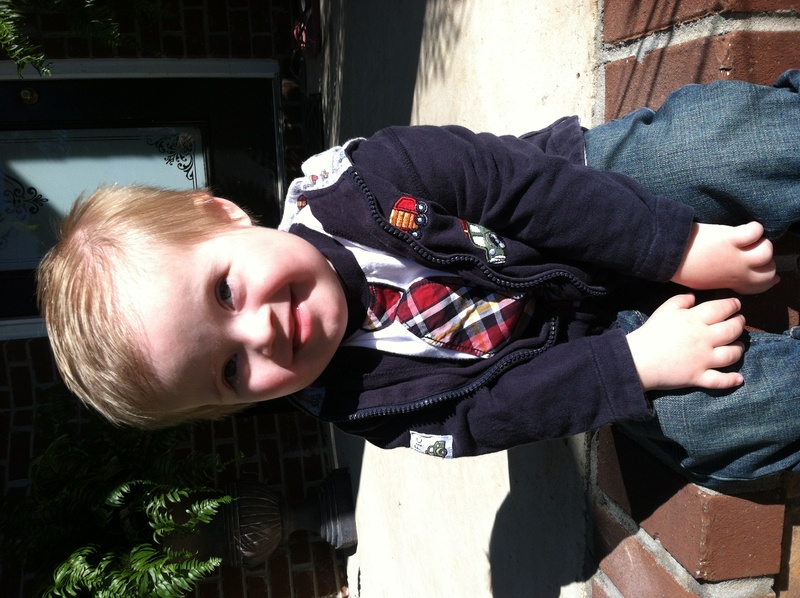 When I tell some people that Peter has Down Syndrome, they automatically say “Oh, I am sorry. 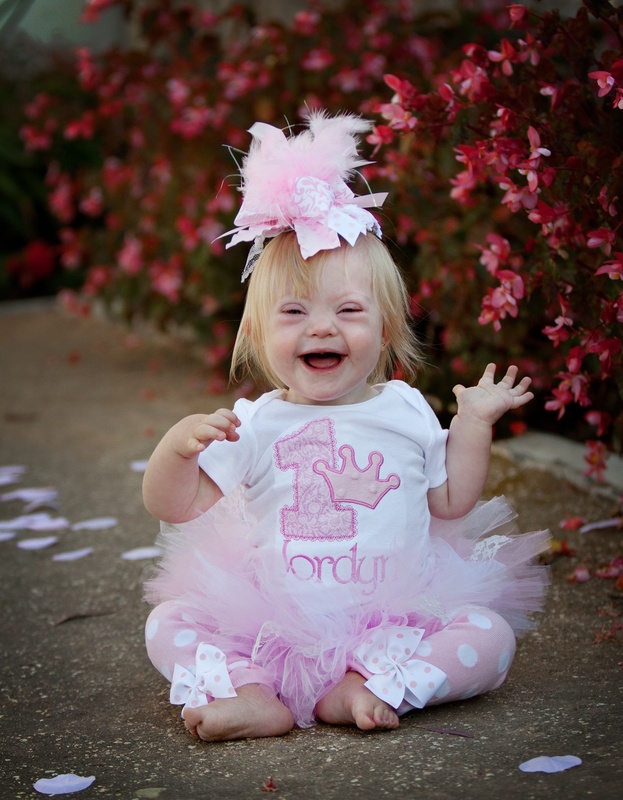 It must be hard to raise a sick child!” Number 1, having Down Syndrome does not mean you are sick. Thank God, my Son is a healthy and high functioning 8 year old. 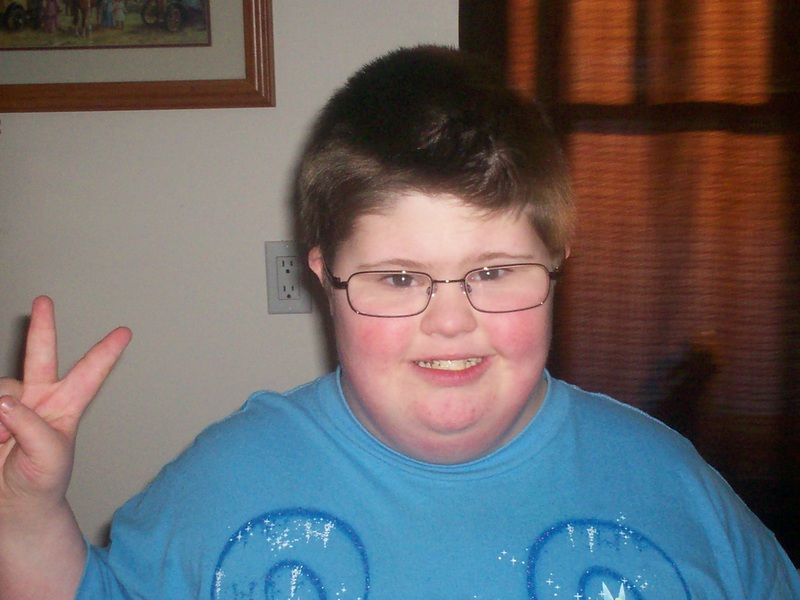 Number 2, I am not “Sorry” he has Down Syndrome, I won’t change a thing about him. He is the most loving child and despite the ignorant strangers, he is so loved by everyone in our neighborhood including the CVS and Publix we shop at where they completely spoil him! He is also is the Miami Marlins’ biggest fan! 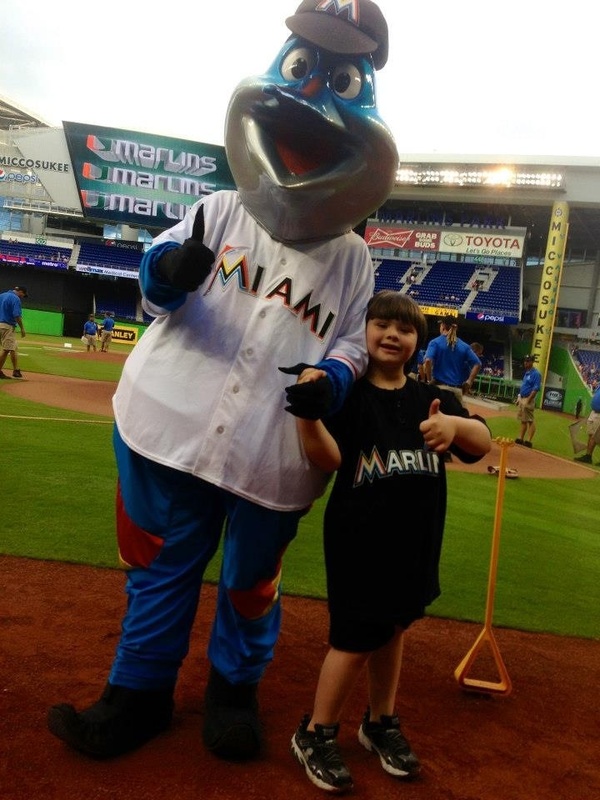 Peter is also a fan of theirs but they are HIS biggest fan as they are a big supporter of The Miracle League of Miami where Oeter plays baseball! 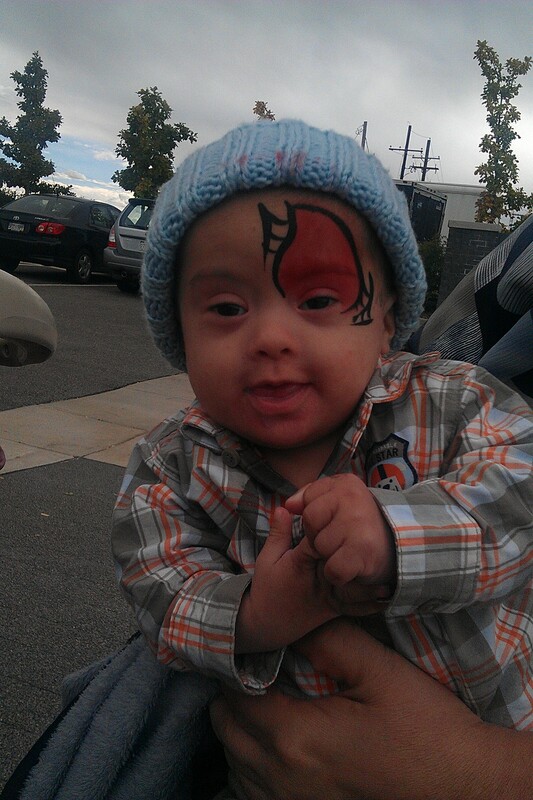 i tell people that i am blessed to have a son with Down Syndrome! 🙂 takes them for a loop, and they know right away that is is o.k. to have him in our lives! Here’s Jonathan he’s 19 months. He is more like you then different!! I hope you will include him in your story. Keep up the great work. 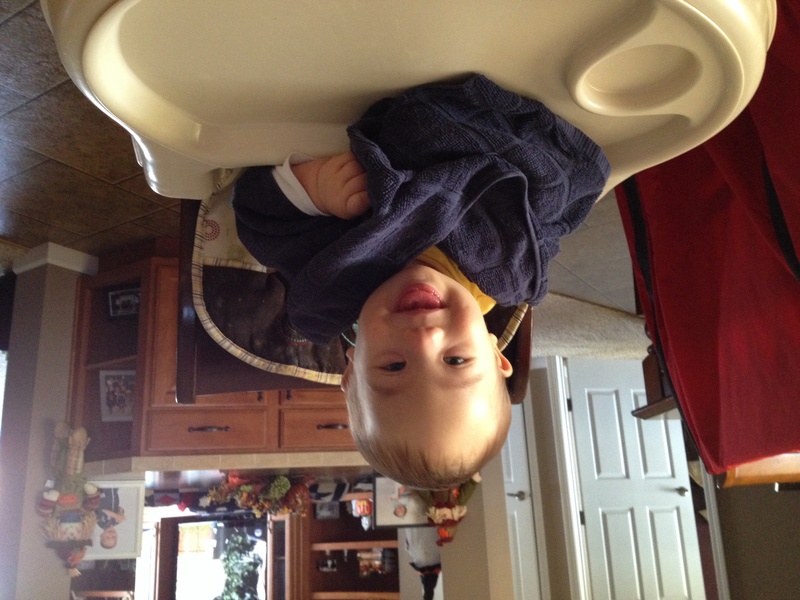 I love seeing Noah’s pictures and can’t wait to see his little brother! What a cute picture! He is adorable. Danni is more like her peers than diffrent. She loves to play, throw fits when she is told no, she loves to sing and dance. She is the joy of our lives. My favorite quote from people is “Oh,he doesn’t look down syndrome” we even had someone say ” he must have out grown it!” No lie, they actually said that. 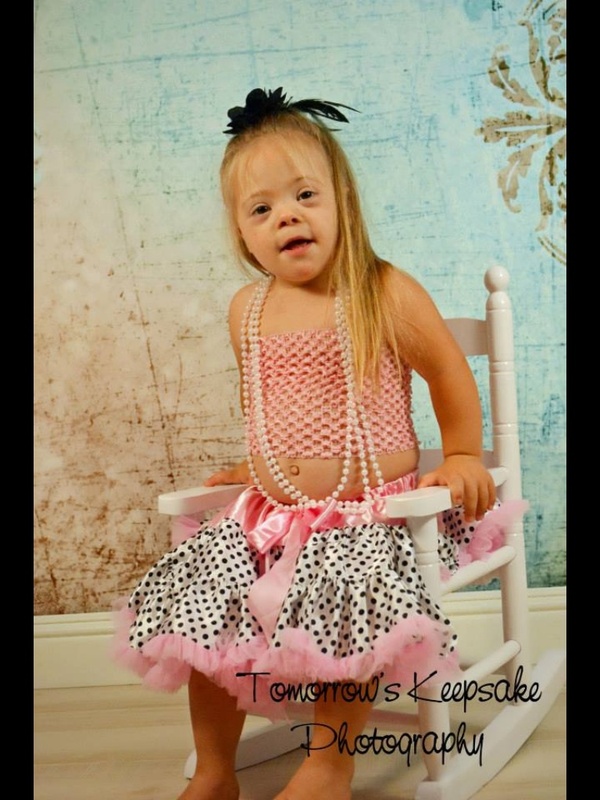 I am not sure what people think a child with down syndrome should look like. Philip enjoys being part of a team just like typical kids. 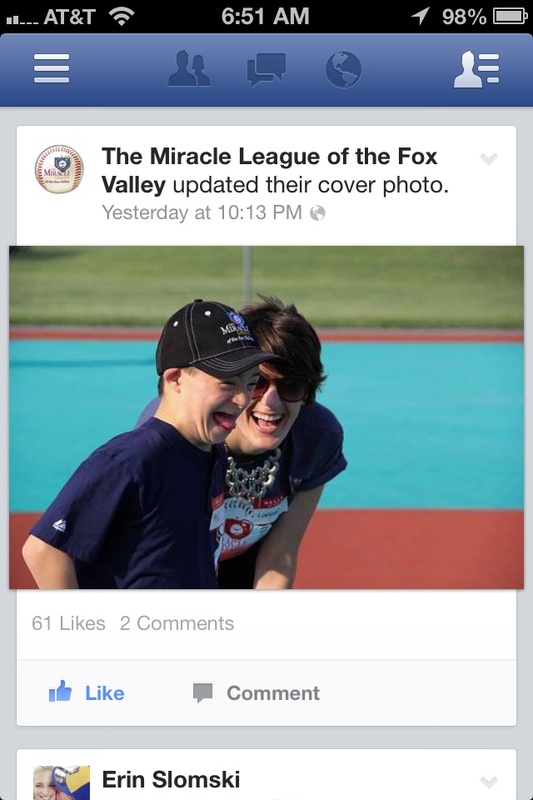 The Miracle League allows special needs children that opportunity. 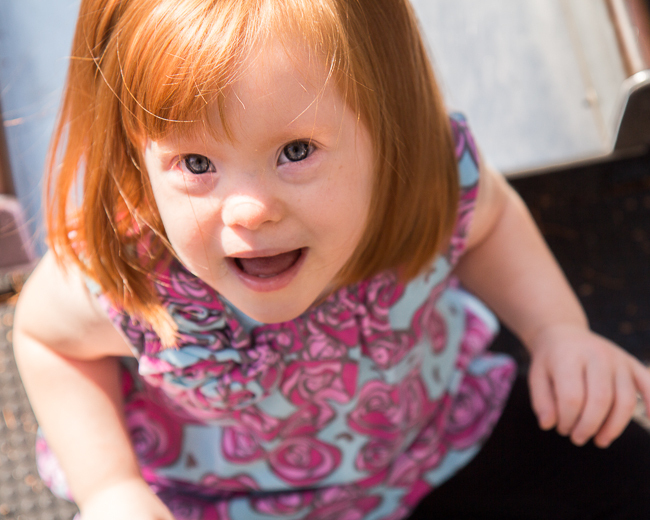 Cora Rose is loving, bright, curious, playful and friendly…and just like any other 2 year old! They can, want to and will do everything everyone else can do – just at their own pace. They are more like other kids than they are different. 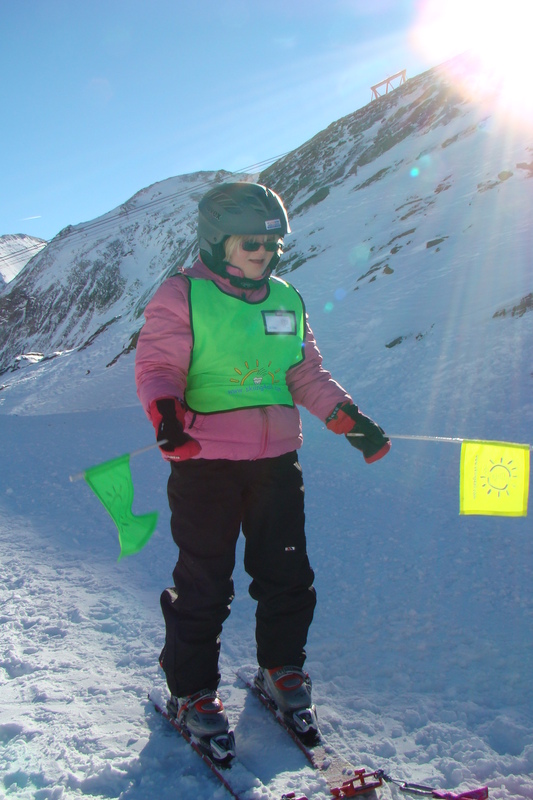 People with DS teach us how to be resilient and how to never give up. They work hard to reach their goals and do it with an amazing attitude. They teach us to love unconditionally and without prejudice. They really teach us how to be a better version of ourselves. Julia has taught me to be patient, to realize that we are all more alike than different, to always hope, and definitely always to persevere! 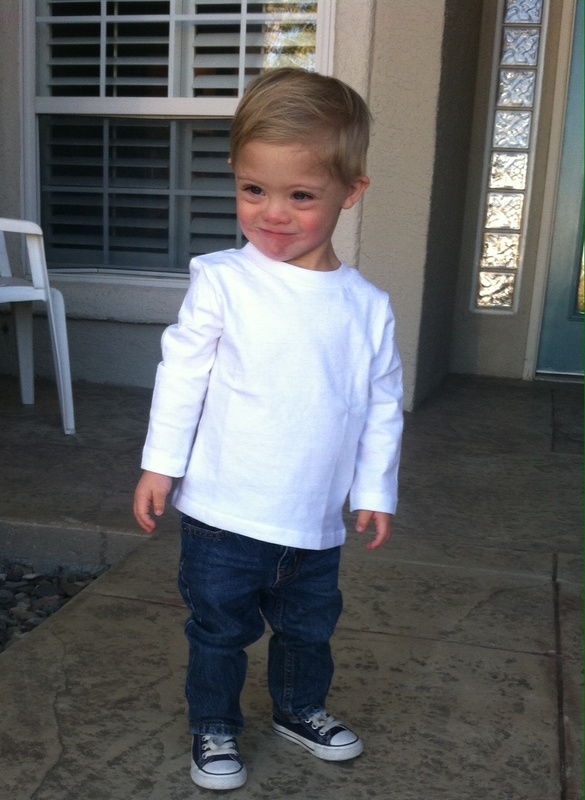 This kid started walking at 18 months and is now 2 1/2. She is absolutely amazing. 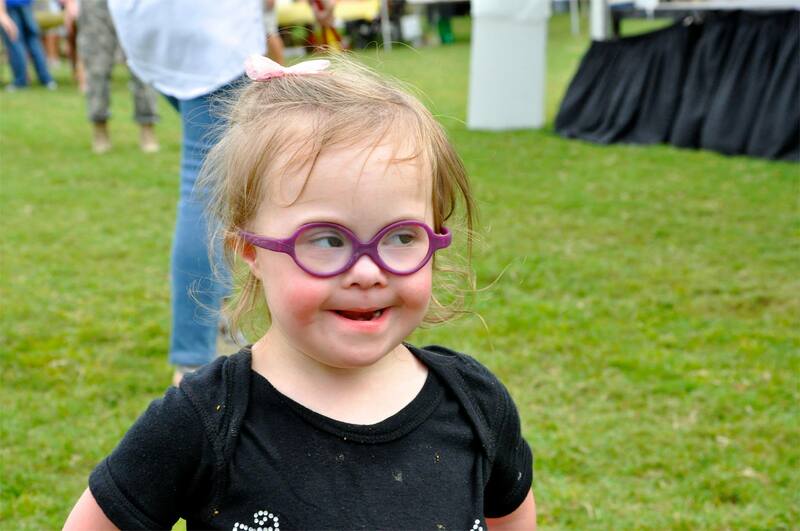 I saw this little angel at the Charleston Buddy walk this past weekend I had to take several pics of her because she just amased me on the stage dancing. She was a ray of sunshine she was just shining so bright. 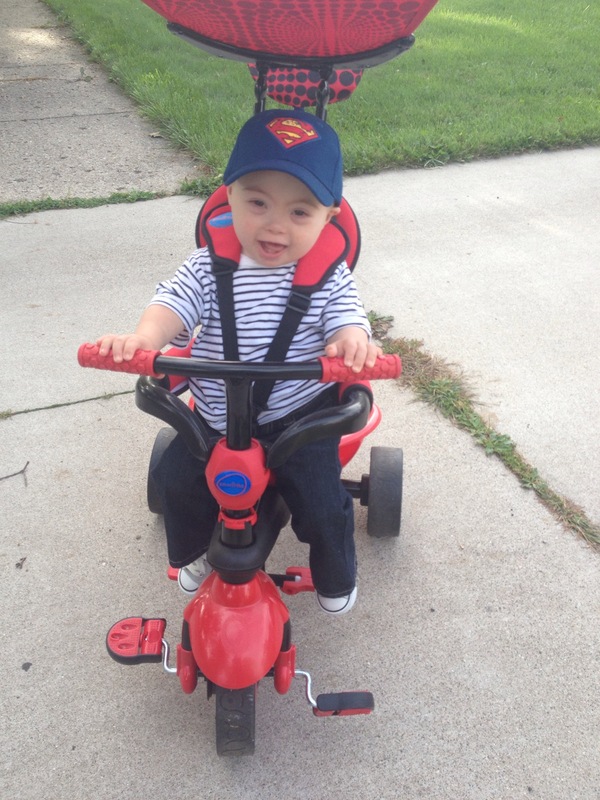 I was recently stopped and asked if my little boy had Down syndrome. I said, “Yes!” The person said, “Well, he’s still beautiful.” I answered with, ” Well, of course he is!” I think some people don’t understand that God created all people and that we are all beautiful, regardless of our skin color, our facial characteristics, our personalities or our abilities! Sorry–Way’s photo didn’t load earlier! Noah, 8 years old. 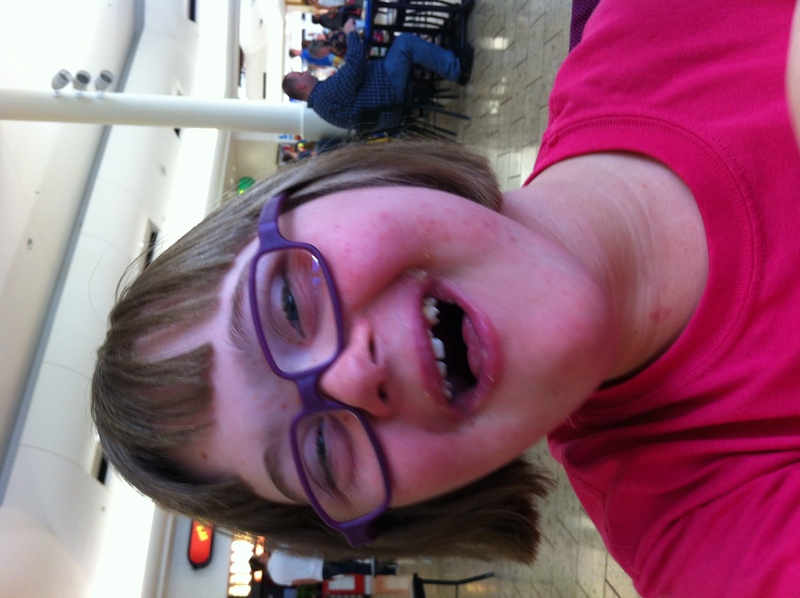 I wish people would understand that people with down syndrome are not always happy. They have the same emotions we all have. 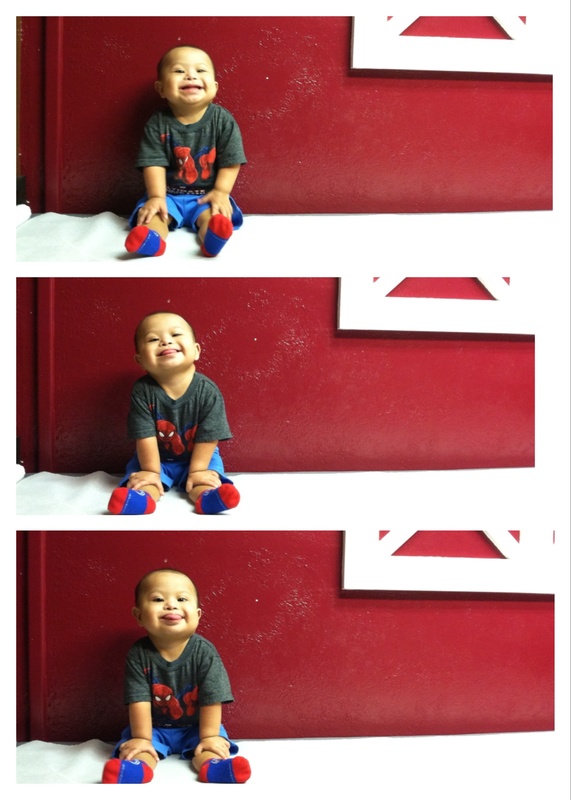 My little Noah is a happy boy but he certainly has his cranky moments too! My son is 3 1/2. His name is Reise. I have been told many times how hard my life must be :(. I love my life, my son is an absolute joy. Yes sometimes it is hard but the good days far out weigh the hard days, It makes us appreciate the little accomplishments!!! Drives me crazy when others compare my little boy to other children, I always say he will get there when he is ready!!! In the past week we have mastered getting into a sitting position all on his own! I love, love, love this! She is a doll. I miss Lauren at that age. She is 14 now. Yes! Yes! Yes! A million times yes! I completely agree with your opinion! Sometimes I feel that I love this miracle child more than anything else! But above all to God, who gave us this happiness! 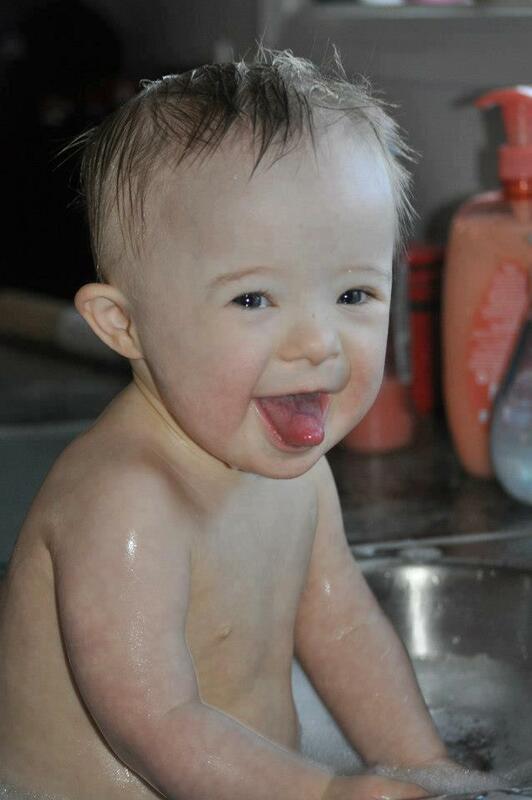 I do NOT like when people thinks that kids with Down syndrome are kids forever. 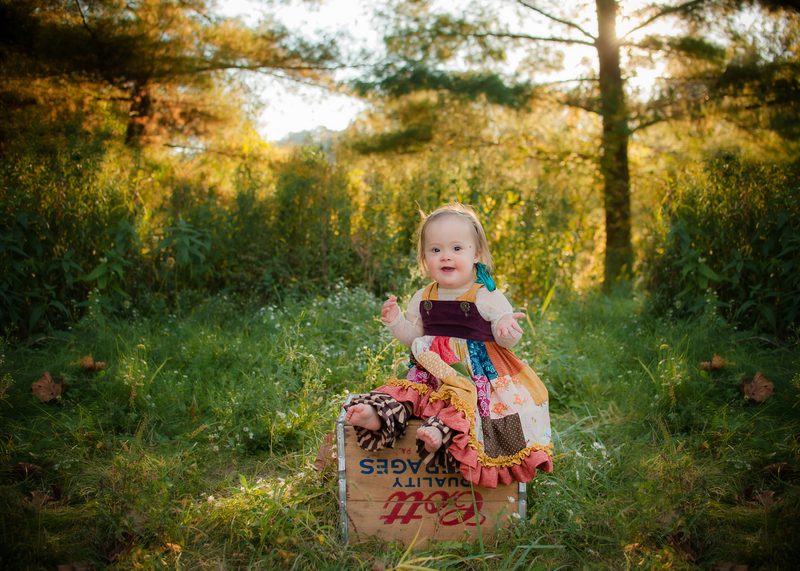 Brynn is my beautiful two year old who also has Down syndrome. 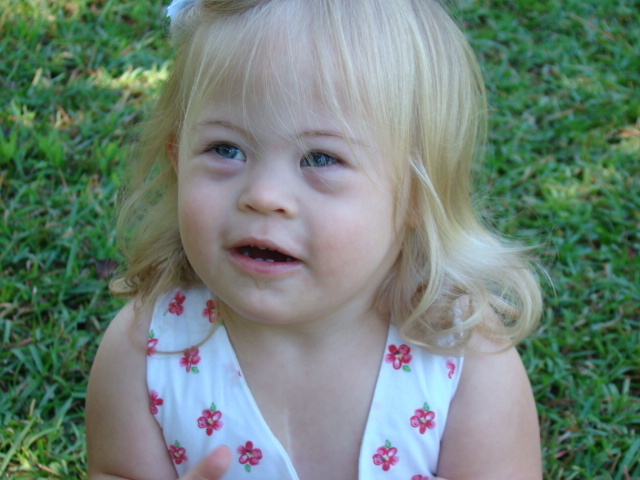 Having Down syndrome guarantees that she has an extra 21st chromosome. That’s it. It does not guarantee that she will be an angel or that she will be stubborn or any of the other sterotypes that are out there. Yes, there is a greater likelihood that she will need additional assistance in a variety of areas, but I am not going to limit her with low expectations. The sky’s the limit for my both my daughters! People don’t understand why I want to throw a ticker tape parade when Caleb meets a milestone. It’s not because I’m surprised he met the milestone—I know he will in his own time. It’s because he’s had to work harder to meet that milestone, however small and insignificant it might be. I never realized how hard it was for differently abled children to accomplish these milestones until my Caleb came along and opened my eyes. He is a blessing and completes our family of six in a way that we had no idea was possible. “They are such sweet & calm children” yeah right! Although Viggo can be sweet but he loves a good challenge. He is active and nowhere near calm. He is your average little dude and gives his 4 yr old brother a run for his money. 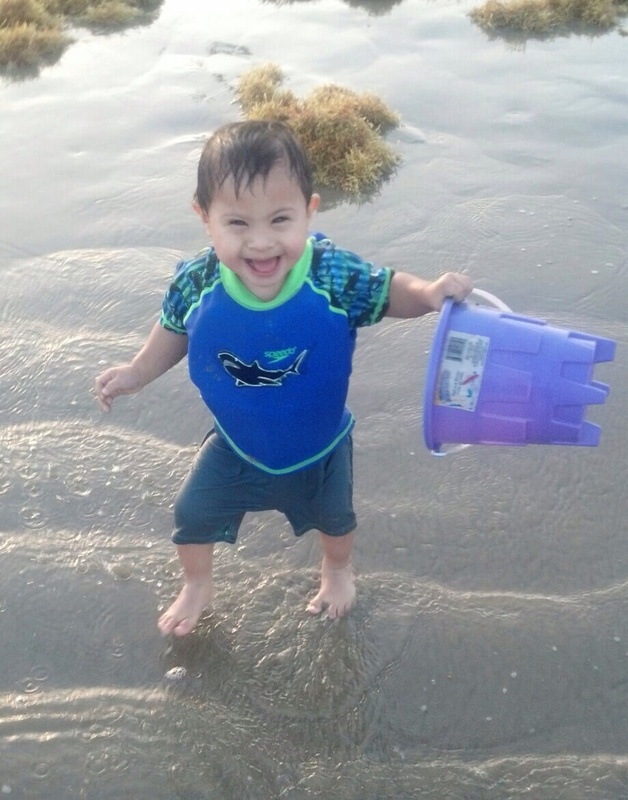 Our Amazing Alec Cruz is 23 months old, and the light of our entire family’s lives. What people don’t understand is that they don’t need to feel sorry for him or for us! 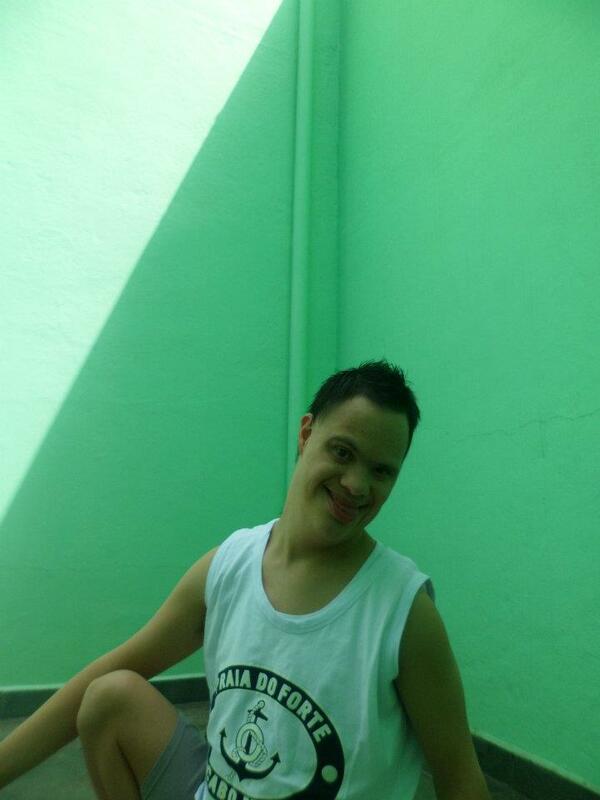 We may mention that he has Down Syndrome, and sometimes the reaction is that they’re sorry–well, WE ARE NOT SORRY! He’s awesome in every way. He was and IS PERFECT for our family! He’s a joy multiplier, and he brightens the day of nearly everyone (some folks aren’t enlightened to his charms) that has a chance to see and interact with him. We’d gladly share him with the world–as he is a gift from God! 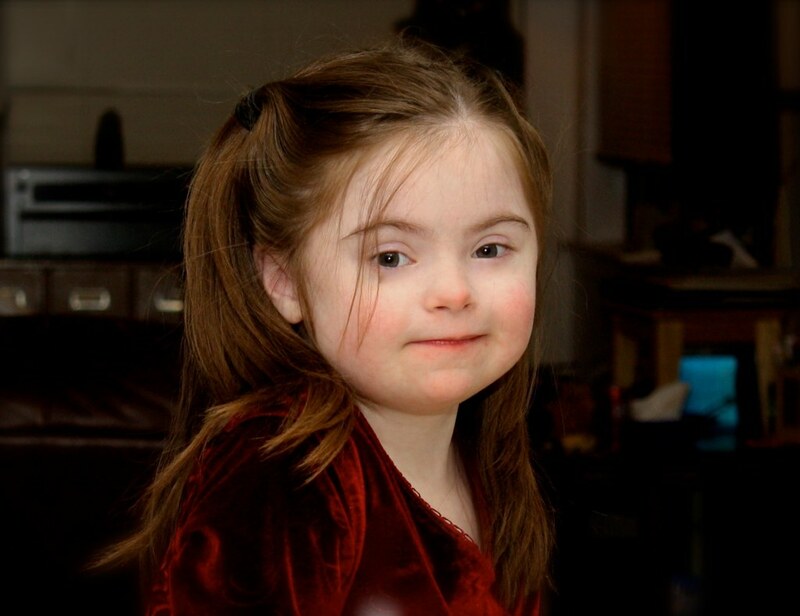 quote: I don’t believe that many people understand exactly how children with Down Syndrome are just like every one else. While it’s true that our sweet children have little something extra special (21st chromosome) they have the same needs to be met when it comes to being loved, supported, and just as importantly, included. There are highs and lows, good times and bad, a lot of love, laughter, crying, cuddling, worries, fears, triumphs, and success. 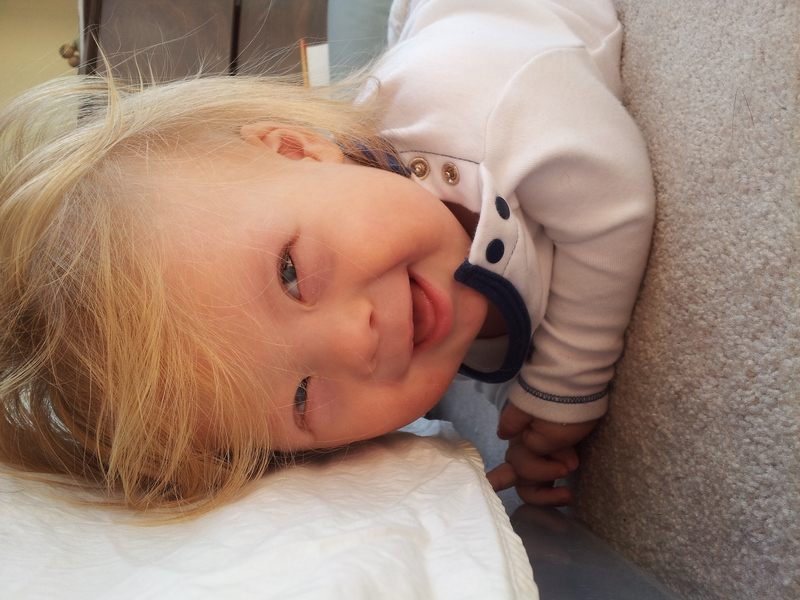 I am privileged to have a child with Down Syndrome, I wouldn’t change a single thing about it! I’m Mattie, 3 1/2 years old. My Quote: Okay I know it’s a silly one but we have been through open heart surgery, 9 sets of ear tubes, tonsillectomy, adenoids removal twice, and Friday a hearing implant. My favorite thing I have seen is from Becky on Glee. This explains my Lauren perfectly! Hey, what I want you to know it Lauren is just like every other teenage girl alive. She wants to live life and have fun. She loves One Direction, the can play the piano, she reads when I make her..HA and she is just sassy! She isn’t always happy and she can be a pain but man, she is simply amazing. 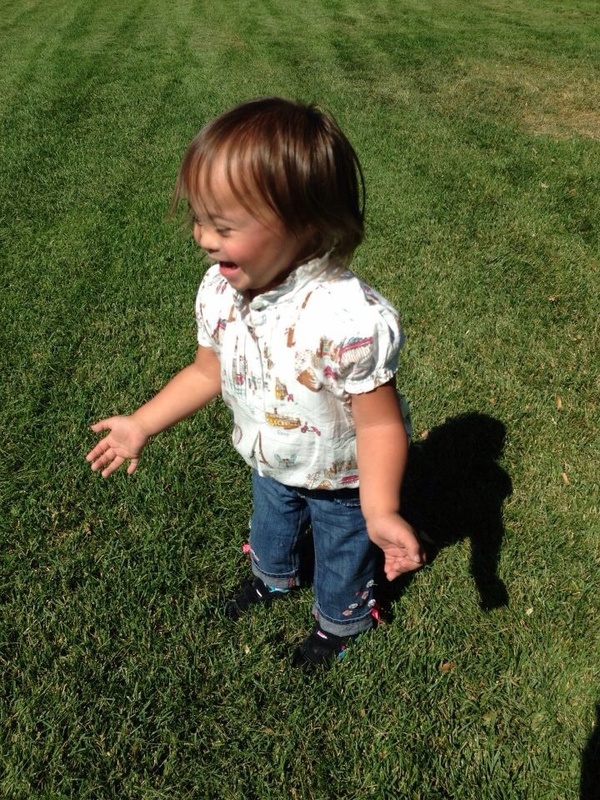 What people don’t understand about down syndrome is that it is Not a burden. 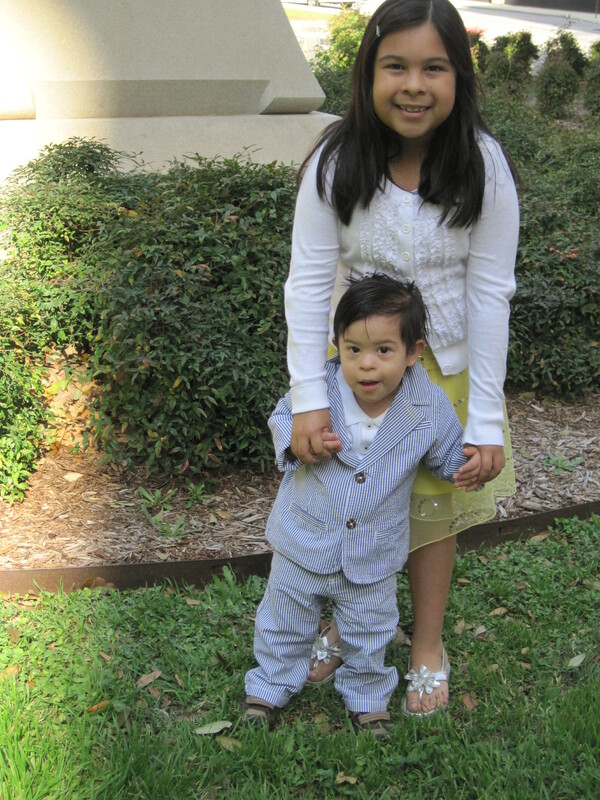 My son was chosen, through adoption. He was chosen and is wanted. He is well loved and we are well blessed. He causes me to love deeper everyday and I am grateful for that gift. 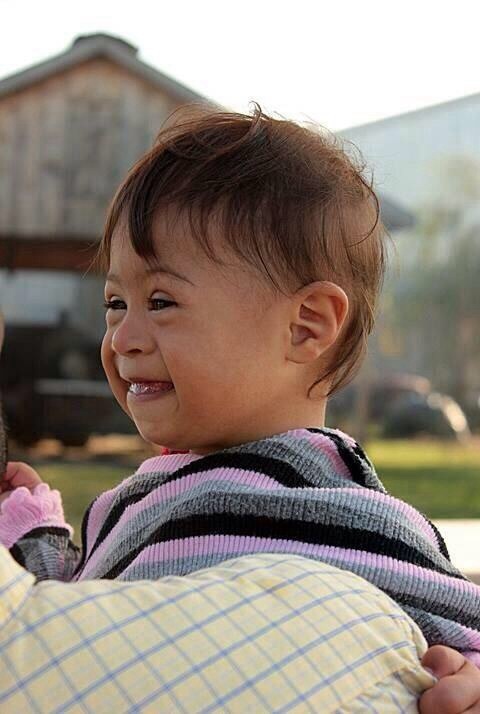 Most people are afraid to ask when they see someone with Downs. They believe there is so much different with them there can’t be anything in common. 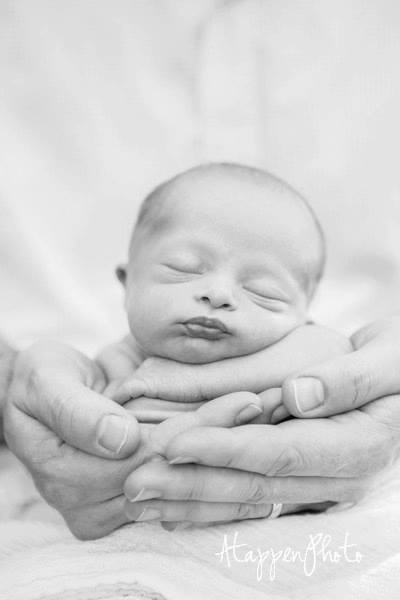 Ryder has taught us, his family , what it means to love so unconditionally your heart overflows wih love. He teaches others that he is his own person, God created him perfectly, there is no one else like him in the world. He will and has done great things for many. Maxwell – 2 1/2 years old. Max has opened up a whole new world for our family and friends. 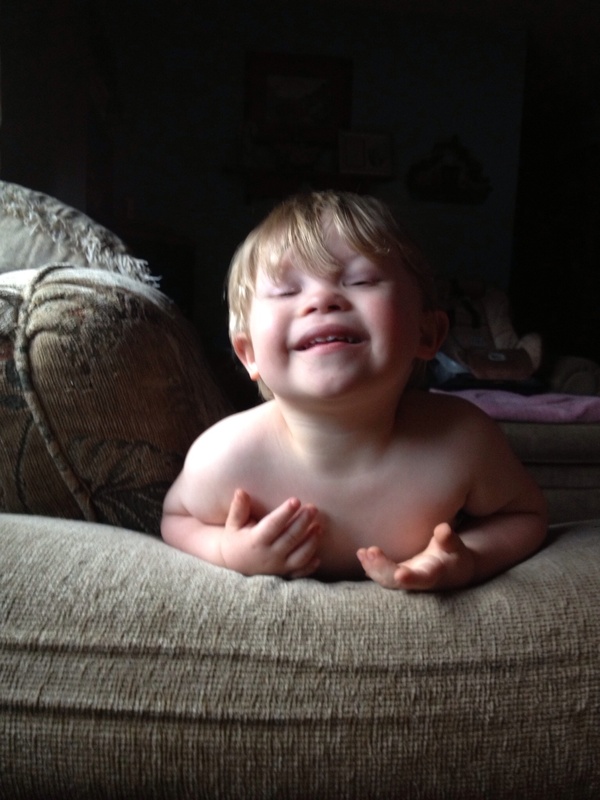 My husband and I are honored to have a child with Down syndrome. 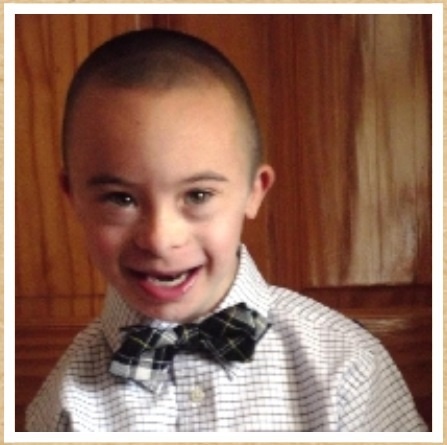 I refuse to limit my son, and will continue to encourage him to live a “typical” child’s life. I have always considered people with Ds and other challenges to be overachievers! The effort it takes to overcome obstacle and achieve their goals is nothing short of inspirational. I have always been taught to focus on my strengths and work on my weaknesses. I don’t expect my son or my daughter to be perfect, but I do expect them to be awesome! People with Ds are wonderful, and once people get acquainted, they become addicted! No goal is impossable. This picture says it all. 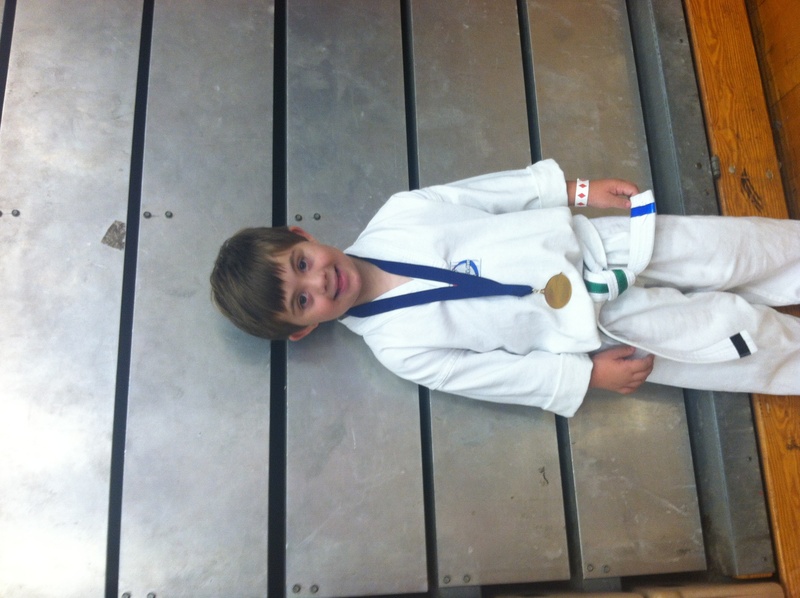 Evan won first place in his first Taekwondo tournament. Yonatan is 3 years old. He is smaller than most children his age and younger (chuckling)… I have learned that it is not about what people don’t get – it is what they don’t know. For example: Down Syndrome is not the same as Autism. They are nothing alike. You can’t confuse one for the other. Something I have had to point out over several times since Yonatan’s birth. They may have different features but so does everybody else.Why not look past their looks and into their hearts. They are human beings. They have the same emotions, feelings, desires as everyone else. My above post did not post the picture so I will try again! Martin, thanks for the comment, but no picture was attached. Ryder was created as a perfect person, God doesn’t make mistakes. Ryder in his 2 yrs of being here has become a teacher, he teaches us that all are created equal, and love us unconditional . Meet Grayson. He is 6 years old. My son is Gavin, he’s 2 years old and is the light in our family of five. What I think people don’t understand is that even with everything he’s gone through medically, and we’ve gone through emotionally, we wouldn’t trade him for the world. You hear parents talking about how afraid they are and how having a child with DS will ruin their life, on the contrary, it made our lives complete!!! My husband, Gavin’s two adoring big sisters and I are all better people for having Gavin in our lives. It’s not an easy road but its an amazing road. My favorite thing about Gavin is his ability to make everybody smile even when he’s throwing a tantrum, yes it does happen, sorry all DS children are not “angles”, he’s just like the rest of us, just without a filter which I find SO refreshing. I love the honesty, joy, love, excitement, pride, determination, smiles, his sweet hugs and kisses and yes even the tantrums that I get from my son because he’s my son and in the end that’s all that matters. I believe in him. I support him. I love him. Enough said. 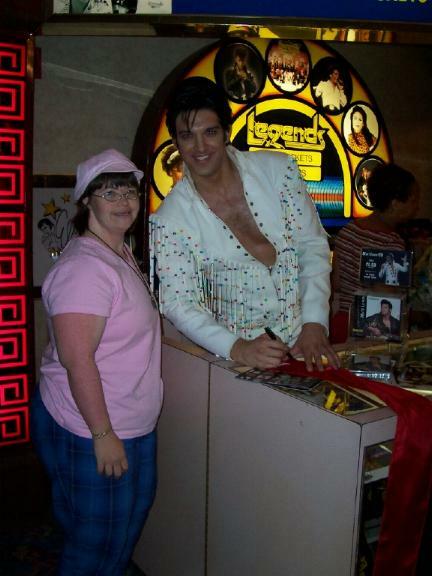 And the pic included is from a Grammie vacation in Albuquerque, NM. 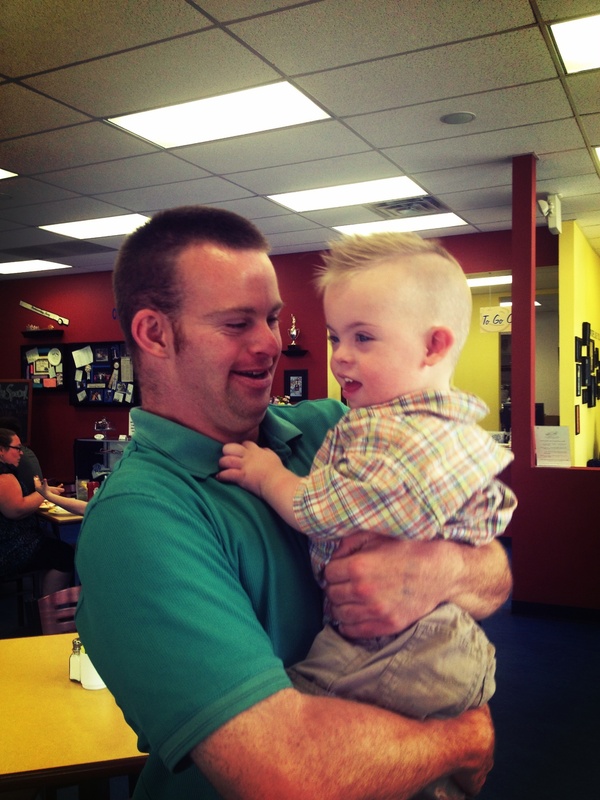 This is Gavin with Tim from the world famous “Tim’s Place”, the only restaurant owned and ran by a man with DS! And I confirm the great free hugs! This is a picture of Travis (20) and his younger Billy (18). 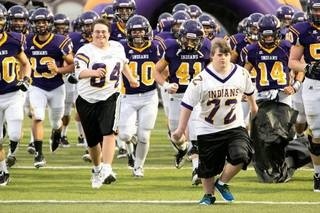 My quote is simple…just because you have Down Syndrome does not mean you cannot be a part of a team! 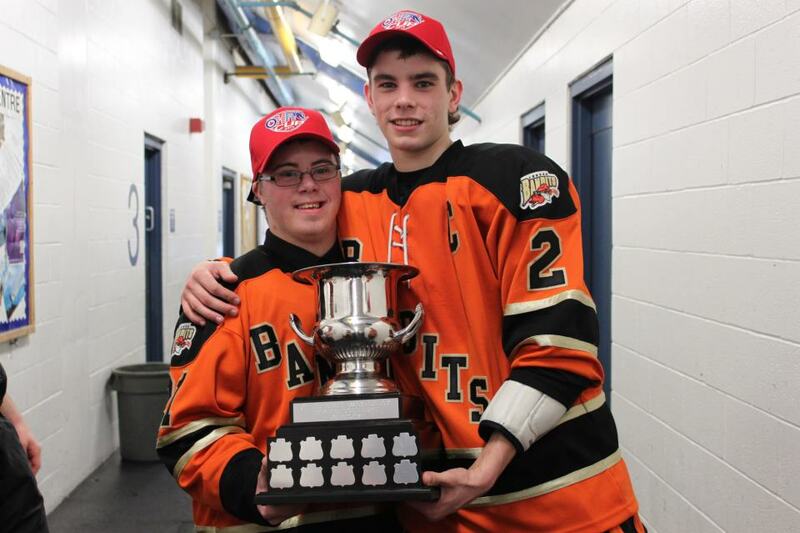 Travis has been a part of his brothers teams his entire life. He is included by the coaches, parents and most importantly, included and respected by his peers. 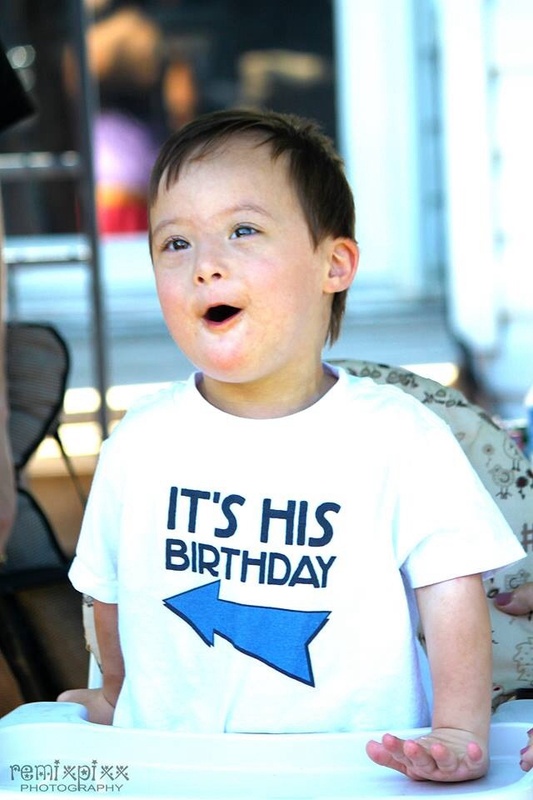 The thing people don’t get about children with Down Syndrome is that it takes them a little bit longer to reach milestones. 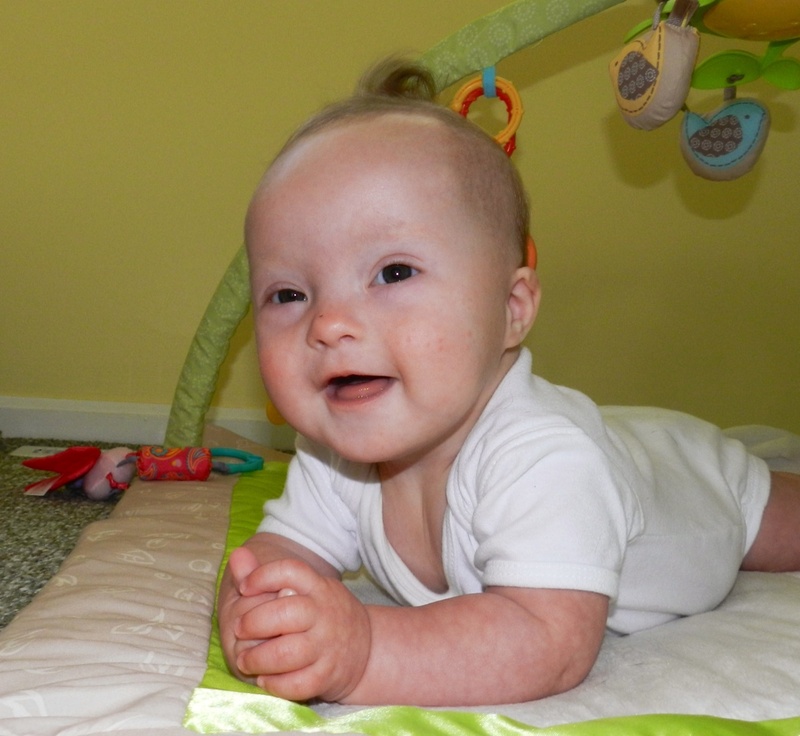 Every child with or without Down Syndrome achieves their goal at their own pace. Some do it earlier than others and then some take a little bit longer. But I garuntee that once they finally achieve that milestone that they were working so hard to accomplish, it is truly the most special and greatest moment ever. Every time Zoey accomplishes something that I have been watching her try so hard to do for so long, I am just so incredibly proud of her. 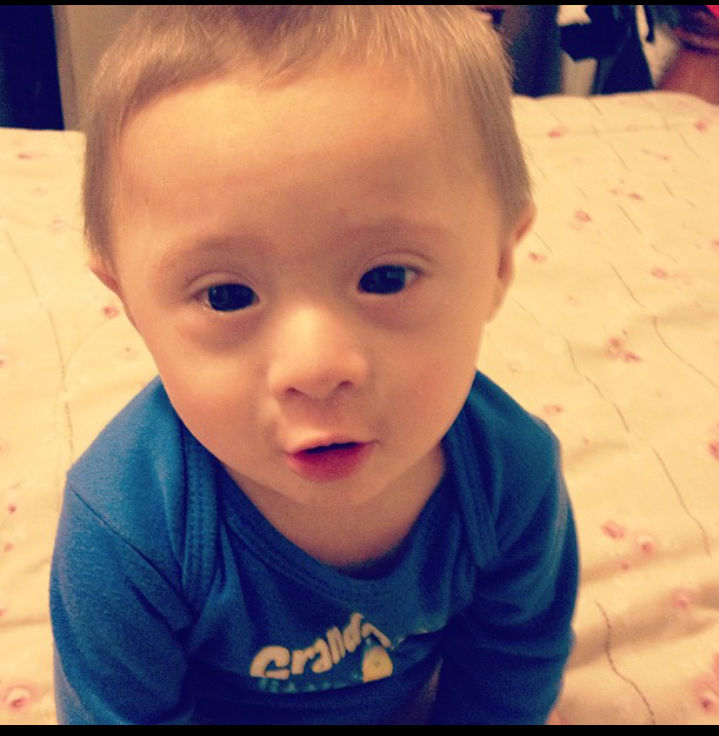 People don’t understand that even thou Marcos has Down Syndrome he still acts like a typical toddler. He discipline the same as we did his big sister at this age. DS doesn’t define him, we define his behavior and abilities. It makes me proud when he behaves better than typical toddlers. This is Hannah she is 5 years old. 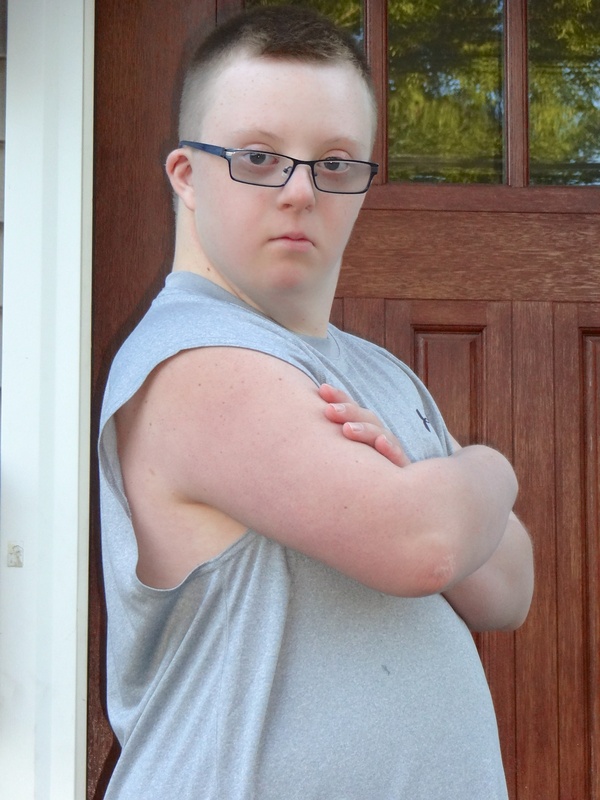 Don’t ever underestimate an individual with Down Syndrome. They are more tenacious to accomplish life’s goals. ” Doubt me and I’ll prove that I can”. This has always stuck in my mind when it comes to my Hannah. She may be stubborn but she is determined to do what any other child can do, and she will. I’m proud to be her Mother. 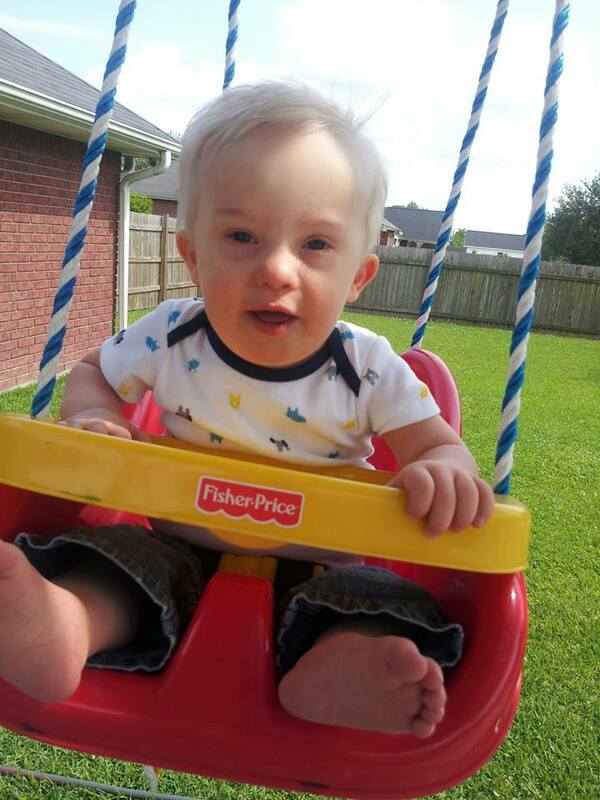 The triplication of the 21st chromosome contains less than 1% of Mack’s genetic instructions. It should not determine 99% of his life and doesn’t drive his capabilities. 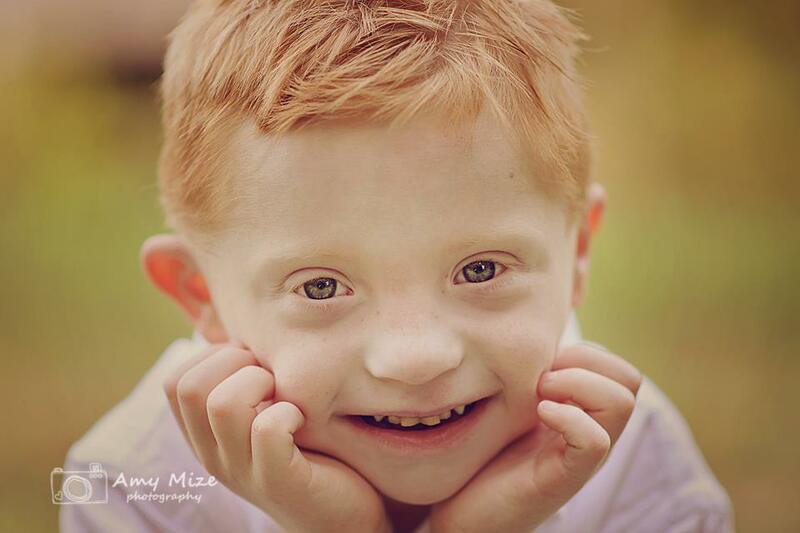 That extra chromosome absolutely does not mean a lifetime of misery and disappointment. To the contrary! Mack is changing lives and minds on a daily basis. Oh, and his hair? Truly epic! Oh… and… Meet Mack. He is 7 months old. And thinks that Mary (about 20 pics up above) is the bomb. They are complex people. They have the ability to learn emotional intelligence. They have many different interests, as they grow their world becomes larger and their interests evolve. 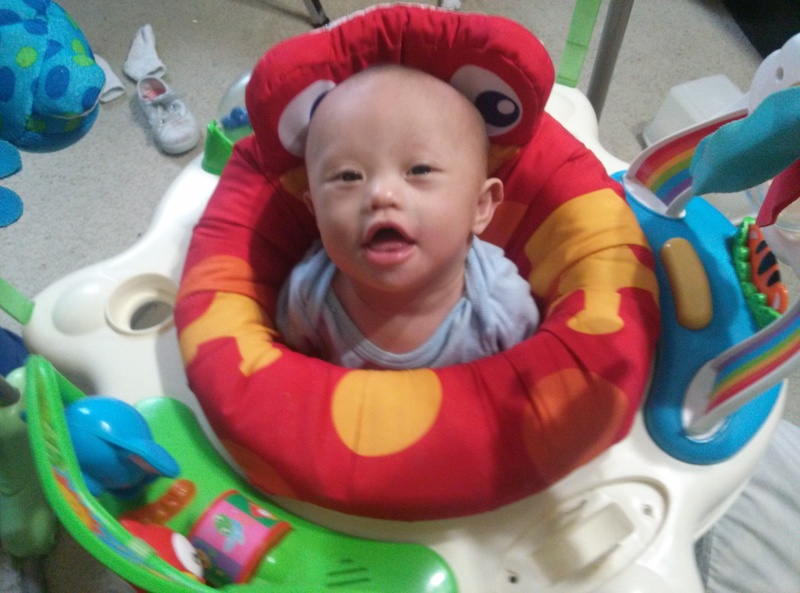 My son is almost 5months and was born with down syndrome he is the sweetest happiest baby ever he just had open heart surgery and has had 2 other surgeries and is still the happy smiling baby he’s always been one thing I think people should realize is just because children with down syndrome have similar facial features does not make them the same Inside they have feelings just like any child and different personalities and likes and dislikes I want people to look past this is realize THEY ARE PEOPLE TOO!! All children deserve a change and to be treated the same and given love!!! This is my son Ronan and he is 4 years old. What people don’t get about kids with Down Syndrome is they dream the same as everyone else and their potential to fulfill their dreams in limitless. This is Kealani, age 15 months. 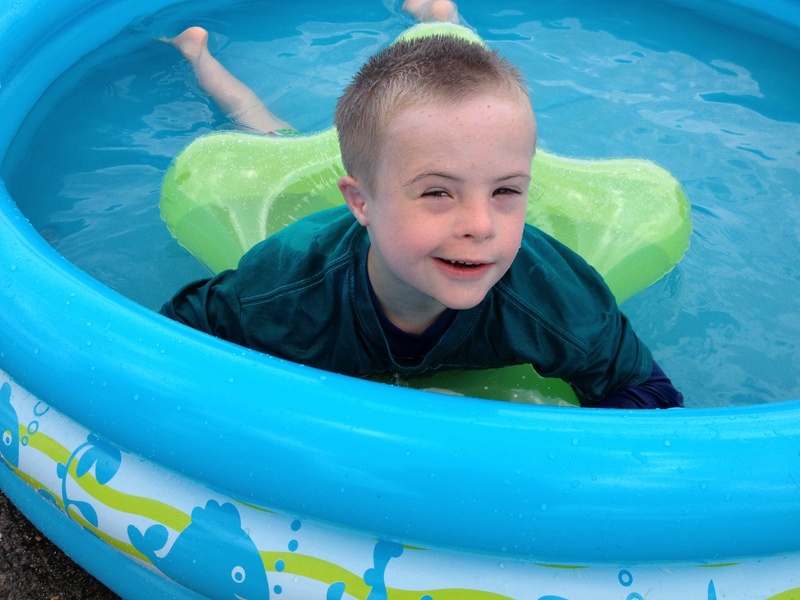 I think one of the things that people don’t understand about children with Down Syndrome is that they often can’t drink liquids the way most typical children do. Kealani has to have a thickener put into her milk so traveling can sometimes be difficult since she just can’t have a sip of whatever I am having. Her big brother calls it her “special smoothie”. My guy is Cameron, he is now 12 years old and he has 2 older brothers who most of the time adore him. They are brothers and he is the youngest and no so called “disability” is going to stop them from yelling at him when he “borrows” their stuff, or pick on him when he is near, or tease him when he does something silly, or antagonize him when he is sitting quietly, or elbow him under the table, or hug him when he’s scared, or help him with his homework, or help him up when he falls. 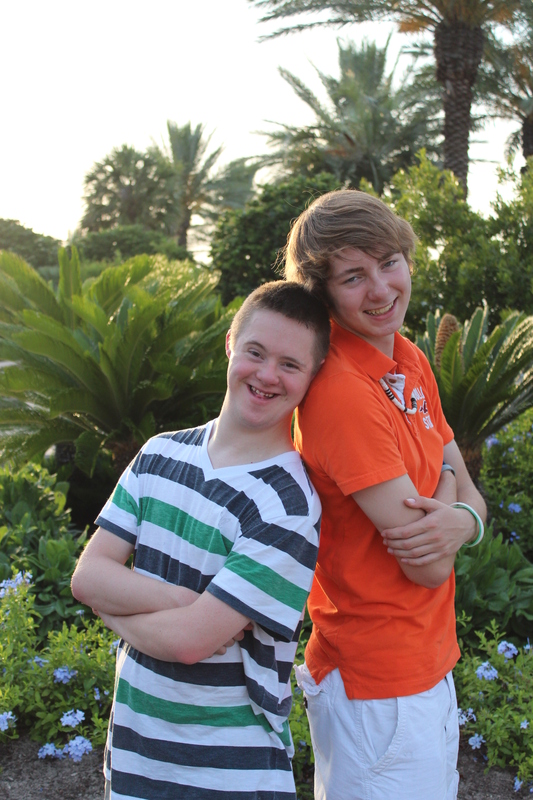 They are brothers and he is the youngest, there is no “disability” in this family. He is crazy, he is silly, and he loves to dance and sing. He loves his friends and family with his whole heart and you will never be the same after you meet him, I sure wasnt. I have had the best time helping him become a great little man and some day, he will be a great man, and we will all be by his side. We are better for knowing him and loving him, and being loved by him. This is my son Ronan and he is 4 years old. This goes with the previous picture I posted. I wasn’t sure if it had to be a picture where you fully see his face so here’s another. Again my quote was :What people don’t realize about kids with Down Syndrome is they dream just like everyone else and their potential to fulfill their dreams is limitless. But I am so much more than what they see. Keaton is almost 29 months old. 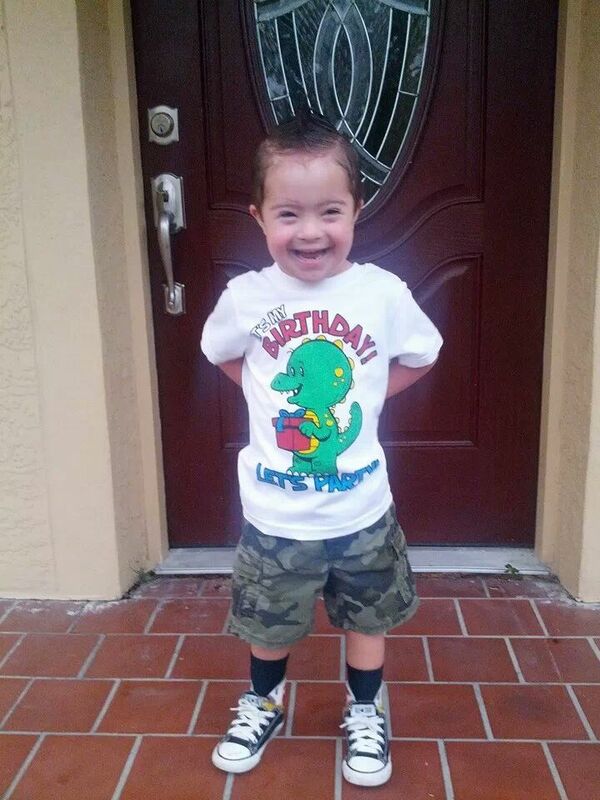 People need to know that kids with Down syndrome are just that…kids with Down syndrome. They aren’t Down syndrome kids. 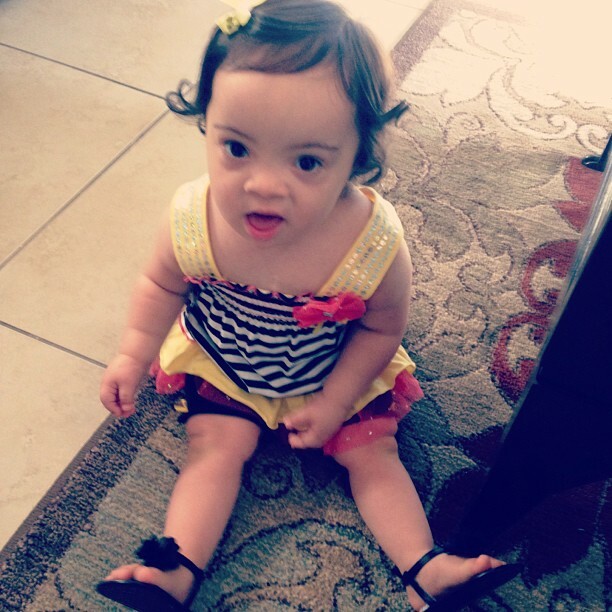 Down syndrome isn’t who they are or what defines them. They are kids before they are Down syndrome. The diagnosis is terrifying and devastating – anyone who tells you their INITIAL reaction is different isnt being honest. This is my 12 year old daughter Miyah. What people don’t get about individuals with Down Syndrome is that they are 100% capable of learning academically just like any other person! With the right tools and dedication of her teacher Mrs. Brown my daughter is now reading! 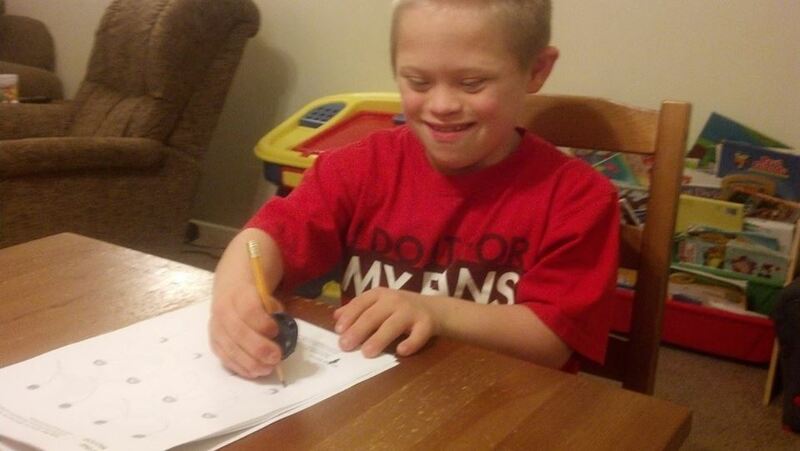 People don’t seem to realize how smart kids with Down syndrome are. My son is VERY intelligent, even though he can’t express it as well as a typical child his age. People ask if he will talk, but they just need to listen and observe him and they will know that he “talks”. My daughter Evie is 3 and is a ray of sunshine in our lives. 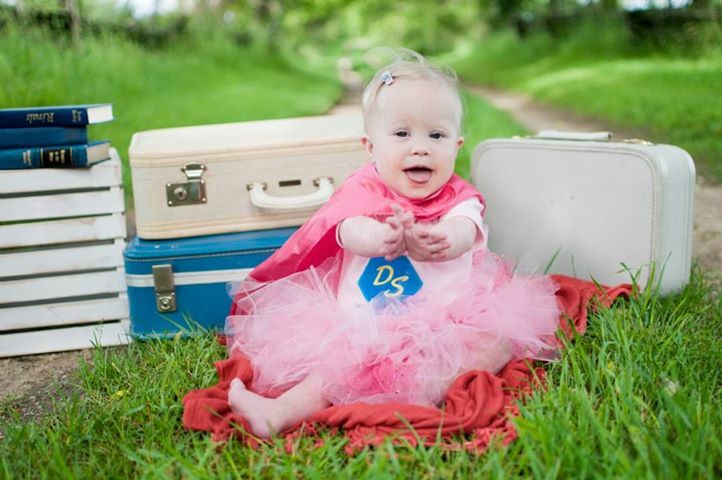 People have no idea how intelligent and perceptive children with Down Syndrome are. Evie has always blown us away with her independent spirit, One of the first words she ever uttered was “Self!! !” and she meant it. And Lord help me, she still does. There are no limits to her achievements, I watch her determined little face and I am in awe. She has climbed more mountains in her little life than most people and I am so happy that I was chosen to see her climb many more. Our daughter, Laura, is 14. What people don’t get about those blessed with the extra chromosome is that they have feelings, wants & needs just like anybody else. They want to be talked to & included. They want to be a helper, be independent & do the things their brothers & sisters do. Most of all, their life is just as valuable & worthy as anyone else’s! This is Kayla, our favorite Valentine. She is 3 years old. 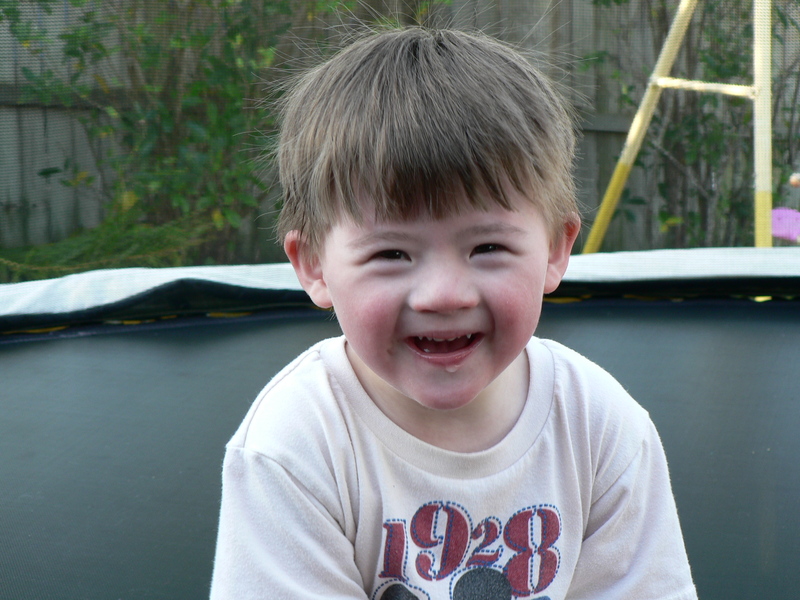 What people don’t get about kids with Down syndrome is that they are more alike than different. They are all the best parts and pure emotion and reaction. 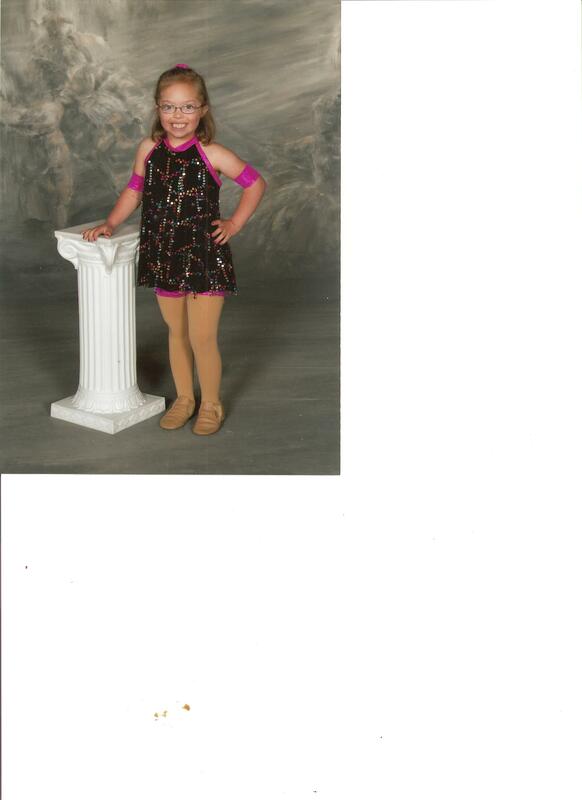 Kayla is funny, sympathetic, opinionated, caring and a bossy little diva all in one. The only things that will limit what is possible for her to do in this life are the attitudes of those around her. She is perfect exactly as who she is and we feel so lucky and blessed to have her in our family! My precious grandson’s name is Samuel. He is 17 months old. Samuel has had a hard time since he was born. At 2 days old he had duodenal atresia surgery. 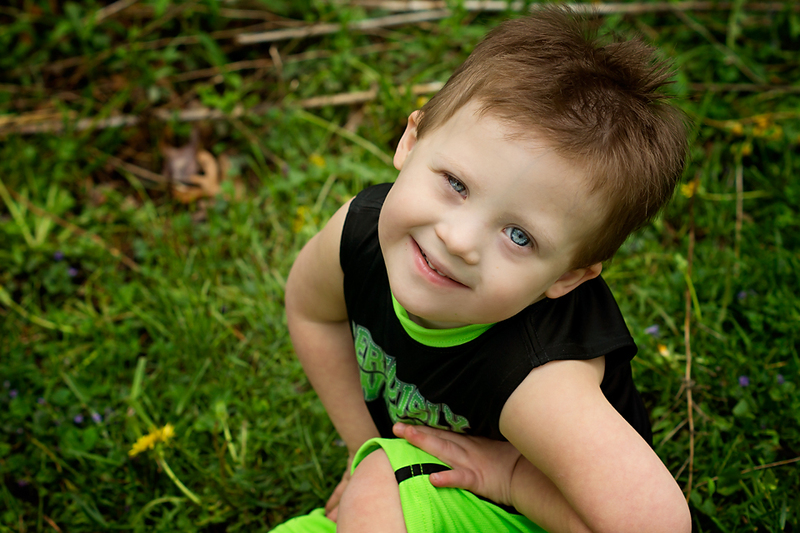 At 2 1/2 months he had open heart surgery for the av defect plus 2 more holes in the upper chamber of his heart. His tissue was not strong enough to hold the stitches so the doctors put a pulmonary band around his pulmonary artery to help with the back flow of blood in his lungs. He stayed in the UAB nic unit for 5 1/2 months. On June 26, 2013 he had another open heart surgery. The same one with his heart defects. This surgery did not work either. He is having another surgery to try again in the near future. Also Samuel weighs 13lbs 13ozs now. He has a hard time keeping his milk down because of his reflux. 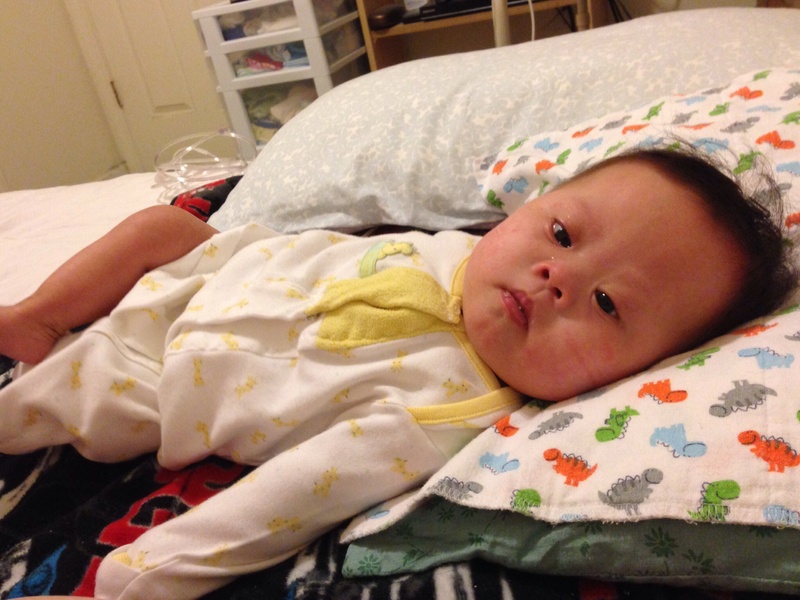 Samuel is a little fighter with all of his major health problems. 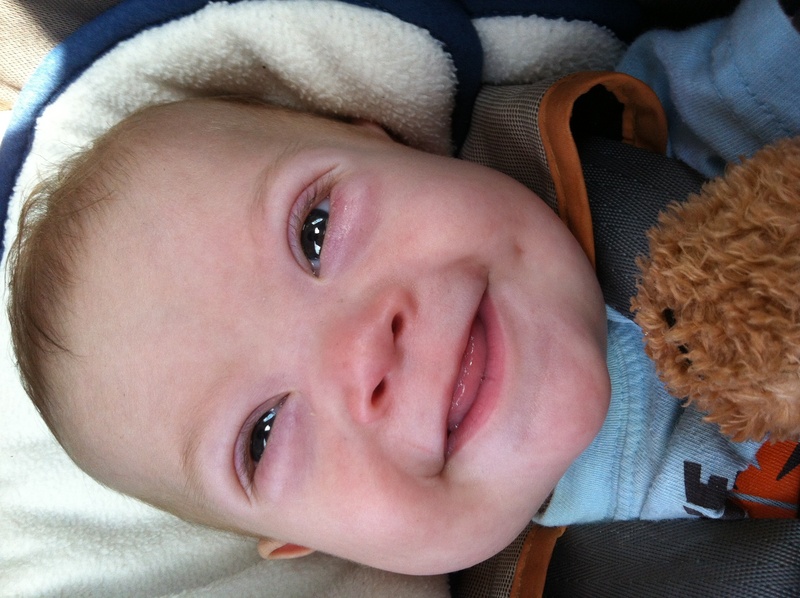 He is such a happy baby even with these defects. The problem that I encounter with family and friends is the question are you (meaning parents and me) not feeding him. 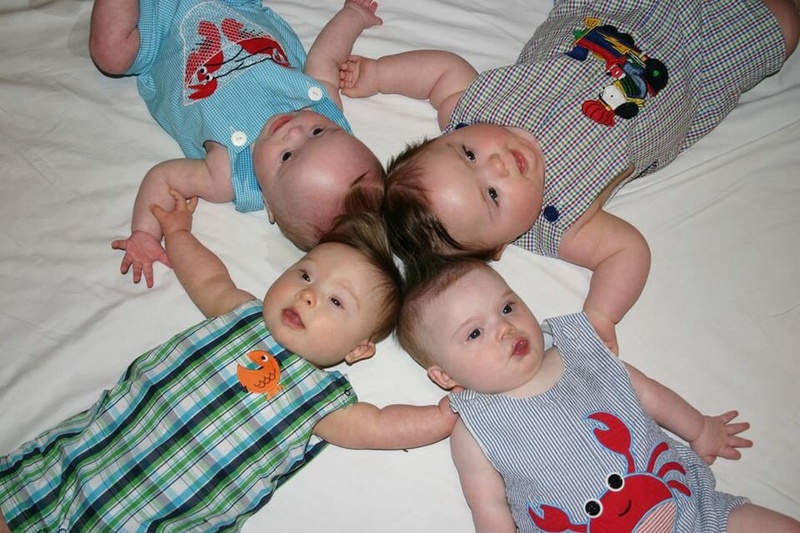 I have explained to them that ds babies do not have the muscle tone that normal babies have. It is hard for them to learn to chew and swallow their food plus sitting alone. I think he is doing great for all the major health problems he has. Samuel is on his on time schedule. This only teaches us to have patience and enjoy the extra time we have to spend with him while other healthy babies grow up so fast. 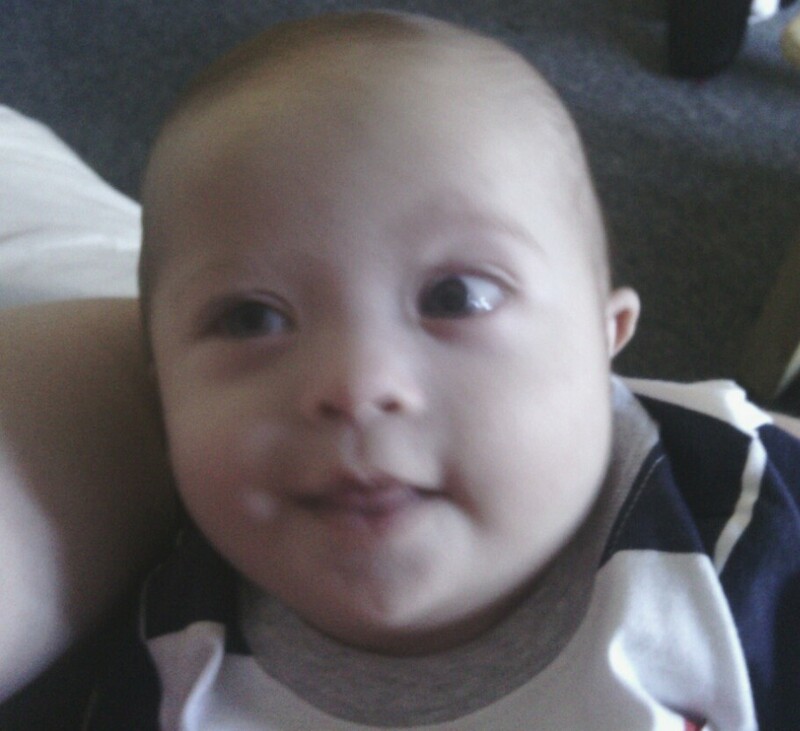 God only gives especial children to special parents that can handle the ups and downs of these sweet special angels. I know I would not trade that sweet smile of his for the world. I pray that God will heal him to be a healthy little boy. My faith and trust in God is all that I have to see us through each day. For we know, Samuel is of God. Lilly has a love for life like no other! 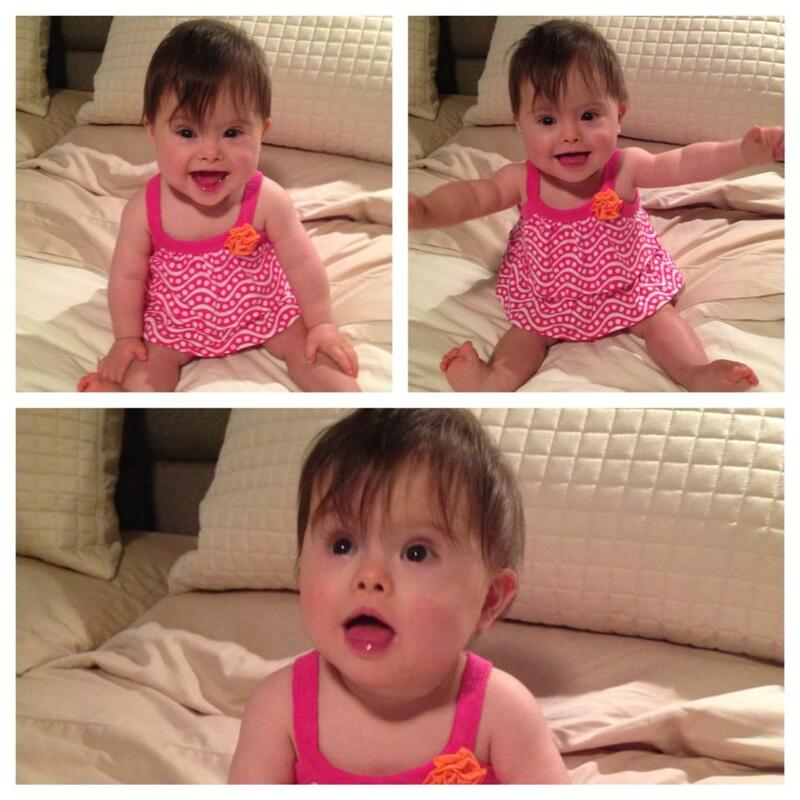 She breaks all the rules of down syndrome, because there are no rules! These kids are all unique and individuals, as similar as they are different to ‘typical’ children. Lilly has inspired me everyday by watching her steady perseverance through everything from medical issues, to trying with all her might to learn how to jump! She is a loyal and loving sister and one of the two greatest joys of my life! Not sure why this picture didn’t post earlier…. The funniest things I hear that people don’t get or don’t know is 1. Kids with Downs are soooo happy. Really? Have you met my daughter? She can throw a fit with the best of the best out there. 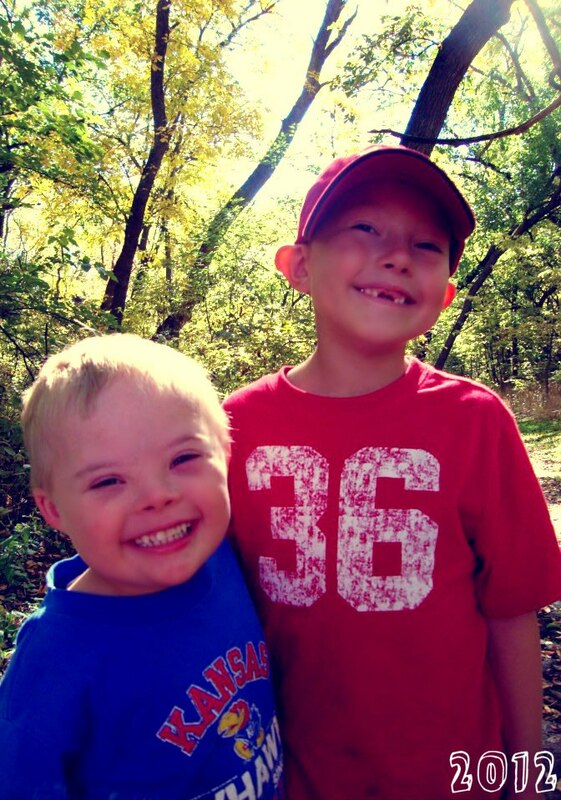 2nd Kids with Down syndrome are all Stubborn. Once again Really???? Maybe they are stubborn because their mom and dad are both stubborn did that ever occur to anyone? lol All kids can be stubborn and yes Lexi has the best of her mom and dads stubbornness! Here is a picture of my diva Lexi! 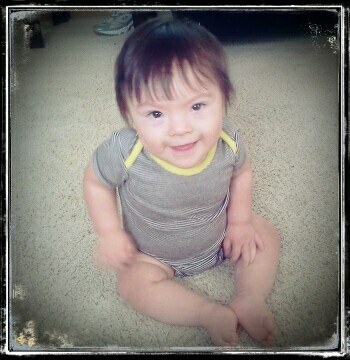 What people don’t realize about about Down Syndrome is that my baby is no different from any other baby!!!! 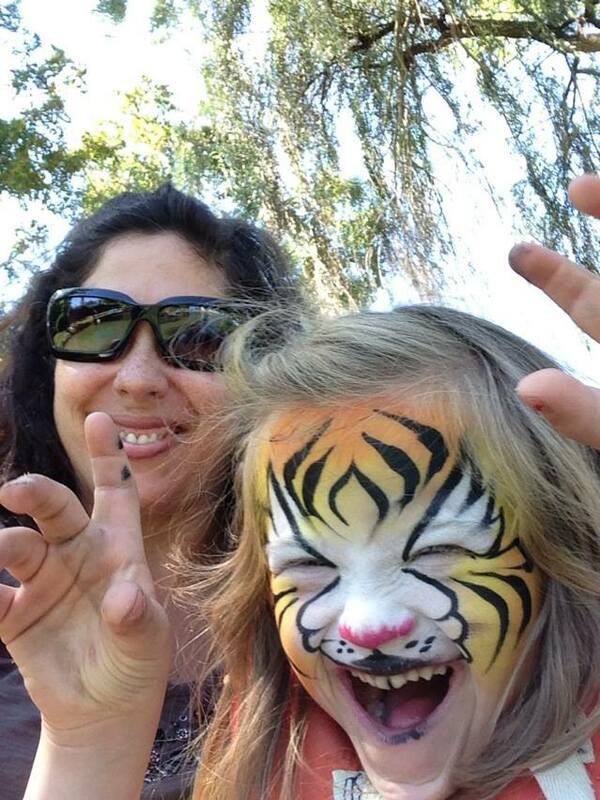 She does everything any baby does….maybe just a little slower….no matter what we love her to the moon and back!!!! 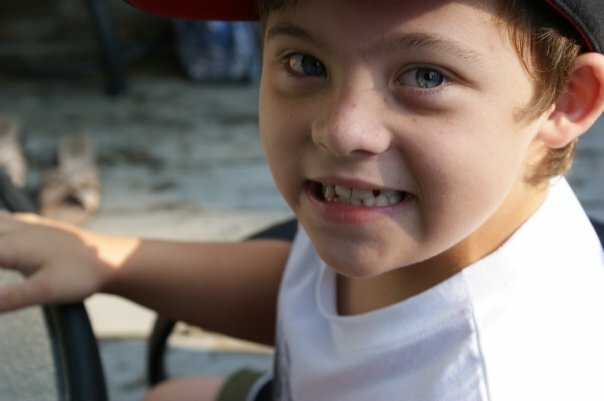 This is Jordan when he was 5 years old. He has added a lot of joy to our family! Jordan has helped us see life in a whole new perspective. If only everyone could take the time to get to know him like we do! He may not have a lot of words, but he definitely gets his point across. Sometimes when people don’t understand what he is saying, they assume he doesn’t understand what they say. Which is far from the truth. Our sunshine. 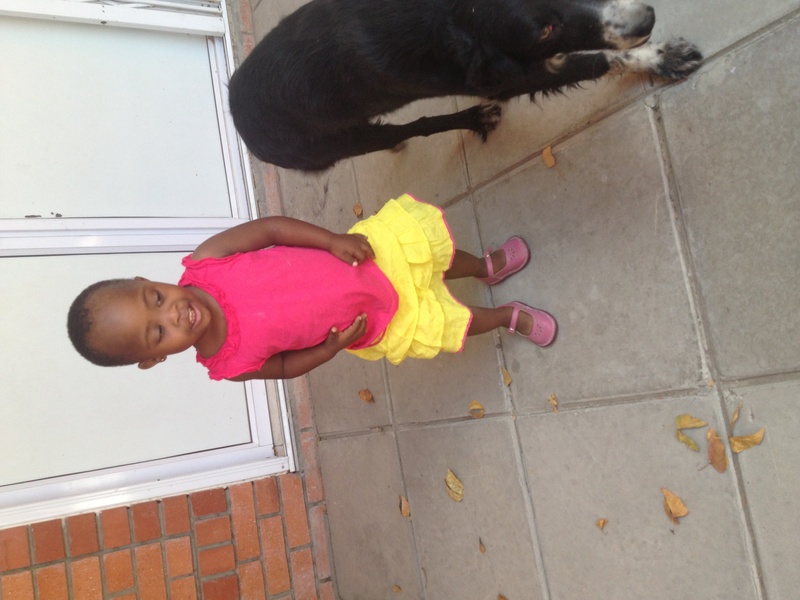 She is 2 yrs 10 months. Turning 3 in November 23. 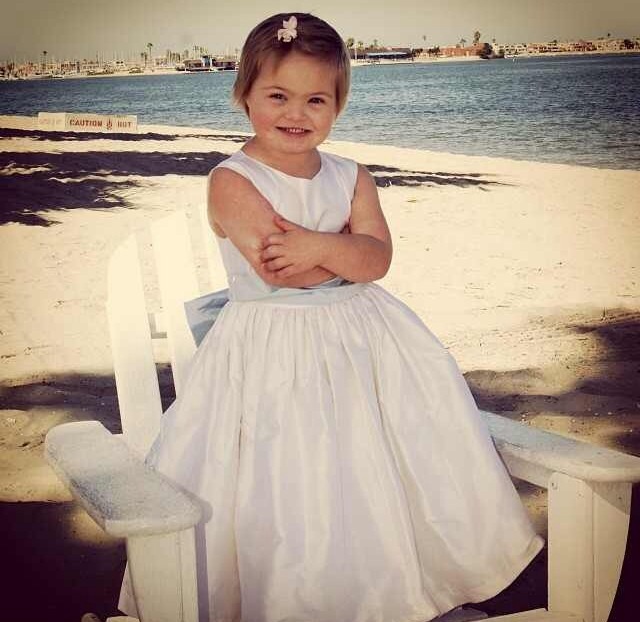 Her name is Chloe she is 3 years old and she is a recent Leukemia survivor!! Porter is 19 months old and to celebrate the month of October, I’m doing a post a day on Instagram with a daily insight into what we’ve learned since welcoming Porter into our family (mammat10). 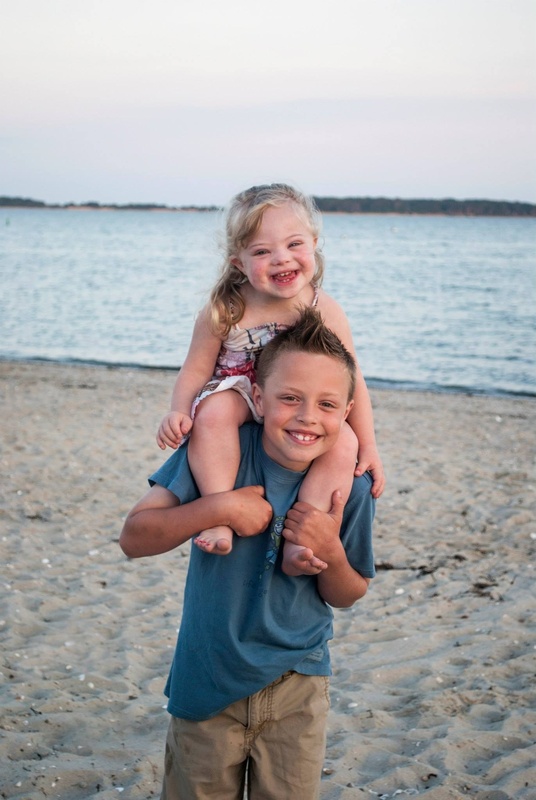 I’ve posted about his amazing bond with his sister, about how he learns in clusters, about how it feels to be stared at and about how the R-word hurts. Our friends have been amazingly receptive! We’re not doing this alone, but we hope together to change the world! This is Mason, he is 18 months old. He is the 4th and final child of our family. He has changed the whole dynamic of our family- we have slowed down and enjoy each other more. We realize that love and acceptance is more important than anything. My quote that our local DS chapter uses that I love is that “we are more alike than different”. Amen to that!! Love love love this community we have been welcomed into!! 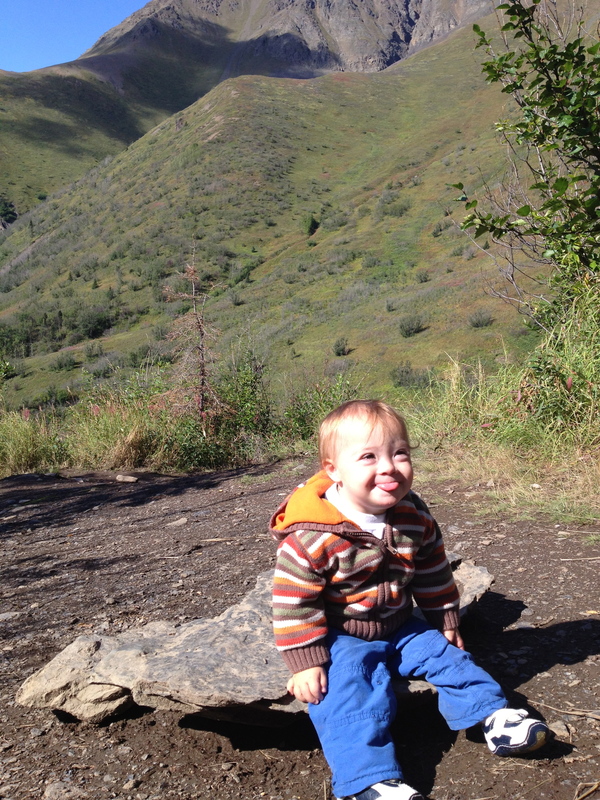 Our son Kellan is two and a half years old and is the apple of his teacher’s eye. We are fortunate enough to have him enrolled in the Rise School of Huntsville where he is thriving and striving as any other child would. Having treated him no differently than our “typical” nine year old, he does things no differently than any other toddler. Inclusion and advocacy is the key, not acceptance…INCLUSION and ADVOCACY. He goes to the store with us, goes to the movies with us, and even goes to the golf course (as pictured) with me. Treating a child like a child is what makes the difference in his and our lives. He is a part of anything and everything we do and having our family treat him like all other children has allowed him to be the toddler and person he is today! 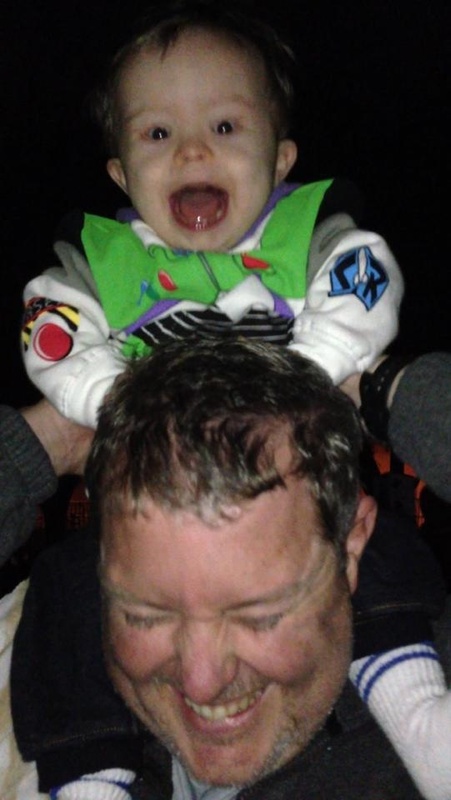 actually, Greyson has his moments, he is quite a normal little kid. He just has this natural exceptional ability to see things in a unique way, and once you catch on to seeing things from his eyes, life is amazing. and I must say Noahs dad, you have a big job on your hands, i read every story (short) and could relate to all. 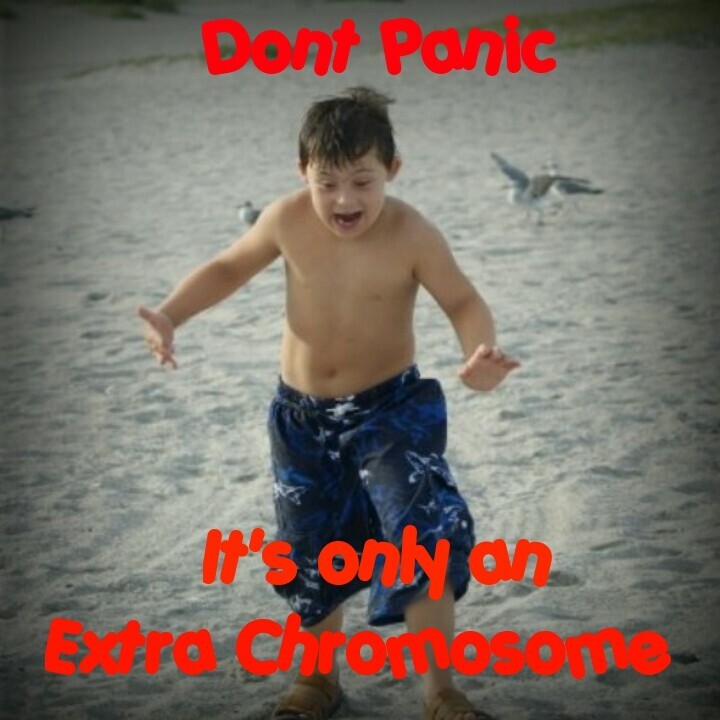 Our kids are the “same” as they all have the extra 21st chromosome, and they are all individuals, every single one of them. How in the world are you going to chose but a few? Love reading about Noah. 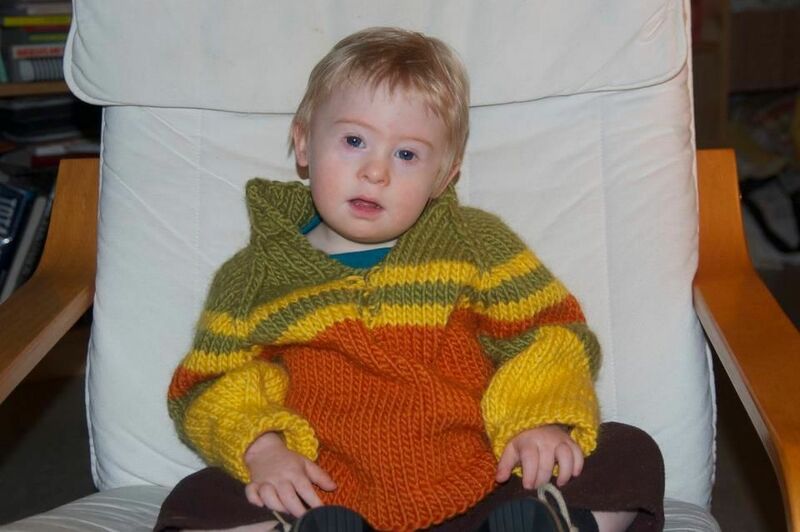 At 2 1/2 years Willie has touched so many, he has reached his milestones just at a slower pace. 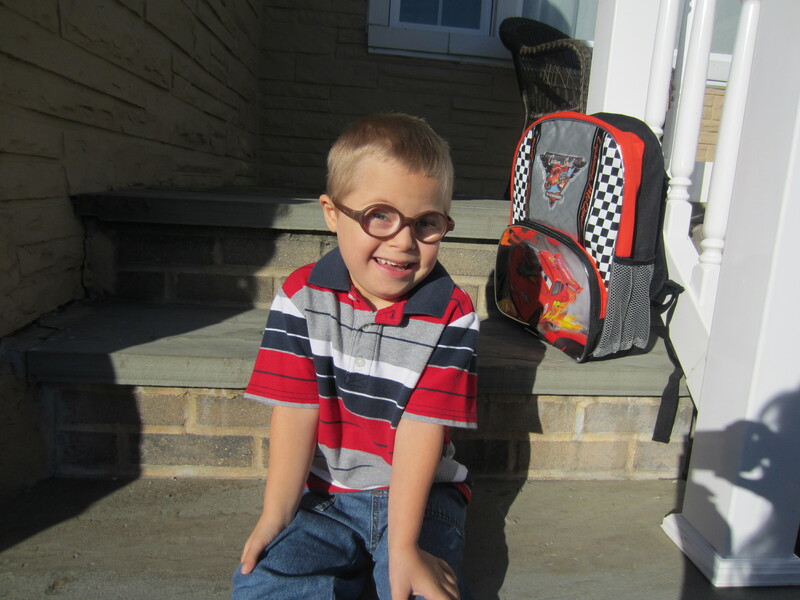 Willie wows us everyday with his ability to love unconditionally and his ability to learn new tasks. One of the things that I have seen with a Downs Sndrome child is they can make the grumpiest person smile. 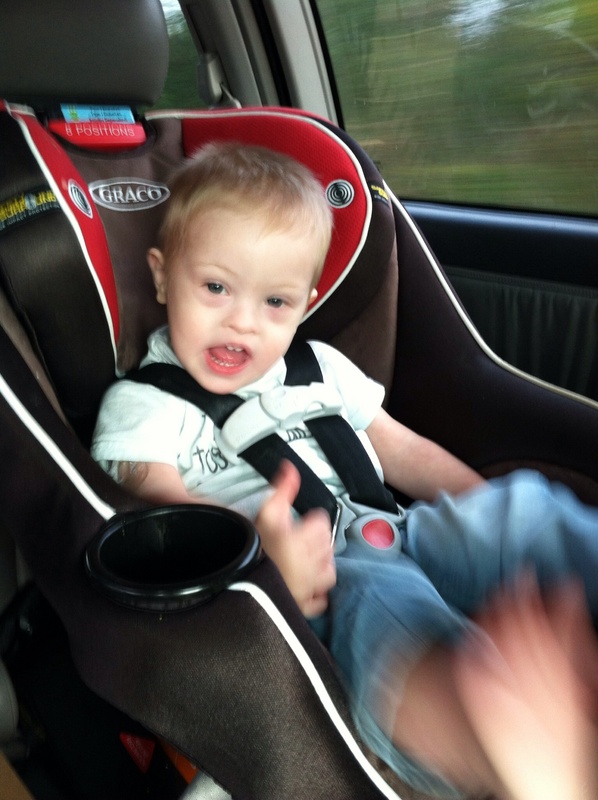 Liam is 34 months old, he will be 3 on December 1st! One thing that people should know about kids with Down Syndrome is they have they have the same potential as typical kids and should never be underestimated! Liam is so much like is three older brother and his older sister, that I never expect anything less of him than I did of them, and he always exceeds my expectations! 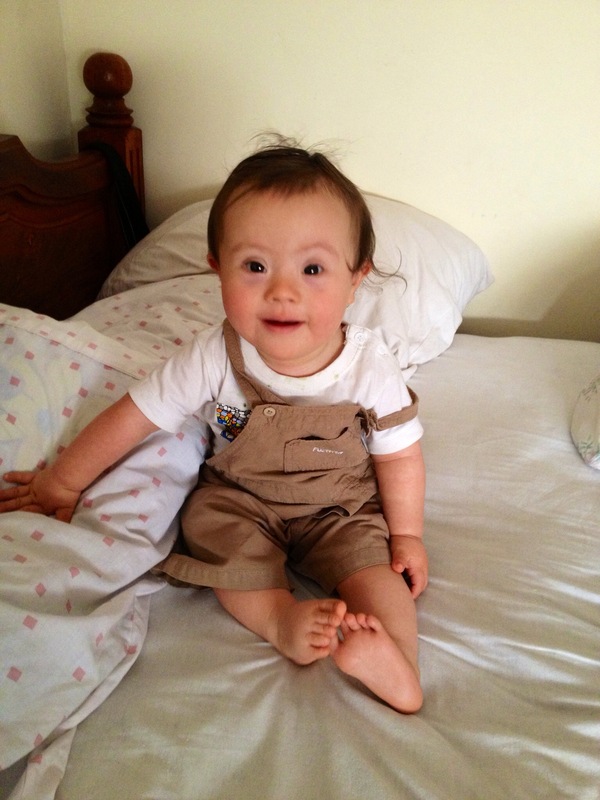 We really don’t know what it’s like not to have a child with Down Syndrome. William is who he is. The “extra” things we do for him is our normal. He is a part of our family. 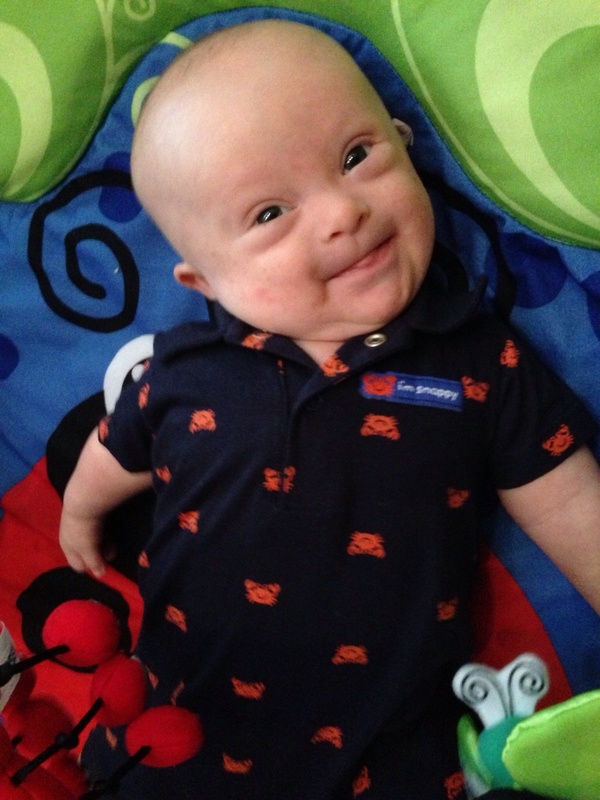 And our goal is to never let Down Syndrome define our family. 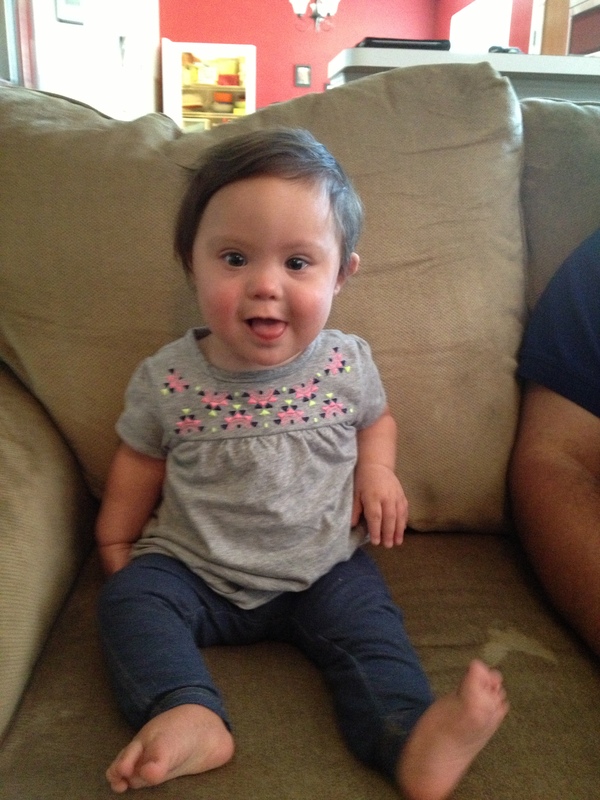 We are a family who happens to have a child with Down Syndrome. My son’s name is Parker he will be 2 years old on Halloween. He is such a happy baby! I don’t have a quote but I do want to say that my boy is just like any other toddler. He has the same needs and wants as they do. 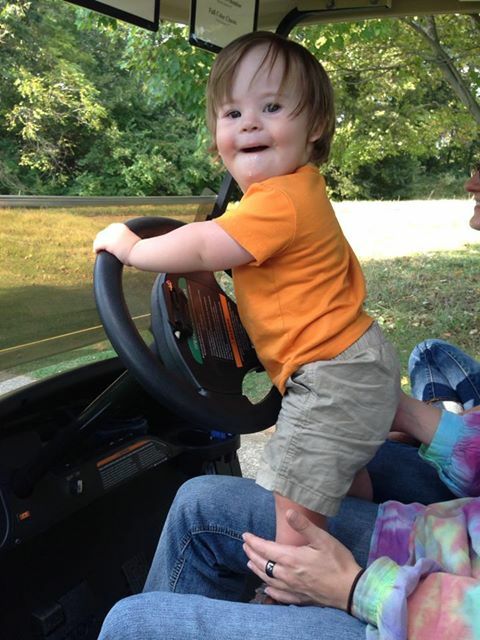 Just because he has down syndrome doesn’t mean he can’t need and want what all other toddlers do! That’s what I think people don’t realize. Hi! My name is Grayson and I am 10 months old. I want people to know that although I was born with Down Syndrome it doesn’t define who I am or what I am capable of! 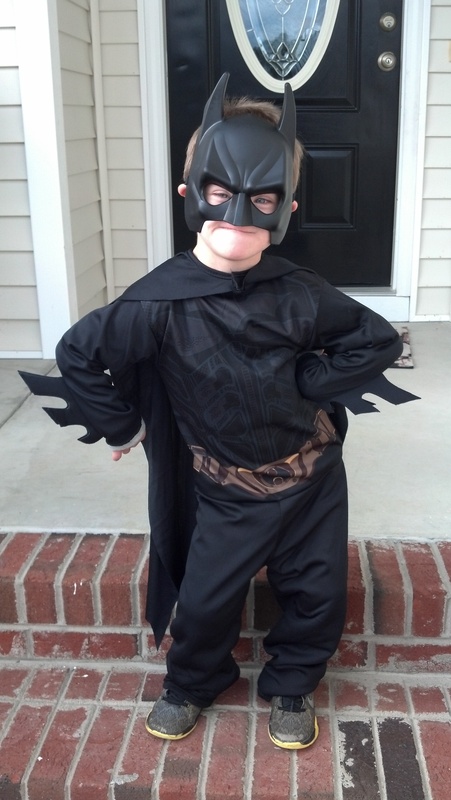 “Watch out world…here comes Grayson”! 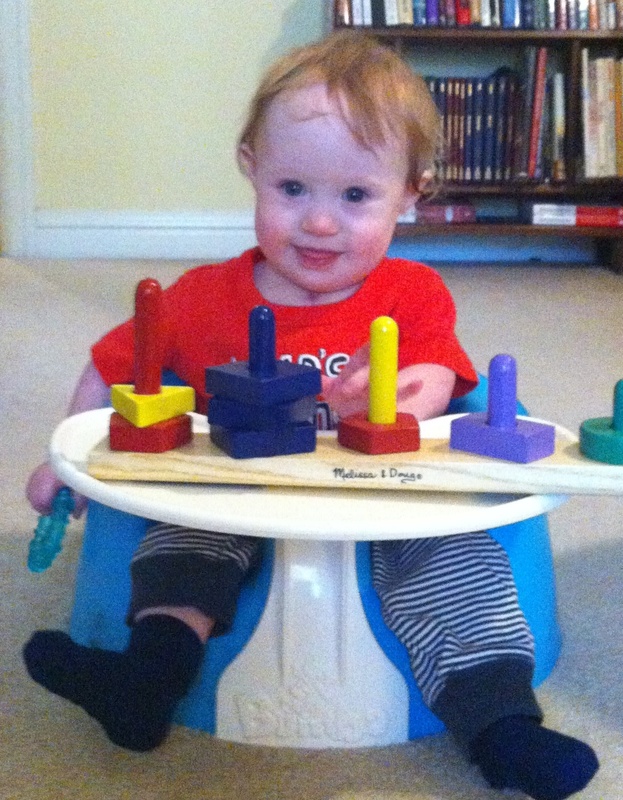 My son’s name is John-Michael, he is 10 months old and he is simply amazing! 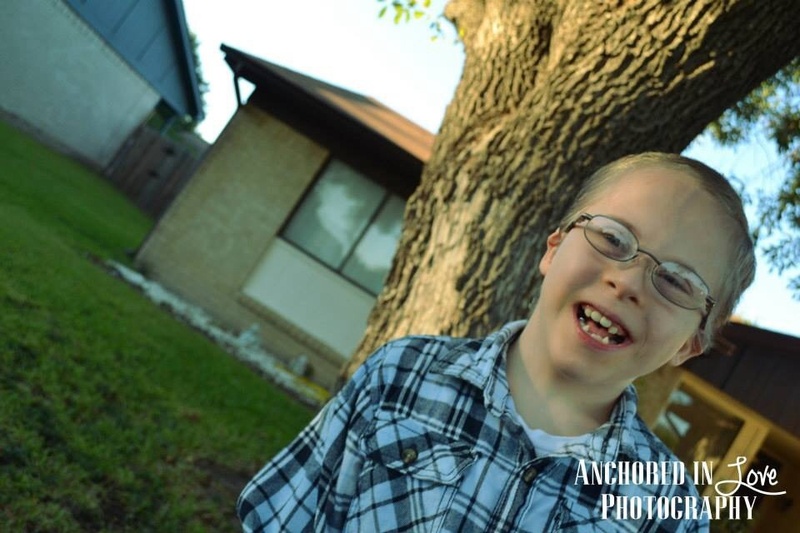 Quote: Kids with Down syndrome don’t have to try to be unique, they’re born that way and are uniquely gifted to love others unconditionally. Our daughter Elayna is 11 yrs. old and raising her is pretty much the same as raising our other three girls. We just keep,tucked away in the back of your mind, that she will and can do anything… In her own time. No comparisons! 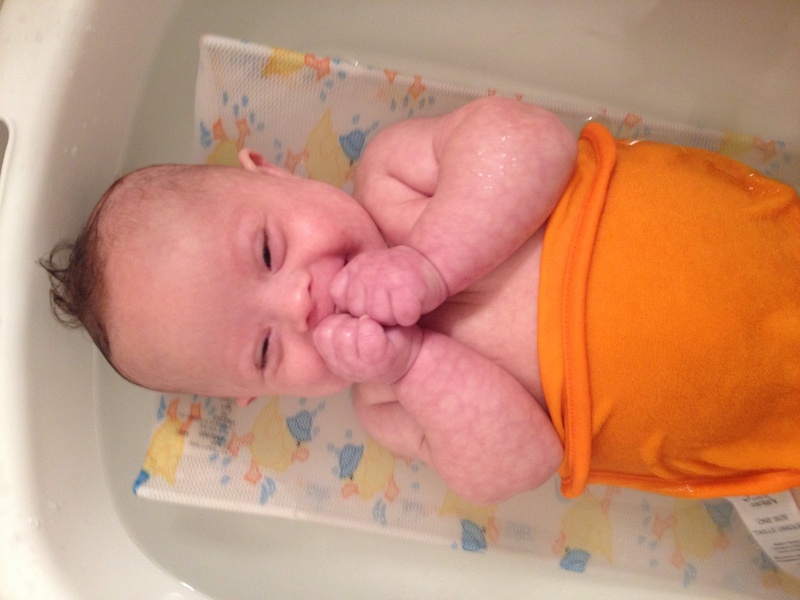 Life is better than good with Down Syndrome! My daughter had a very stormy first year but she survived and has blossomed in to a beautiful happy young lady. Like all teenagers she has her moments but she has taught us all what is important … health and happiness. Our lives have been enriched because she is part of our family. This is my daughter Anna and she is 7 months old. What I would want people to know about Anna is that she is a blank slate like every other baby. 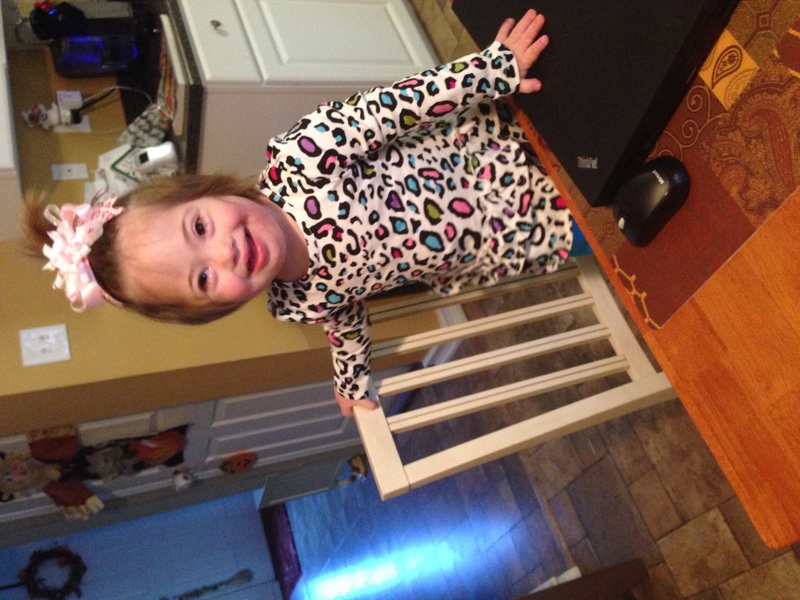 Her Down syndrome diagnosis does not define her or our family. 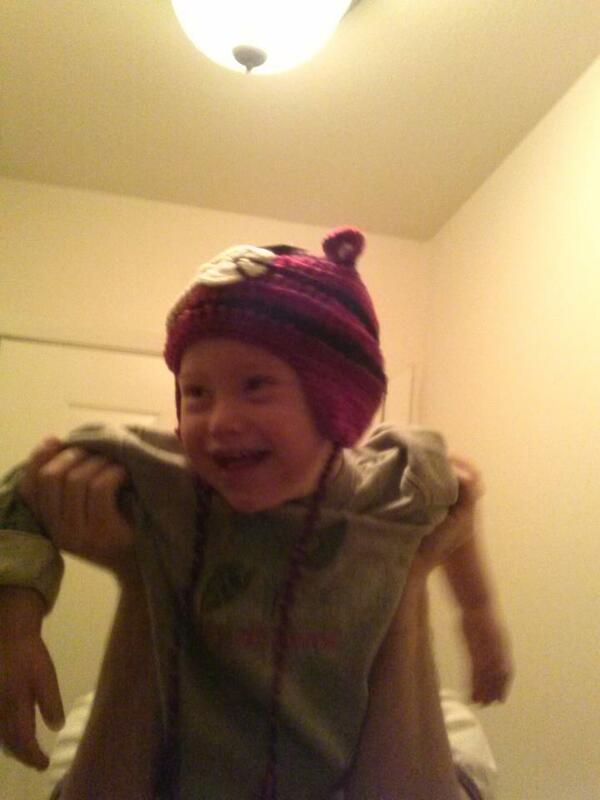 She is a bright, happy, and extremely determined little girl and we are all trying to figure this out together. 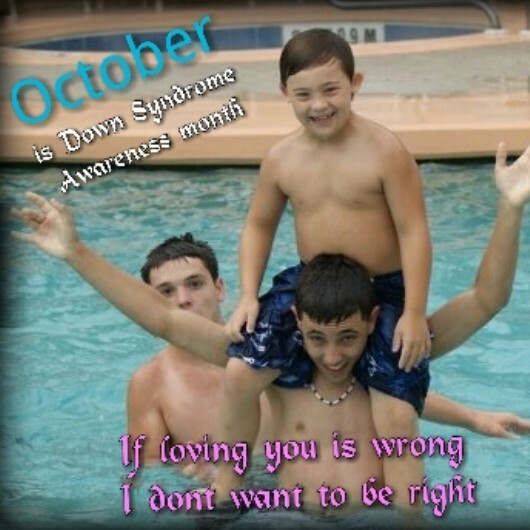 Thank for all that you do for Down syndrome awareness. I loved scrolling through all of these pictures and seeing peoples beautiful children. I feel so lucky to be a part of the Down syndrome community with all of you. The best “misunderstanding” I had about raising a child with DS is the notion of milestone delays and how much of a bonding experience it is to work with your child and watch the wheels in motion as they learn to move and communicate. 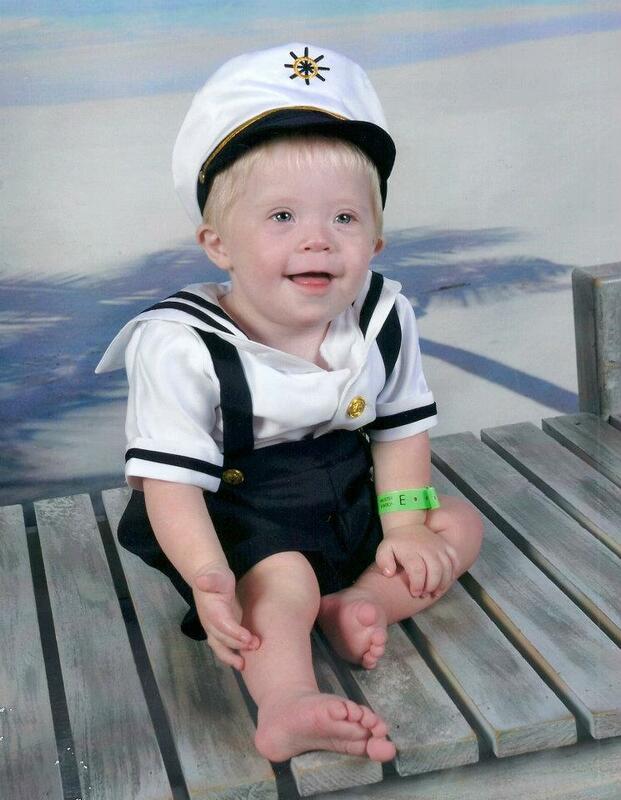 Some people are concerned about the lack of support they may receive when raising a child with Down syndrome. 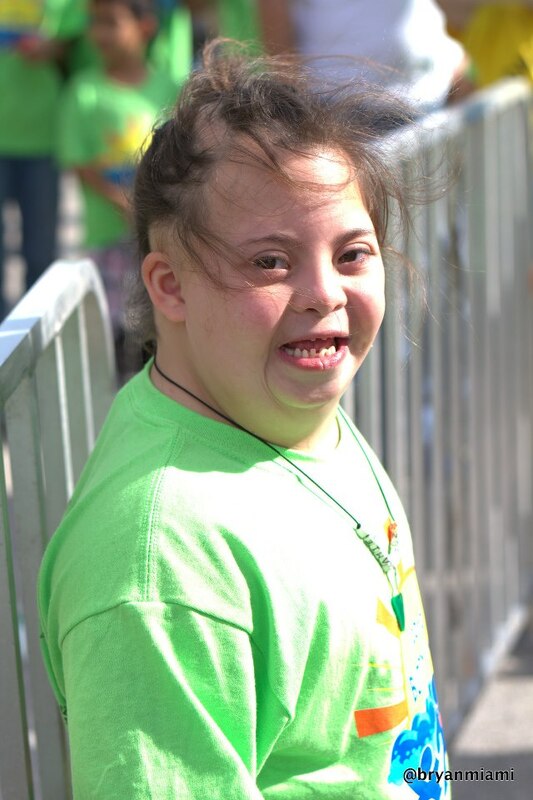 I’m here to tell you the amount of support, love and acceptance we continue to receive from our friends, family and the Down syndrome community is overwhelming. Although I am so very grateful for the extra support, I’ve realized we really don’t need it in order to be happy. Jacob continues to bless us every single day. 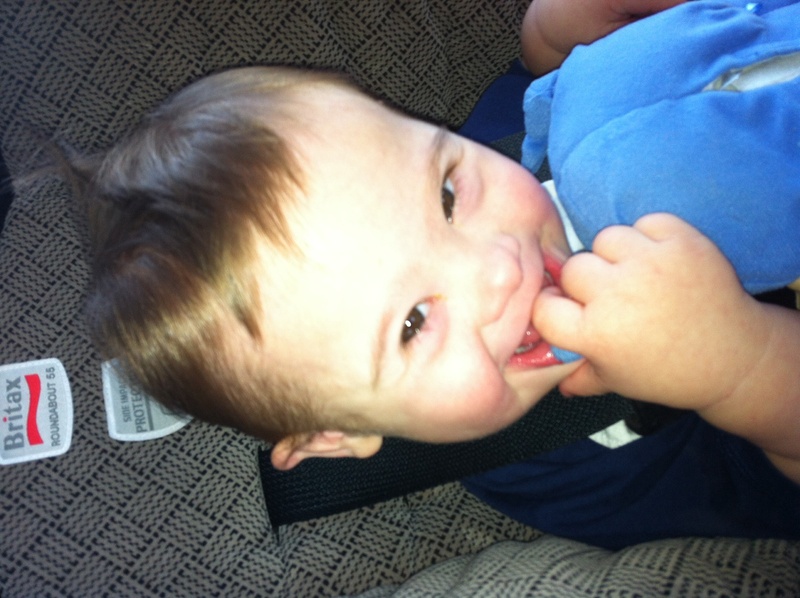 He is our beautiful son who just happens to have Down syndrome. Si is number four of our four kids. He completes our family in a way I didn’t know was possible. He brings the true meaning of Joy to us every day. 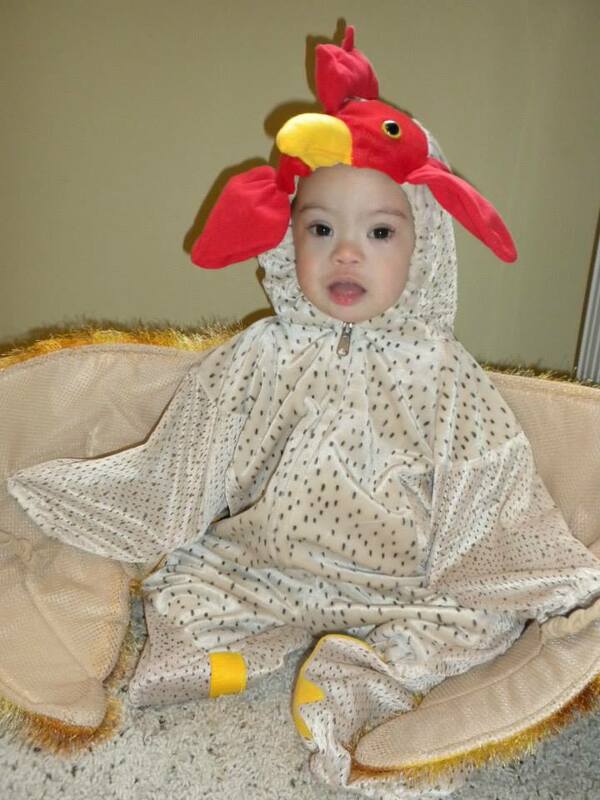 I’m so thankful for what his diagnosis brings to my other three kids. They will, statistically, be more compassionate and accepting of all people. This Bible verse best describes how our family feels about our Sweet Si. 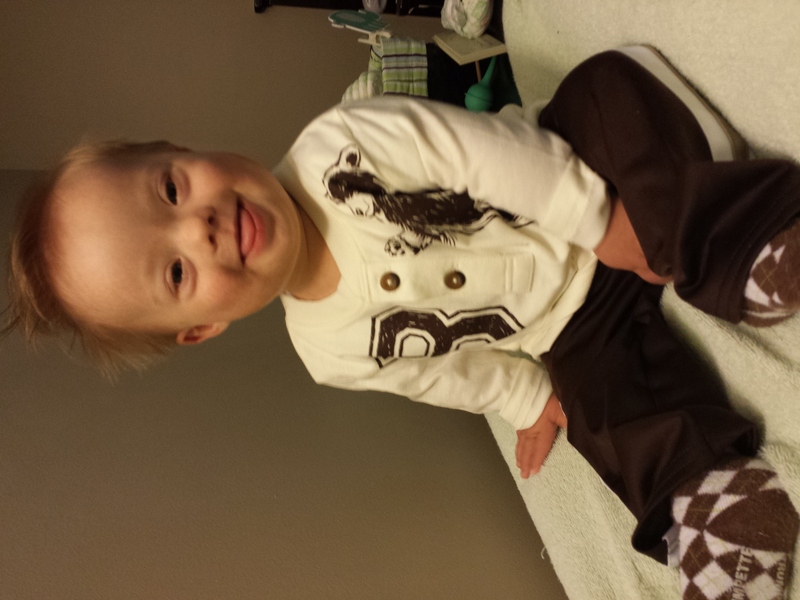 The thing that people don’t get about Down Syndrome is that it’s a pretty elite club. People who love someone with DS share a beautiful secret. This is rosaleigh she is 3. 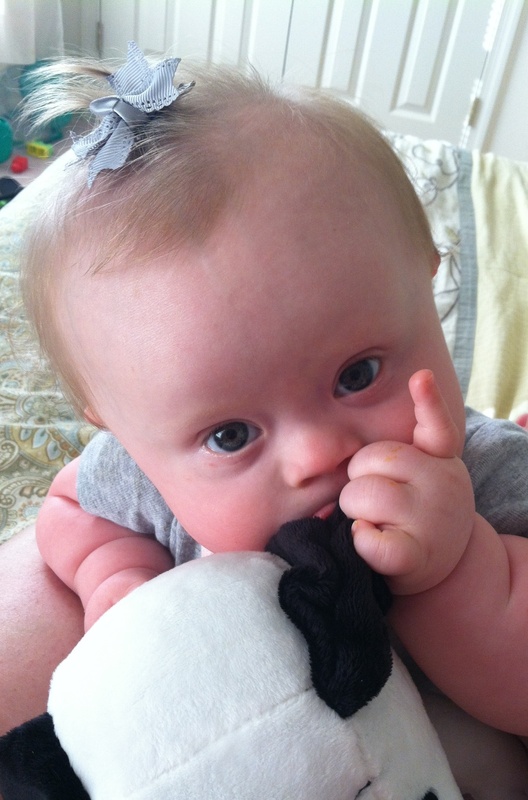 Something most people don’t understand about Down syndrome is that it is not something bad. You see the world through your child’s eyes and appreciate it so much more. My child will do everything and so much more then your typical child. 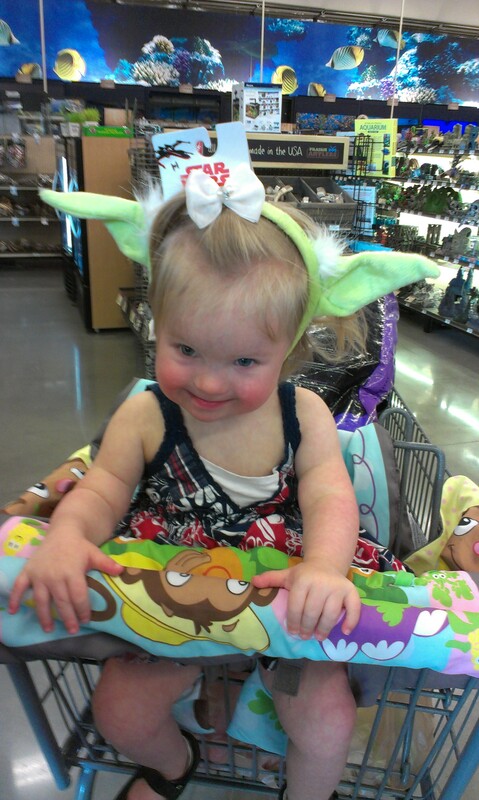 Do not feel bad for her or our family we are so blessed to have Rosaleigh and her extra chromosome. 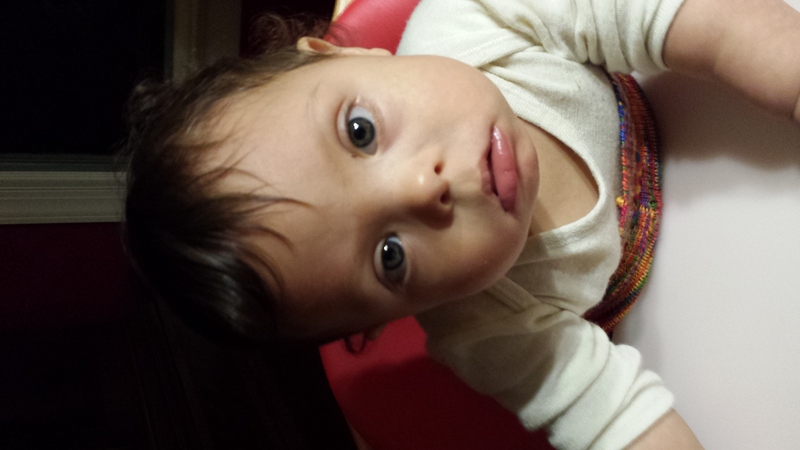 Lastly just because my daughter has some intense medical issues does not mean all children with Down syndrome do. Jackson is 9 years old. 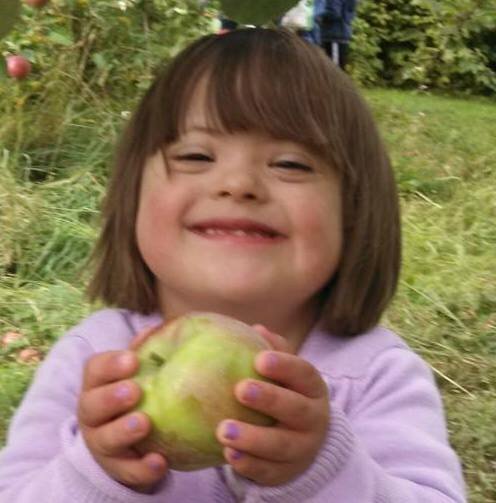 What I would like people to understand about Down syndrome is that we want to be included, not out of sympathy or pity, but because you like us. Invite us to parties and play dates because of our commonalities not our differences. My amazing little one’s name is Emilio he is 15months old. One thing I would say that not all children are the same, they are all different and unique. They all learn at their own pace. Dont compare your 15month old time my 15month old. Some people don’t understand why Emilio isn’t walking yet, all I can say he just isn’t ready when he is ready he will let go and walk on his own. Some people do have a hard time understanding anyone who has down syndrome and the challenges they and there families face on a daily. 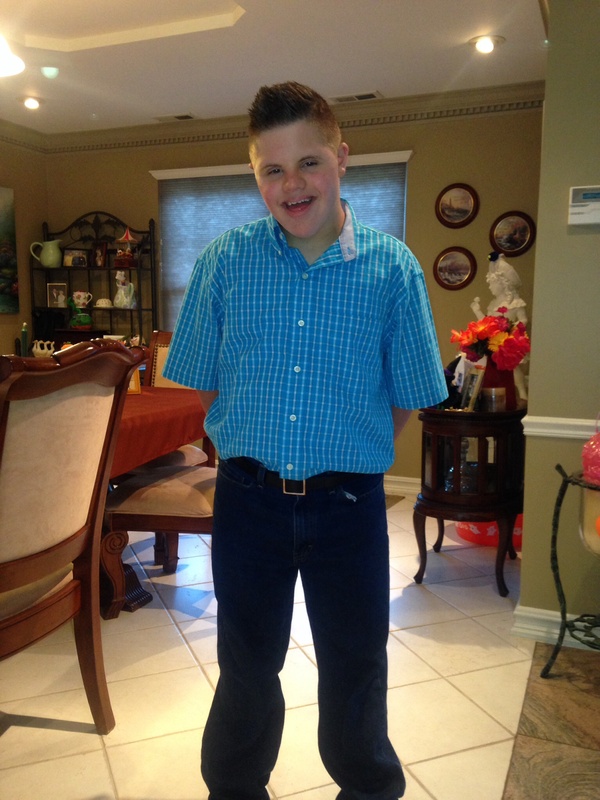 David is 13 years old, and the most truthful, loyal, selfless person I know. When he loves you he loves you more than anything. And if he doesn’t like you, you’ll know that too. I envy him cause he is always himself, he never acts a certain way because that’s what is expected of him, which is how most of us live because society expects it of us. His heart and soul are pure. We should all be so lucky! I had a nun say to me once that we will all be waiting at the gates of Heaven, but David will pass right through, and I truly believe he will. 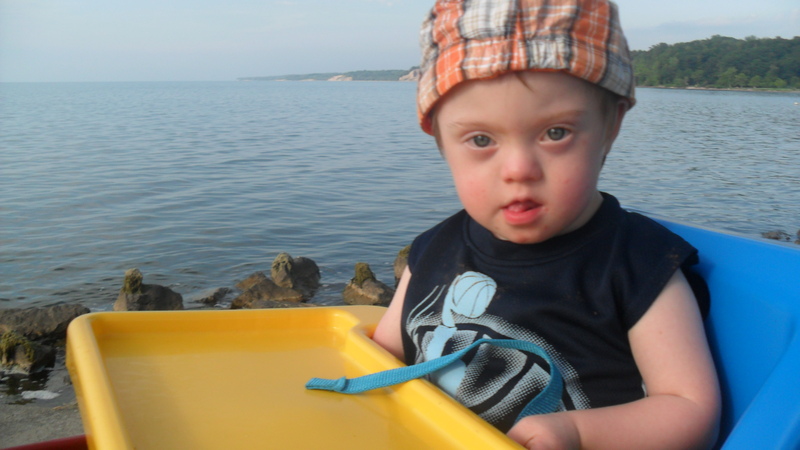 As shocking as the news was, finding out my son had Down Syndrome was not a death sentence – Children with Down Syndrome are still just children! 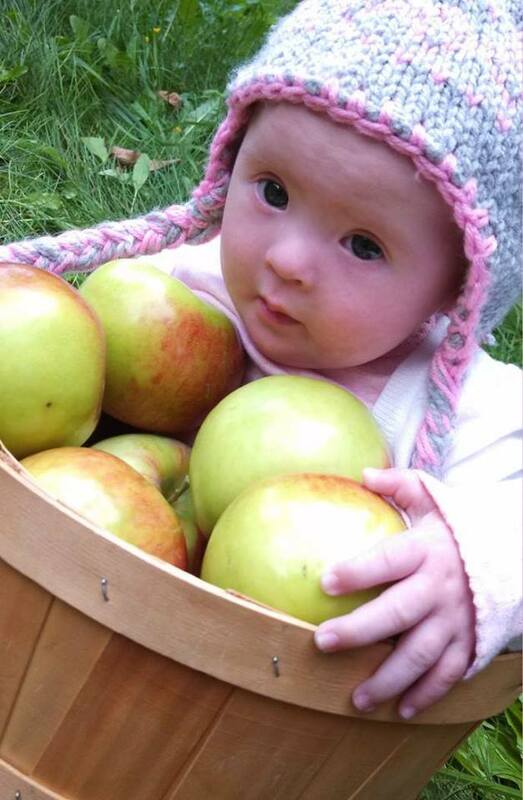 They are just as deserving of life and love as any other child. 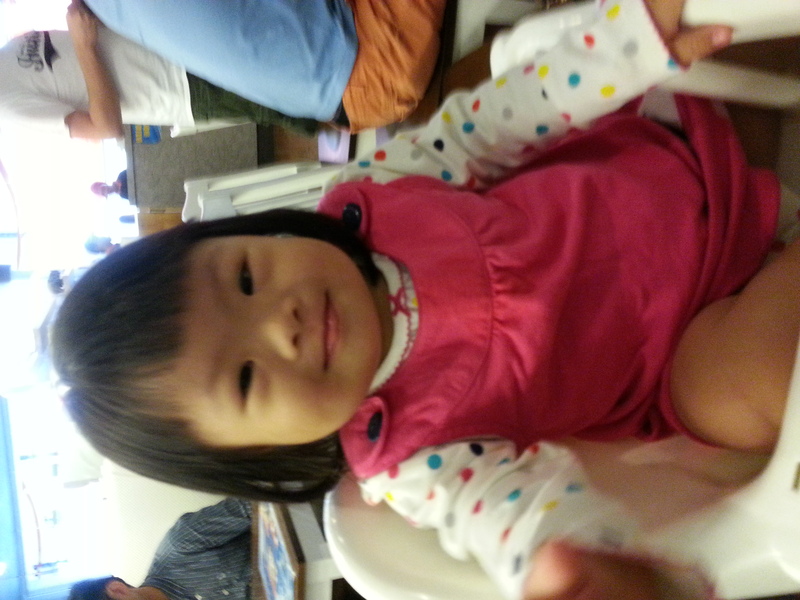 Children with Down Syndrome are not a burden, they are a blessing. Benji is my living example of that blessing! Sure that’ll be hard work to choose only 8 of these lovely children. This is Walter, 33. 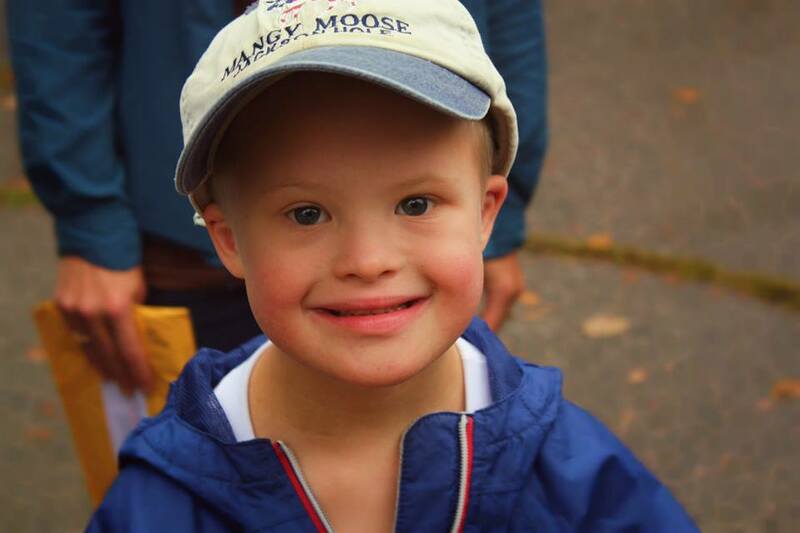 There are certainly lots of unknowing and misunderstandings on down syndrome, but I think the worst is the prejudice down syndrome people still suffer around the world . I’ve heard recently that the majority of children born with the syndrome in Russia are given to adoption or live in institutions. That is, prejudice starts even within the families that don’t give these children a chance of being loved and living with them. There is the word “mongol” in one of Walter’s birth document and he still suffers prejudice within my family. Not all our brothers are able to love him and accept him as he is. It’s unbelivable, but this still happens. That’s why awareness is so important. This is my son, Andrew. He is 11 years old. He is a wonderful person. 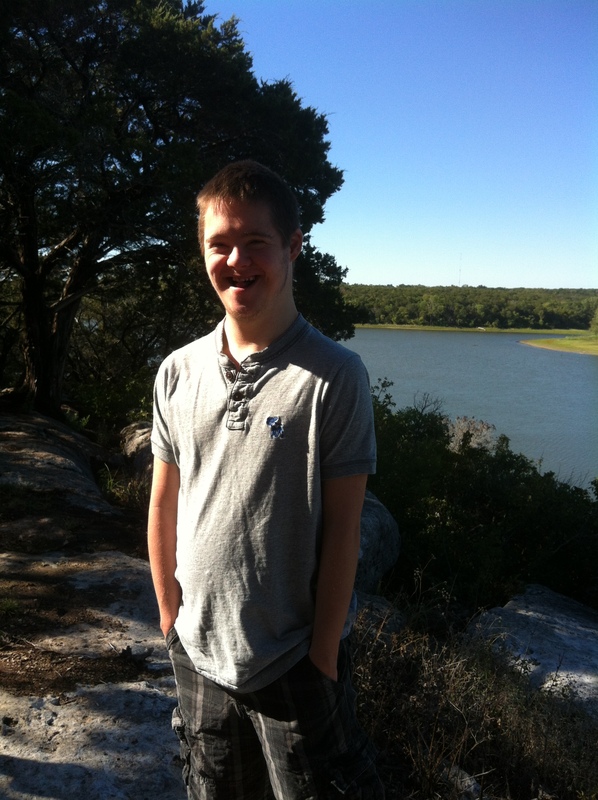 He is involved in the leadership group at school and also on the soccer team. One thing people don’t get about downsyndrome is that children with downsyndrom CAN learn to read phonetically. 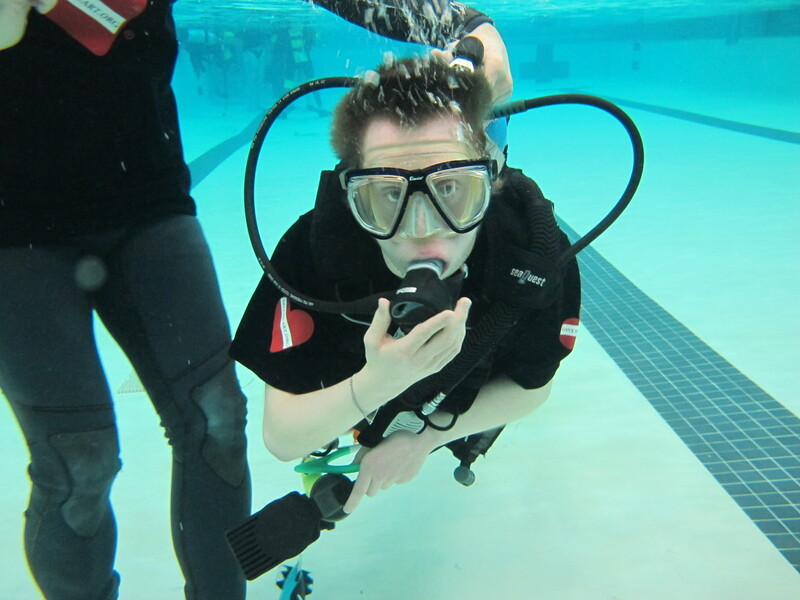 Andrew constantly amazes his teacher with what he knows. 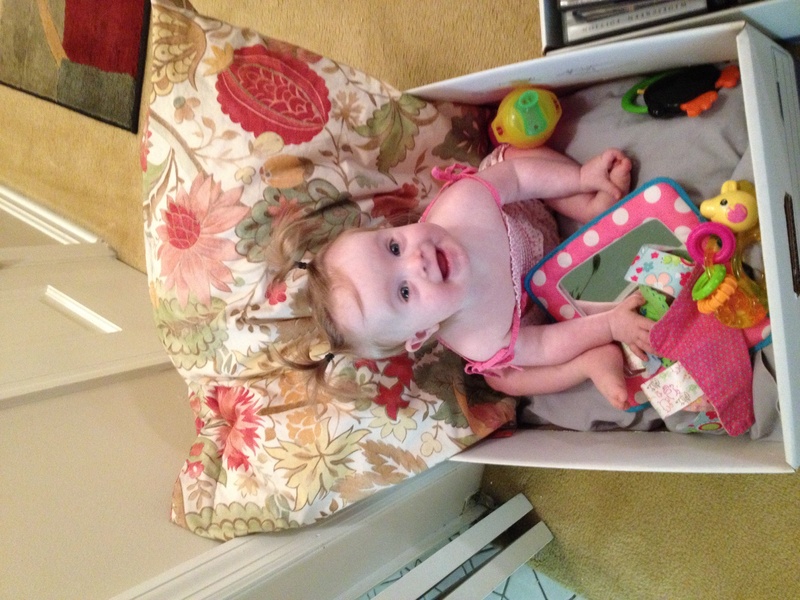 Don’t put any child with downsyndrome in a box by believings that all children with down syndrome are __________. Fill in the blank….but it won’t be the truth. 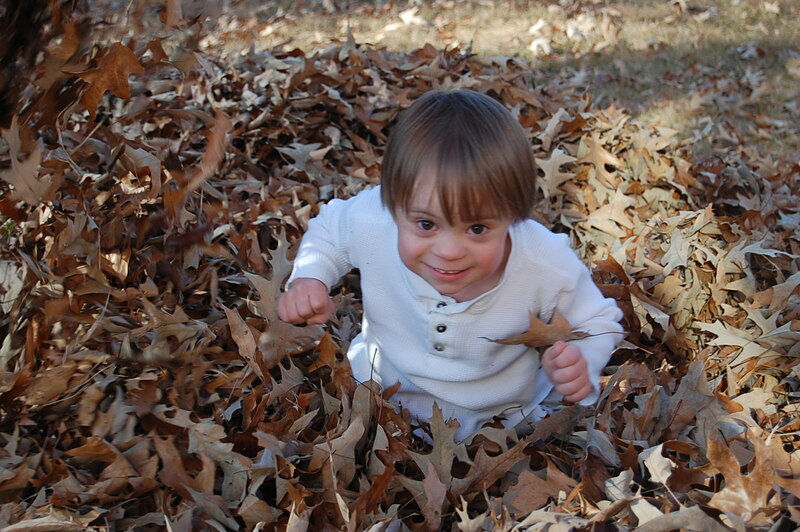 Van – Age 3 – It is a privilege and an honor to be blessed with someone that has Down Syndrome. It is a life changing experience filled with a life time of priceless moments. 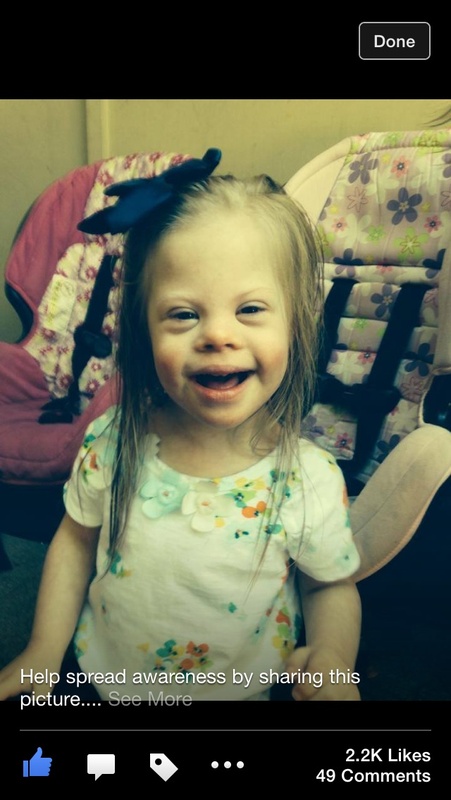 Having Down syndrome doesn’t mean life with our daughter will be sad or miserable. She can still have a fabulous, happy life just like any other kid. She may not be the little girl I had imagined before she was born, but she’s 1,000 times better! This is Keyan, and he just turned 3! 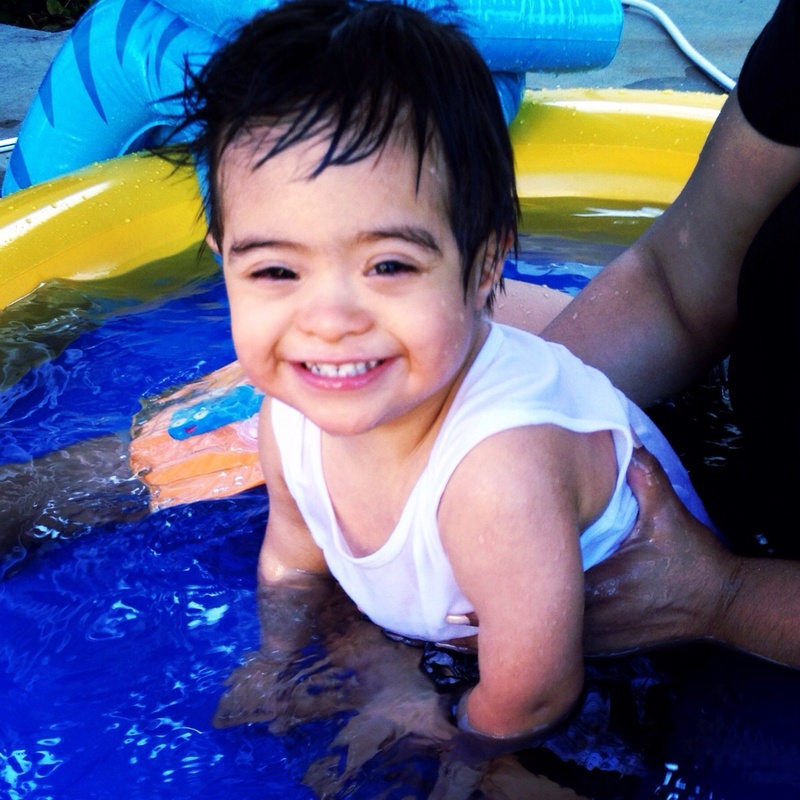 What most people don’t understand about raising a child with Down syndrome is everything. They may think they know but unless they take some time to ask questions and observe, they don’t truly know, as I didn’t know until I started this wonderful and challenging journey. I love my son for who he is, a sweet, loving, caring child who is also a handful (just like his brothers). I strive to treat him just like the others and I think that might be what surprises people the most. While it might take him a bit longer to learn what his brothers have, he has and will. 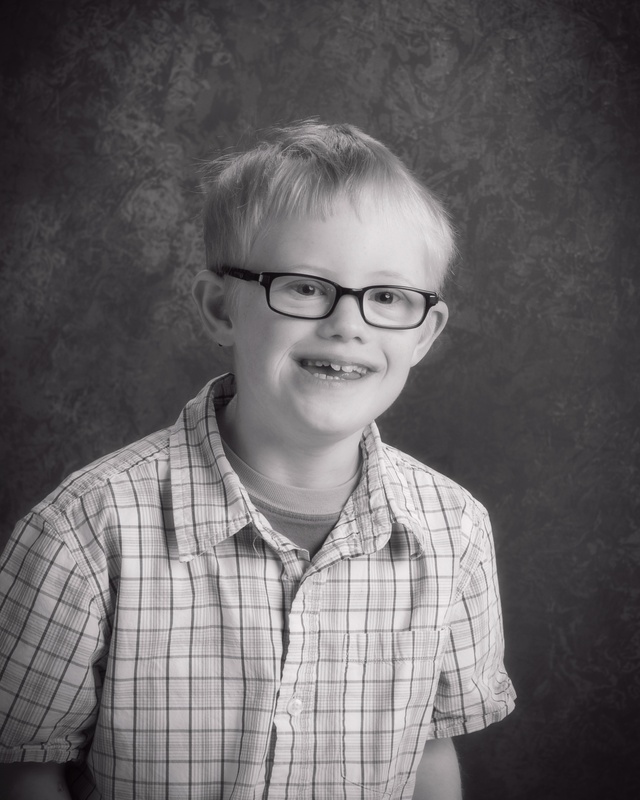 I’ll never forget the first comment from a friend I got when I told her Ethan had Down syndrome, “Well, you have one son who will grow up and move away and one son who will live with you forever.” My response? “No, I have two sons who will grow up and be independent.” I never once saw Ethan as unable to do anything his brothers or anybody else could do, as long as that was what he wanted to do. Friday night High School Football has never been the same since Blake & Austin have led them to victory !!! My Son’s name is Biko (bee-co) and he is 21 months old. I think I myself didnt understand the amount of love I would receive and give to my son and how awesome having him be a part of our family would be despite the grim faces and sympathy doctors and nurses gave me when the diagnosed him at birth. There are challenges with all children no matter their chromosome count and society has made a DS diagnosis feel like a death sentence to parents before our children are ever given a chance. The DS community is one of the best communities to belong to. For the most part parents are kind and accepting of everyone they meet. I am looking forward to becoming more involved and possibly opening up my own Gigi’s Awareness Center in the next 5 years all because of my son. Society needs to realize that people with DS are just like everyone else. 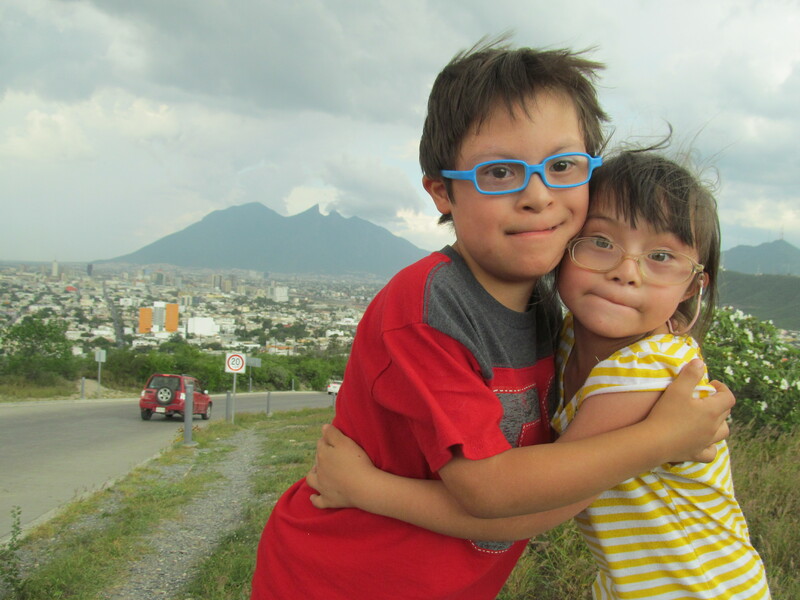 They want the same things, love, education, a rewarding career, a family to call their own, friends they can trust, and for the world to accept them for who they are and recognize them for what they do not how many chromosomes they do or do not have. I love my Biko just the way he is and would not trade him for anything in the world. I had to share this one too! My son’s name is Elisha (with a long i). You know, he’s named after the prophet Elisha in the Bible. He just turned 7 years old in August and here were his thoughts about getting older, “I don’t want seven, I want six.” Don’t we all buddy! 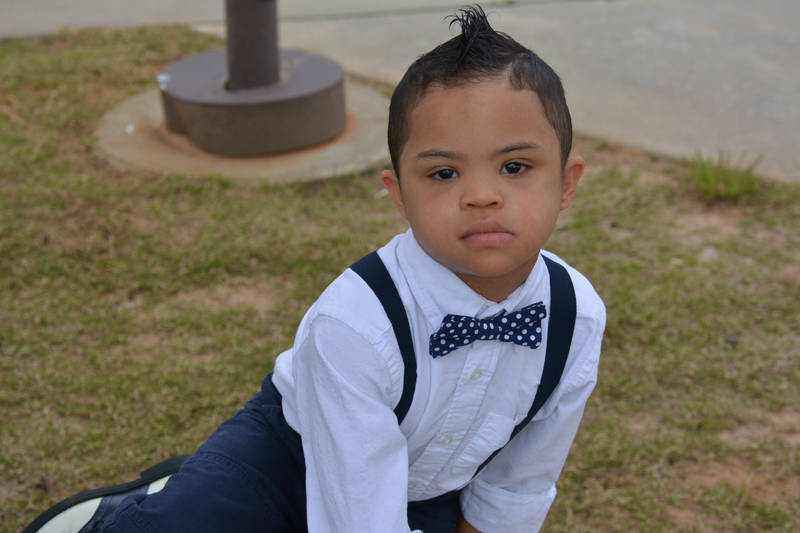 People always say ‘people with Down syndrome are so sweet.’ Well, Elisha is sweet, but he has those typical kid moments too where he is stubborn and not so sweet. I’m glad he exhibits these typical kinds of behaviors. He has his own little personality! Allison, age 2. People dont get that allison dosent need a “cure” she needs acceptance to be who she is. This is Ziggy! He is four years-old. I think the thing people mistake about Ziggy the most is not realizing that he is a little punk! He loves to pretend he can’t do things, but he is much more capable than he seems if you don’t try to do everything for him. Or assuming that he doesn’t understand what is going on around him. Just because someone can talk, doesn’t mean they’re no listening. 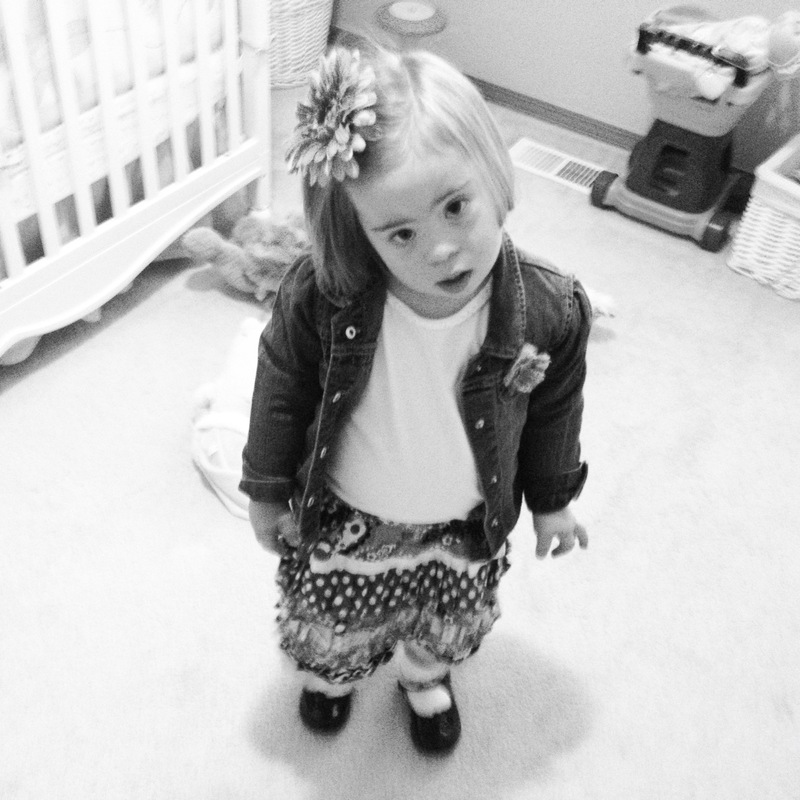 I want everyone to understand that people with Down syndrome have complex emotions, and are not always angels. They can be happy, angry, sad, tired, frustrated and bemused just like everyone else. More alike than different! 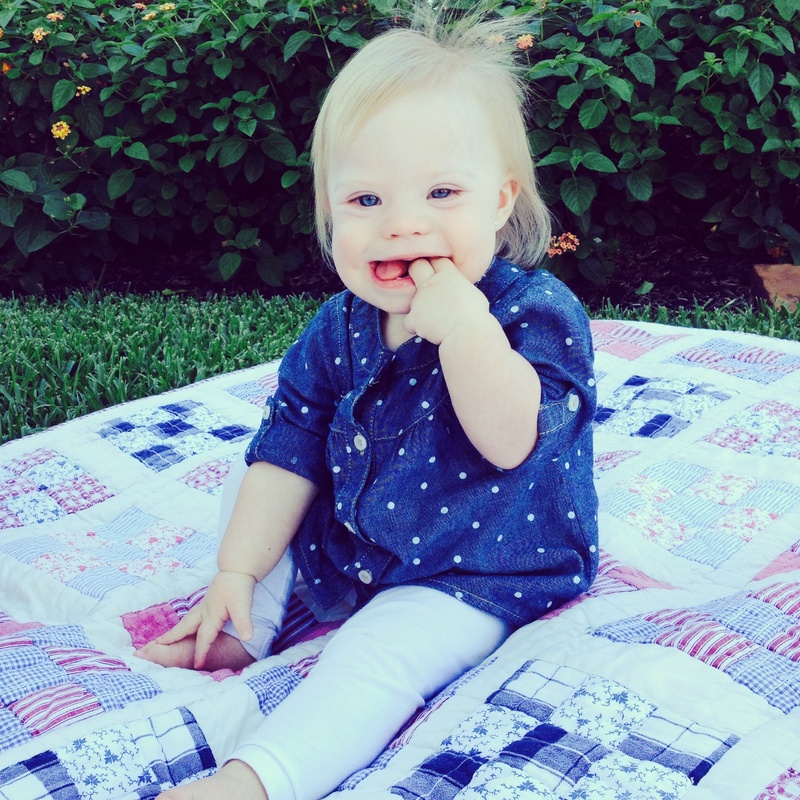 Down Syndrome – it’s better than you think! 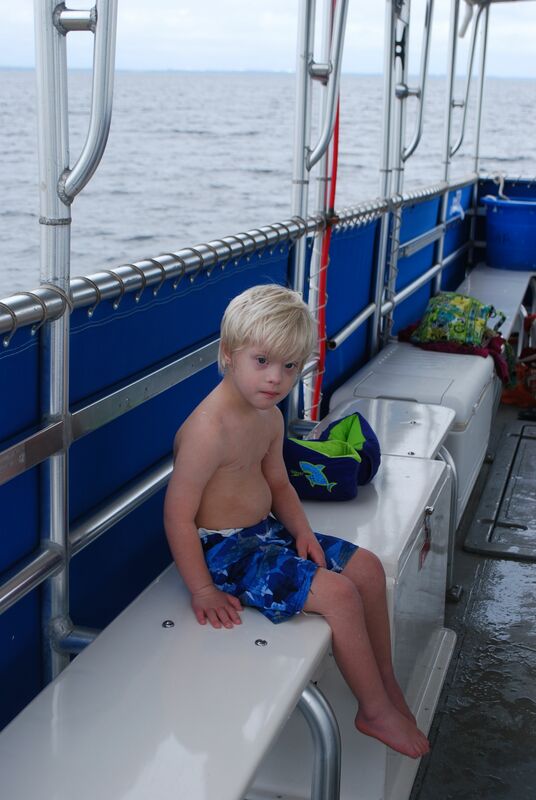 People need to realize that kids with Down Syndrome are basically no different tan any other child. They want the same things, dream the same dreams. They learn differently, but they learn. I wouldn’t trade my son for anything. He has brought so much joy to our family and taught us not to judge people by what is on the outside but what’s in their hearts. My son Jason is 5 years old People often look at his DISabilities rather than seeing all the abilities he has: Jason can put a smile on your face and get you in a great mood immediately, he is kind and loving, he is willing to try anything, he makes us realize all the good and happiness in life and how to view things with a positive attitude, he has introduced us to so many people we would have never otherwise met. After 2 “typical” children, we realized that reaching a milestone might take a little longer but we celebrate it a lot more! For every goal reached, we as parents and family get a sense of achievement and it is a wonderful feeling!!! Of course, there are trying times but that’s what makes you realize Jason is just like his siblings and just like his peers- a child! I wouldn’t trade my job as Jason’s mom in for ANYTHING in the world! I just wish people would see his ABILITIES not just his disabilities. James – The blessing I never knew I wanted. Where did my picture go – I just don’t know what I’m doing with these things. Trying again. Everyone must know that as parents we want him to fit in. As a person, he is as normal as every other student at school (very popular I might add). The only difference is his feature are slightly different and he is more flexible than anybody else! 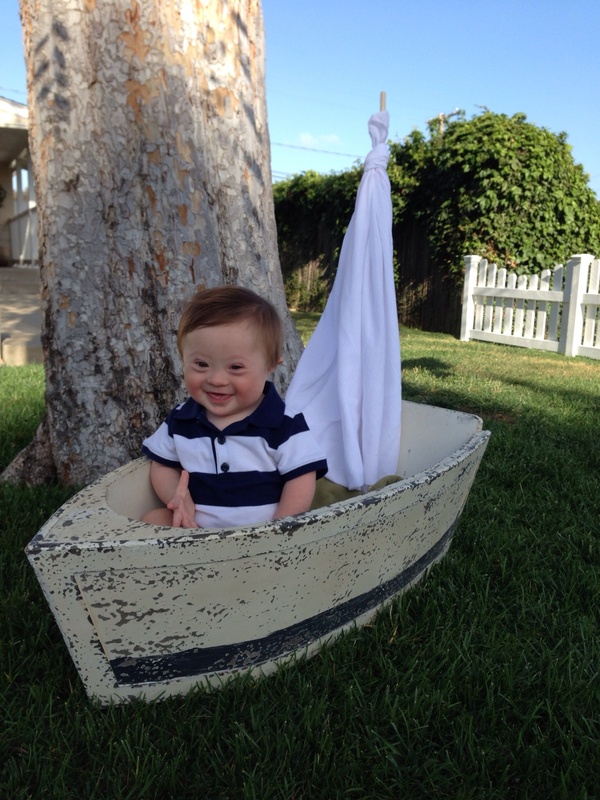 My child with Down syndrome is not a curse.It is a blessing in disguise.He was meant to be in our life for a purpose.In this few months he has already empowered us.He has made us stronger human beings and we will fight in this normality world so he will be given that chance as any other children. 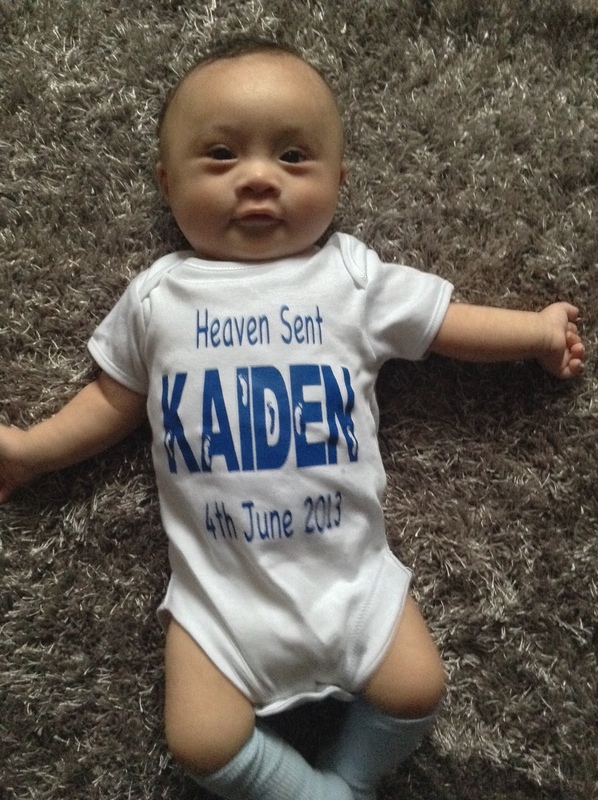 We have come to learnt the important lesson of perfection and that it doesn’t exist in anyone.Thanks to Kaiden! 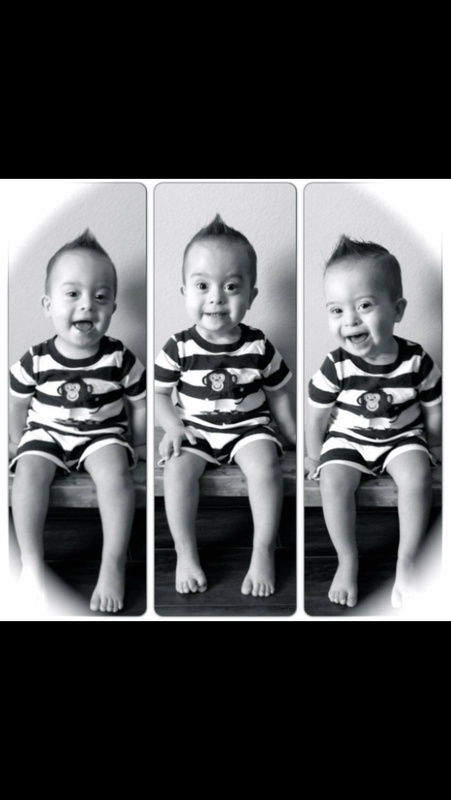 We love him.Believe in kids with Down Syndrome and see beyond their disability and they will show you there are hope and love in them as any other child. Forgot to write his name but you could see from his vest anyway. Quotes have been left above. This is my awesome 10 month old son Aydan! He has a very special place in my heart not only because he is my son, but he is the child I thought I would never have after being diagnosed with infertility at the young age of 18. 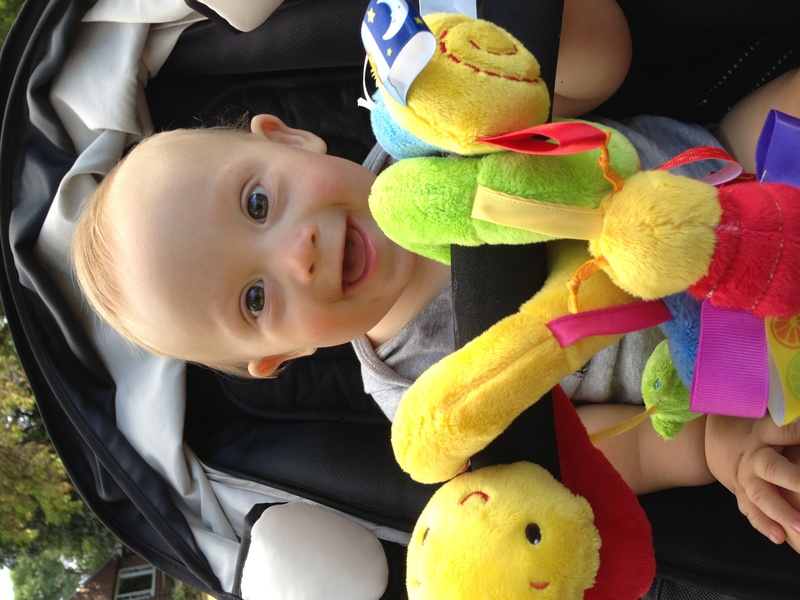 What people do not understand about Down Syndrome is that my son’s excessive happiness is NOT caused by his extra chromosome, in fact, it is caused from the excess love that he receives on a daily basis. We NEVER miss an opportunity to shower him with all the love we can possibly give! 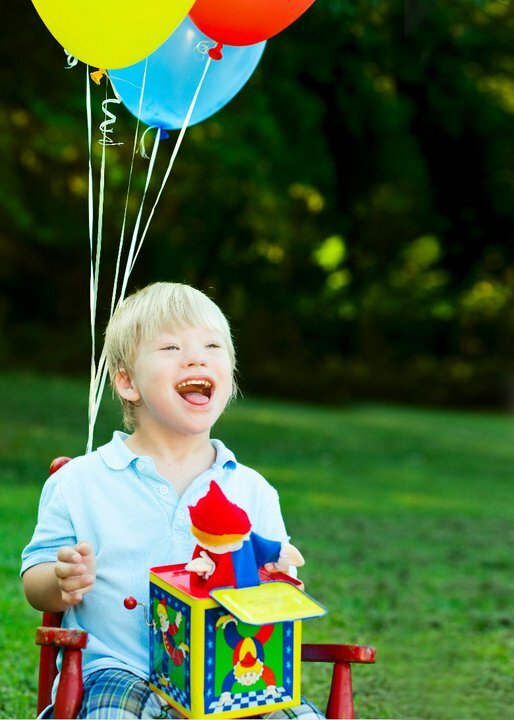 Many people don’t understand that every person with DS is a unique individual just as all children are. Every child has different strengths and weaknesses. 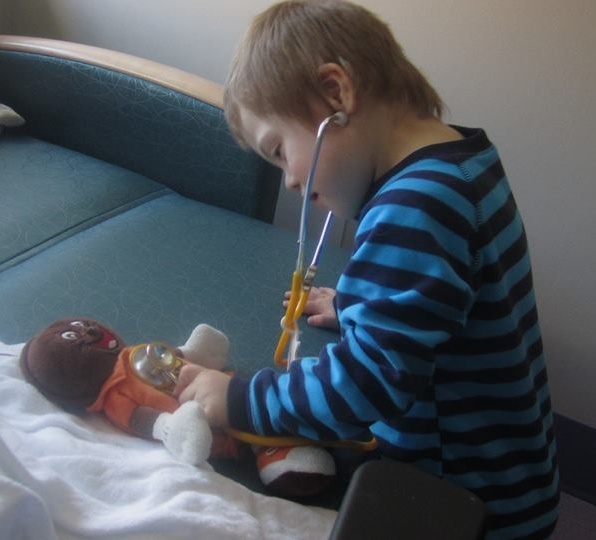 Children with DS are not all the same in any area. Upon receiving our prenatal diagnosis, I sprang into mommy action reading books and internet articles 24/7. It was overwhelming and comforting all at the same time. A myriad of cliches — “It’s just a label,” “It’s just a diagnosis” — quickly filled my world. Sadly, what I didn’t get at the time and what most people don’t understand about Down syndrome is that it’s just a person. Underneath the diagnosis, the doctors and therapists, the appearance, there is a person like any other with wants, needs, dreams, fears. 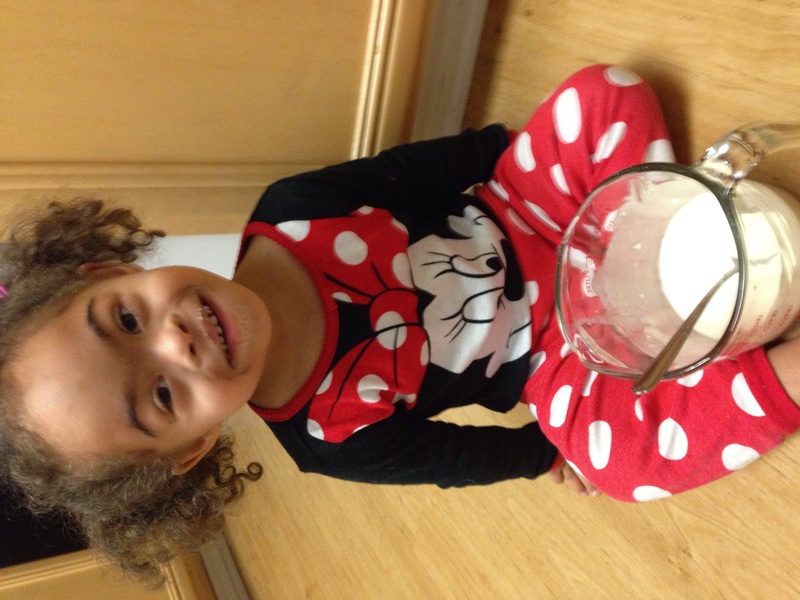 Quote : Miracles can happen to children with Down Syndrome when you believe in this recipe : faith + love. My son’s name is Ethan. He turned 10 last week. I think the simple answer to this question is universal. People don’t understand what they don’t know. This goes for both children and adults. I am a special education teacher for kids who are severe and profound and I witness this in the elementary schools all the time with typical kids who do not know anything about my students. To help them understand we buddy up with general education classes to teach them how our kids are the same and how they are different. By mid year they beg to come help in our class and seek out my students to play and read to. These bonds continue as they move on to other schools. Because they understand and now know they are no longer afraid of what they don’t understand. Adults are no different. Education goes a long way and your blog and this article are just the tools necessary to allow those a better understanding into our worlds. Thank you for all you do. My son, Iren Jace (peaceful warrior), is 13 months old. He is our 8th child and has been my greatest teacher. 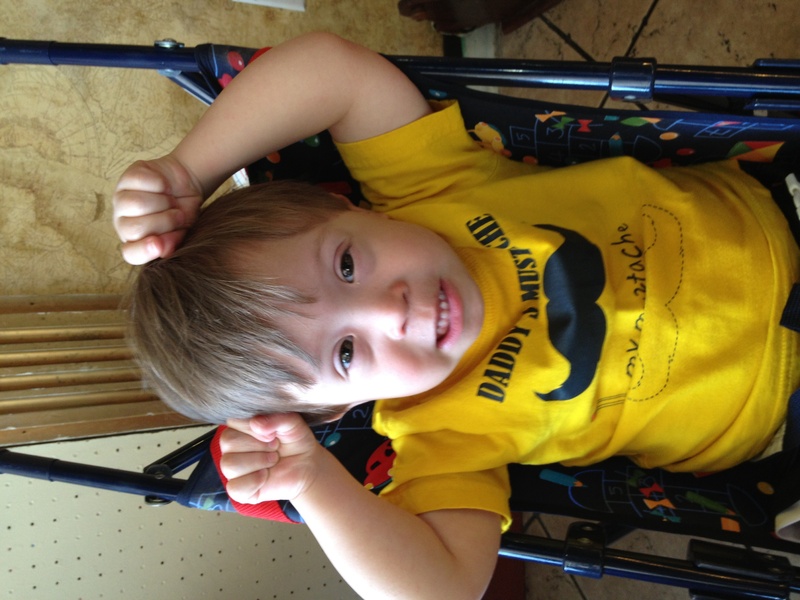 I would like people to know that Down Syndrome is not a Disease. It is actually a normal variation of the human genetic code. 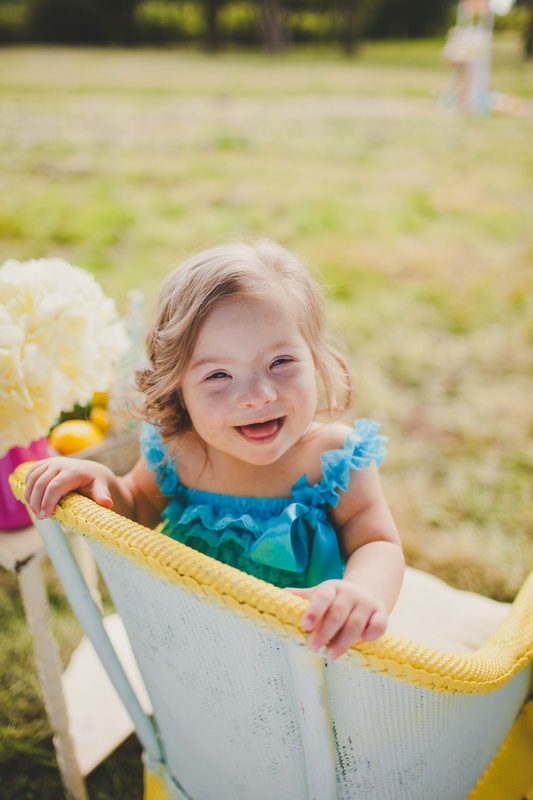 Just as typical children can have congenial defects, health issues, and developmental challenges; children with Down Syndrome can be healthy, strong, intelligent, beautiful, creative and vivacious! We live in a culture of expectations. And, we are ill prepared to cope with outcomes that are unexpected. 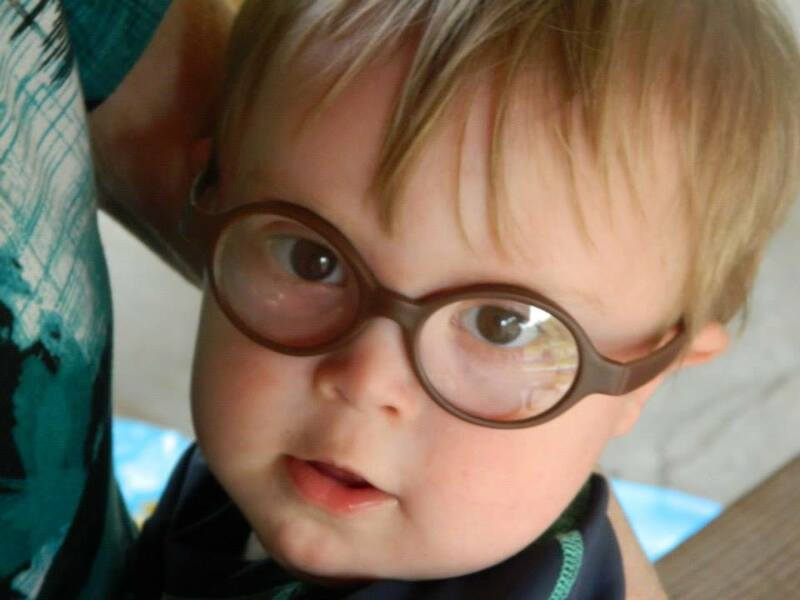 What we should remember when thinking about someone with Down Syndrome, is that they were the strongest sperm to hit the egg too, just like you and me. And, they survived the amazing process of development against greater odds than we did! That strength and perseverance continues to shine through in every milestone they make and task they accomplish. Now explain to me how that qualifies as dis-abled? 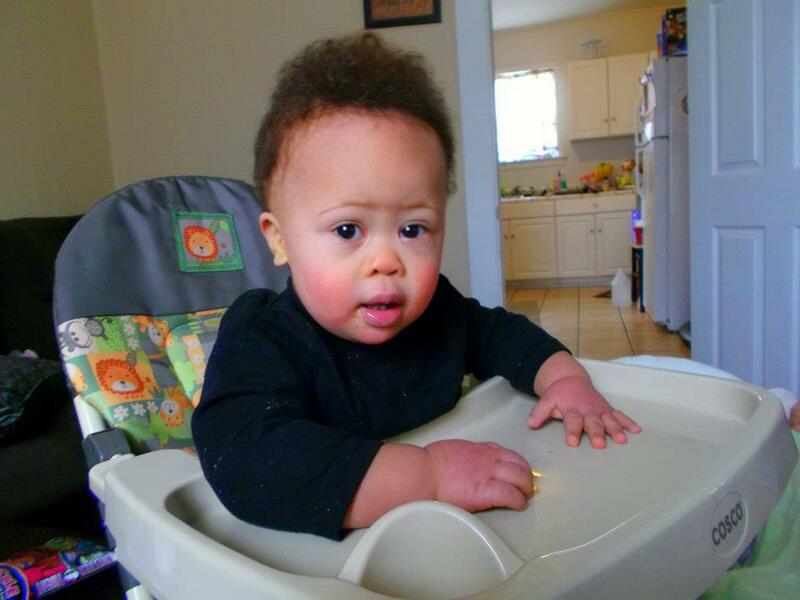 Iren is happy, healthy and quite “able.” He is hitting milestones on the later side of the “normal” charts and is the size of a typical 1 year old. He is super strong, fast and very curious. He is everybody’s favorite and we couldn’t imagine him any other way. P.S…and he has the greatest smile! My daughter Elsie will be 2 in November! I think what most people misunderstand about children with Down Syndrome is that they are very capable little individuals! Perhaps capable in different ways but none the less kids who have Down Syndrome can’t really be stopped from doing what they want to do, and can really learn new things ALL THE TIME! 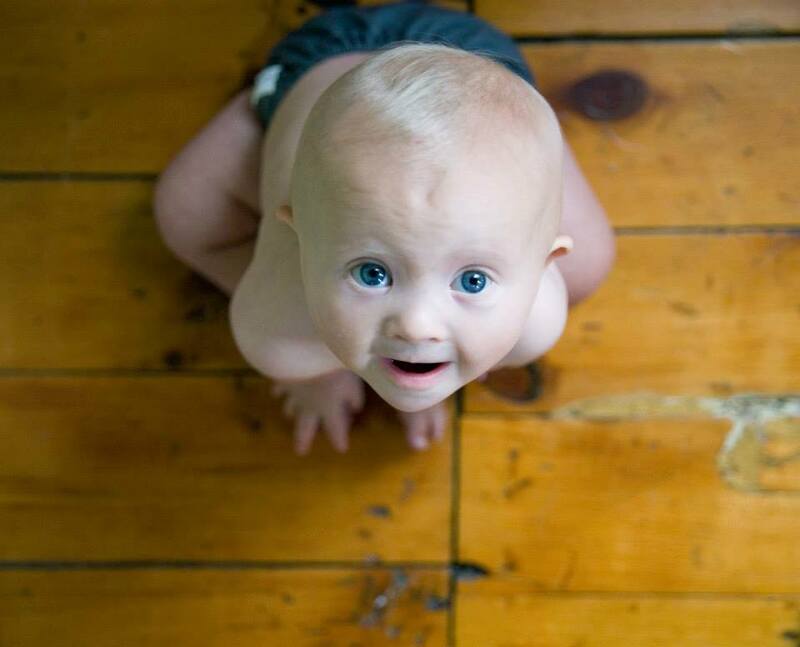 My son is Owen Alexander he is 5 months old and wonderful with the most beuatiful eyes and smile! 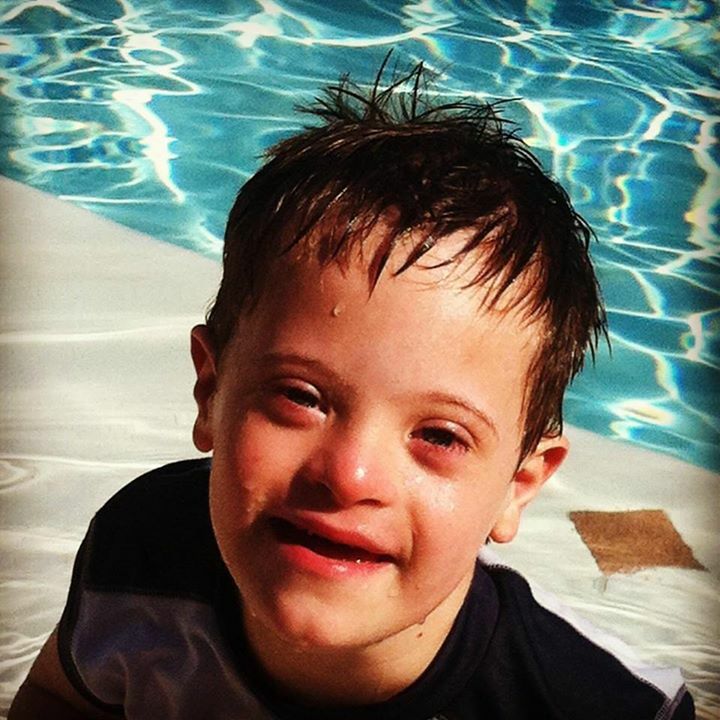 What I want people to know is that they don’t need to feel sorry for parents with kids that have Down syndrome because we love our kids for the blessings they are, not because they’re “normal or different.” You don’t have to pity me because my heart is overflowing with my love for Owen just as it does for my other children without DS. This is our sweet Rosalie. She is 5 months old. 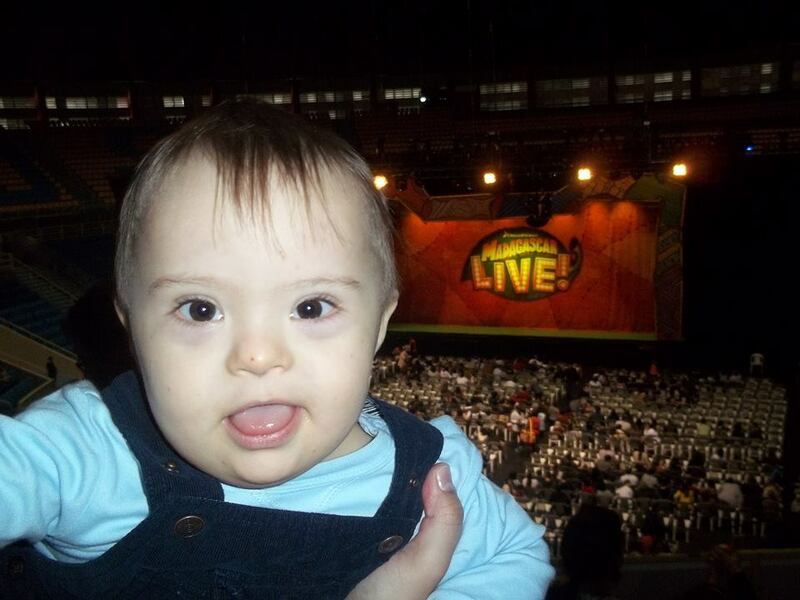 People don’t understand that babies with Down syndrome will go on to live fulfilling, happy lives. 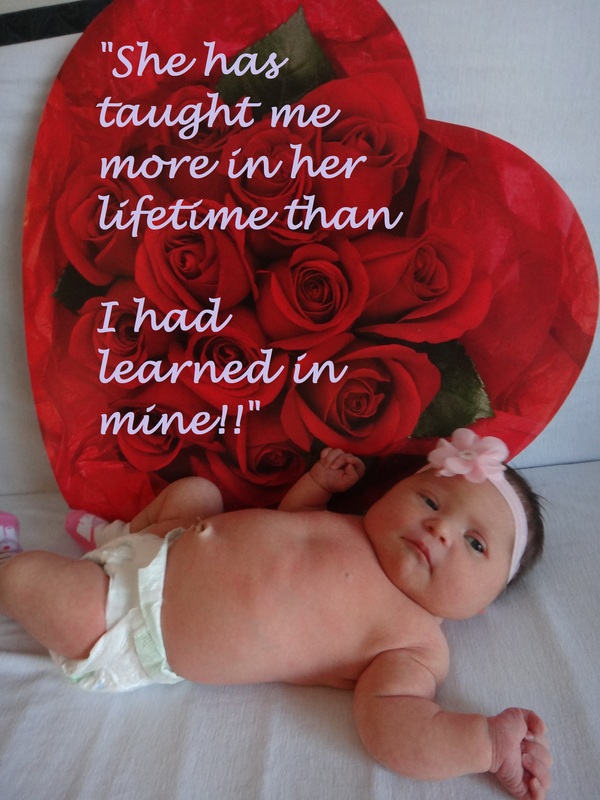 Rosalie will have a great quality of life and will go on to do all the things “typical” people do! She will learn to crawl, walk, talk, get potty trained, go to school, make friends, have crushes on boys, etc.! So what if it takes her a bit longer to do these things, everyone always says that their kids grow up too fast. We get to enjoy each stage longer! “God’s specialty is taking little and making it much. He chooses the weak to demonstrate His Power.” (1 Cor 1:27-28) Everyday, God reveals His faithfulness to us in the person of our daughter, Zofia. 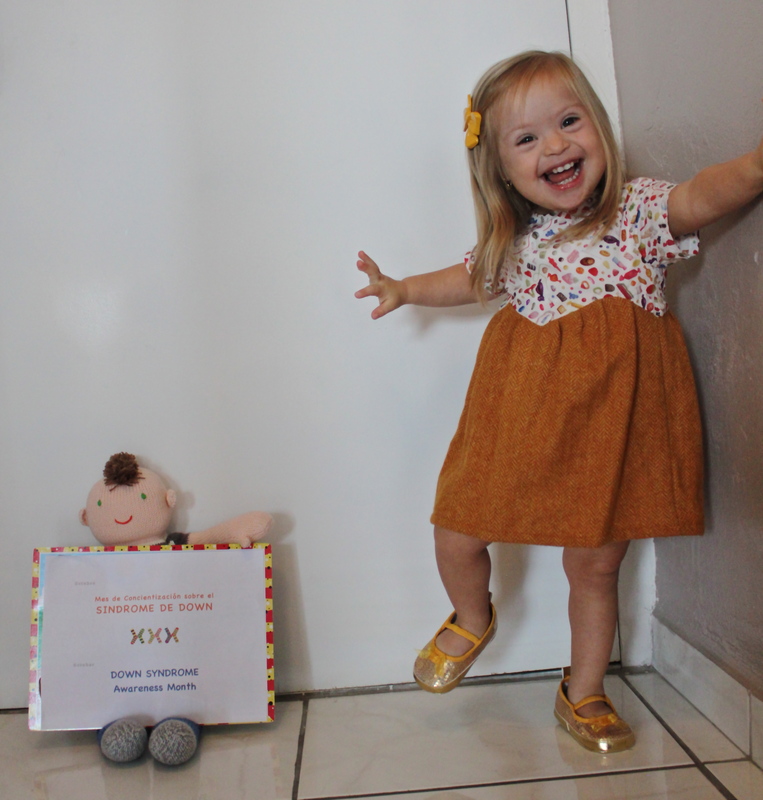 She, and all kids with Down syndrome, can do ALL THINGS through Christ who strengthens them. We are so blessed and grateful for how His grace and love have been manifest in and through her life. Blessings all! My son and first born is Christian Alexander and he is 3 1/2. He is the light of our family and reminder that though in life you encounter limitations, you must focus and celebrate on what CAN be achieved! 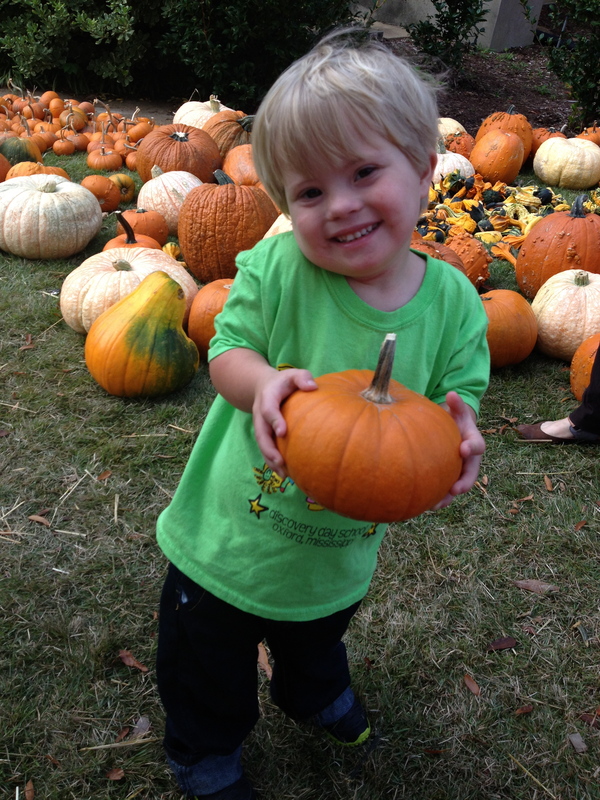 Charlie, my Grandson, will be 3 years old on the 14th of October. I have 3 other Grand children who I love very dearly, but there is something about Charlie. As weird as this may sound, over 3 years I have come to learn that I don’t even notice that Charlie has DS. He is so strong, loving, and he inspires me so much. If I had the power to change him, I would not. A couple years ago, I can’t imagine having made a statement like that. Thank you God for Charlie and all the other blessings out there like him. 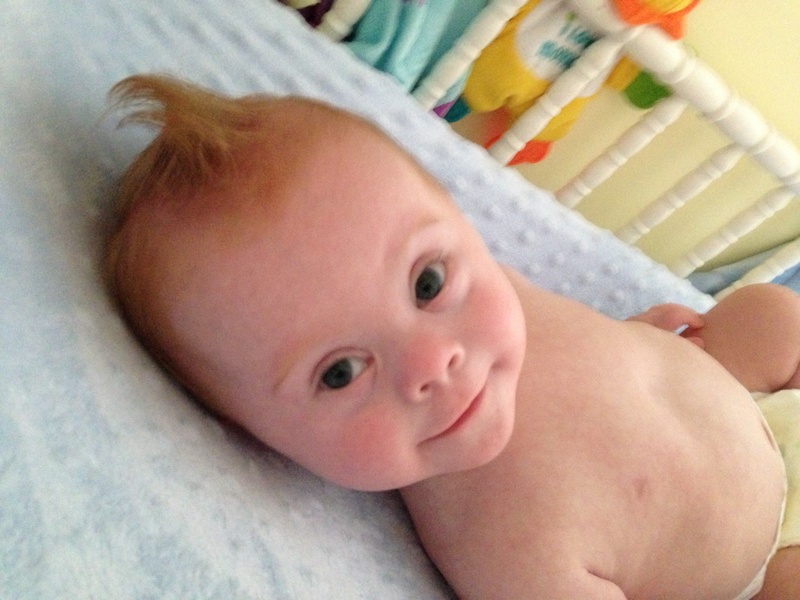 “oh, you’re not lucky”.. Like if it wasn’t lucky to have a son with Down Syndrome.. So I just want to say to that doctor and the rest of the world: YES, I AM ! I’m very lucky to have been chosed to be the mother of an Angel… because they are angels.. beautiful angels with everything that normal kids have. So I’m thankful to life. Now, I’m blessed ! just send my text way to fast… so maybe this on is better… sorry !! and thanks !! 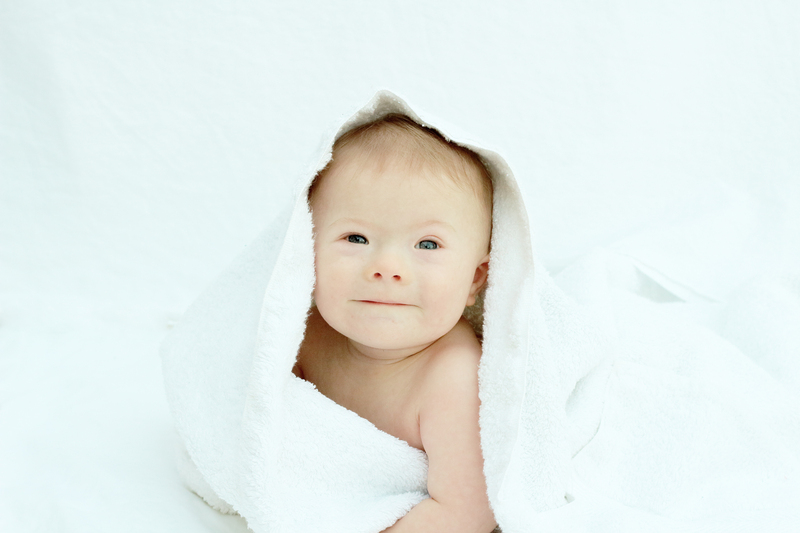 “oh, you’re not lucky”.. As if to say that it was unfortunate to have a child with Down Syndrome… I just want to say to that doctor and the rest of the world: YES, I AM ! I’m very lucky to have been chosen to be the mother of an Angel… because they are angels, angels with beautiful faces…I am thankful for my life. Today, I am blessed. Joey 27 Adults with down syndrome are capable of anything they set their mind to. 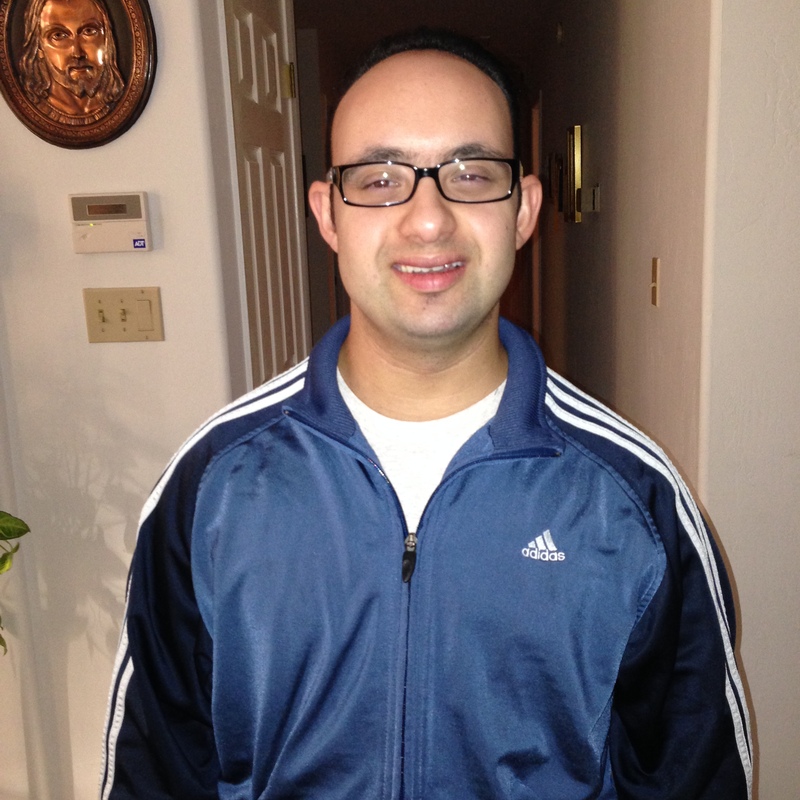 Joey has lost seventy pounds because he took responsibility for what he eats and started exercising. 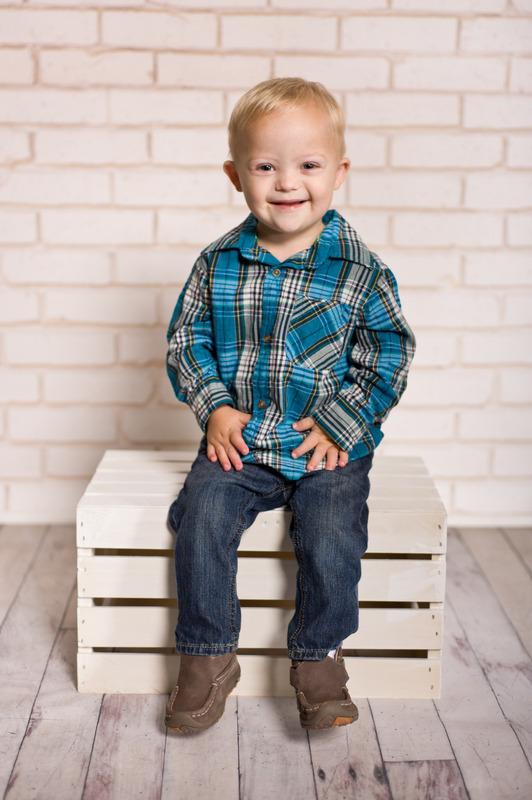 Just because my son is non-verbal doesn’t mean that he isn’t vocal. It also doesn’t mean that he does not communicate. I’ve never seen a child with so much personality, he just has to express it in different ways. He has a sense of humor, and he certainly shows it to you. He communicates through signs, gestures, word approximations, and by using an augmentative speech device. He gets frustrated sometimes, but that’s why we work with him to improve his communication. Do not underestimate him, though, he understands far more than he is able to verbalize. 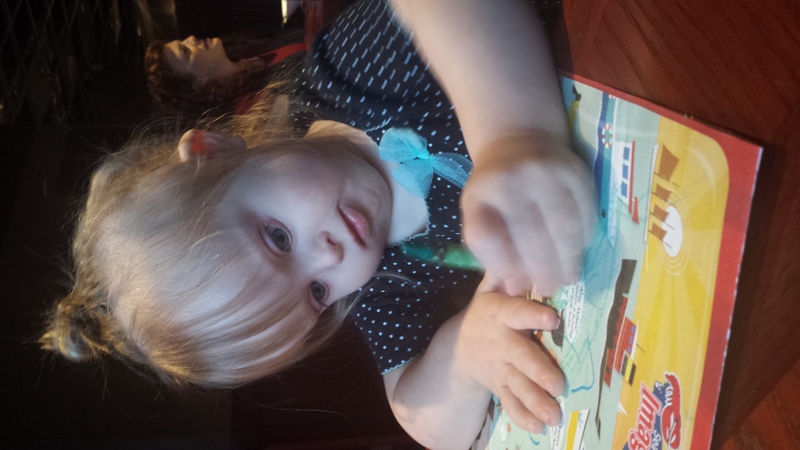 This is my beautiful granddaughter Bella, I would not want her any other way then with that extra chromosome that makes her so accepting of everyone. She is the funniest child I know, the most loving human being, she’s just sweet. I can’t imagine my life without her. 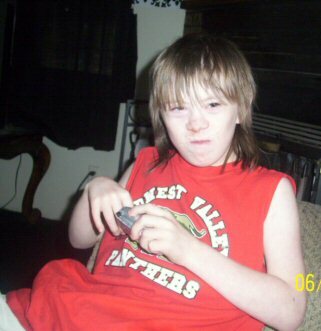 My name is Krystle, I am not a parent of a child with Down Syndrome, but I do have a little brother with DS. His name is Brennan and he is 9 years old. Brennan came in with a bang the day after my high school graduation! There was a storm and everything! 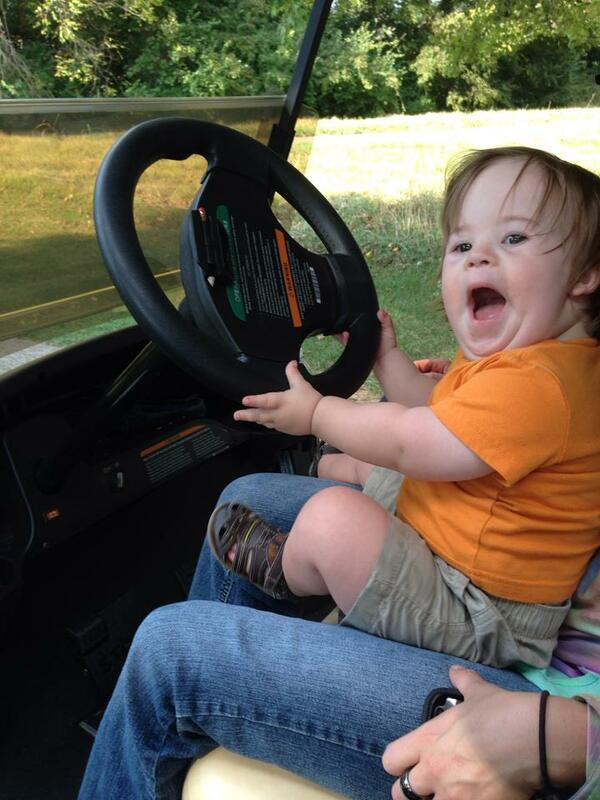 The thing that people don’t understand about children (or adults) with Down syndrome is their incredible ability to love and find joy. 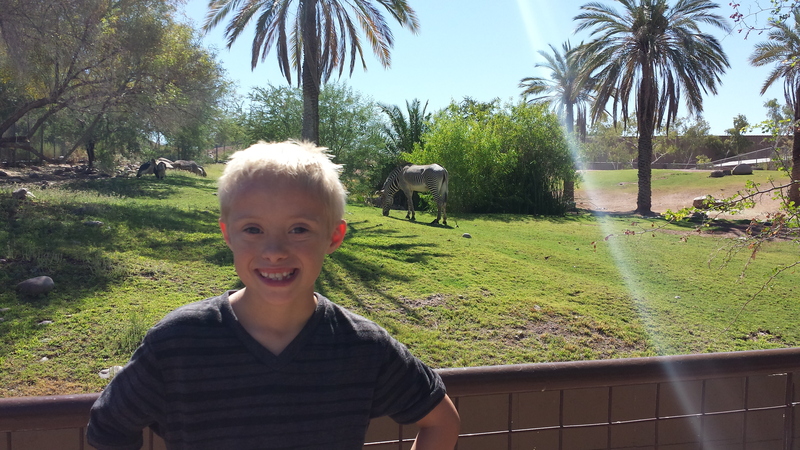 Despite his incredible stubbornness and mood swings (haha) he loves greater! Bigger hugs as he grows older, and bigger laughs with bigger smiles! He’s survived surgeries, heart and lung failures, deafness and near blindness (the boy finally got his glasses), and in the face of much adversity he still smiles. I am honored and blessed to have been given the title of sister to such a beautiful soul. And at the end of the day this is one thing I know… my life is forever more full with Brennan as my brother. 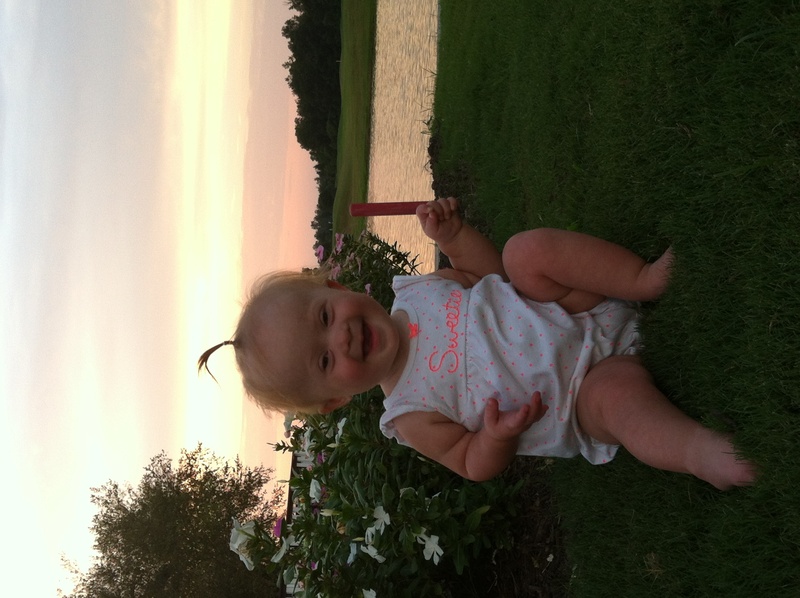 What people don’t understand about Down syndrome is that if you give them a chance you will never regret it. 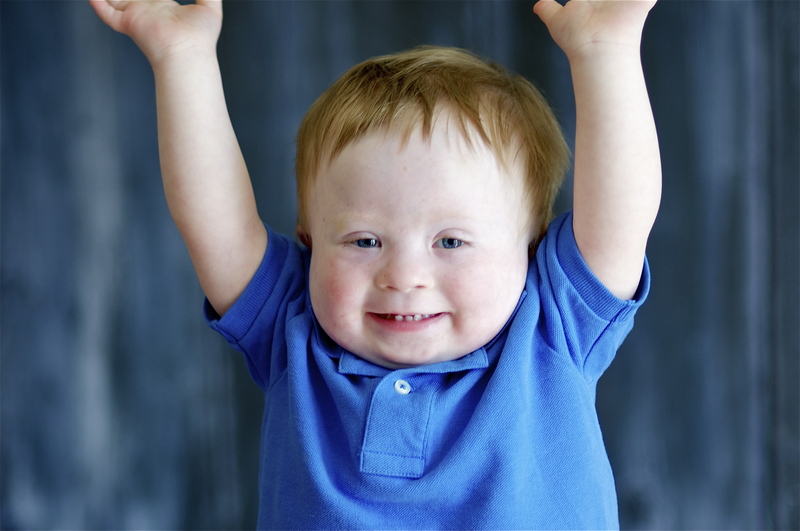 Individuals with Down syndrome tend to know much more than they are physically capable of expressing. 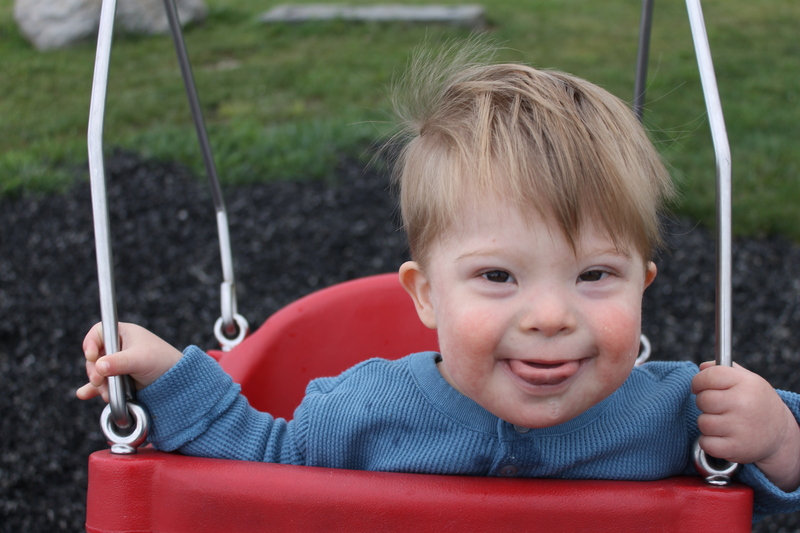 Low muscle tone can make it hard for kids with Down syndrome to control their tongue to speak clearly, but it does not mean they did not understand what is going on around them. Teaching an alternative communication method, like sign language or early reading (or both) can help parents and educators get a much better idea of where the child is developmentally. 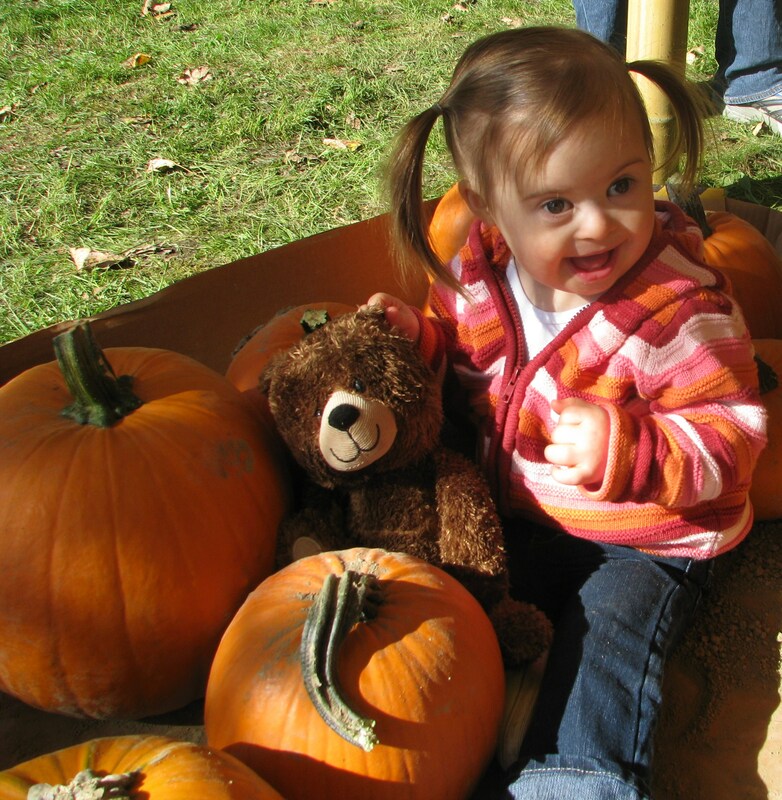 While every child is different, many kids with Down syndrome tend to learn best when the information is presented visually. So find what works for your child, set the bar high, and don’t be afraid to dream! What most people don’t get is that he understand everything, words, body language, feelings, even when he can’t speak clearly. And he loves to dance and make people laugh! 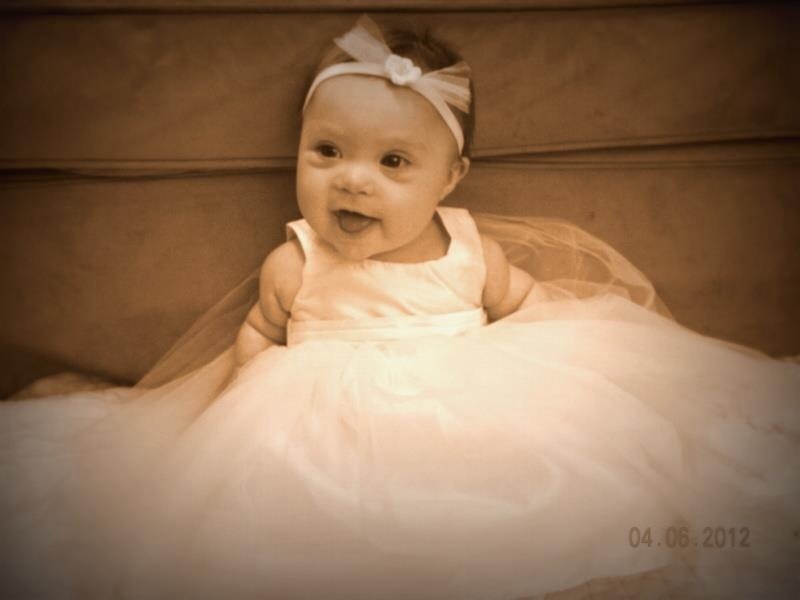 I wish more people understood that the reason I don’t tell them that my daughter has Down Syndrome is not because I am embarrassed or ashamed. It’s actually quite the contrary. Edye is so much more than her diagnosis and I honestly don’t think to mention it unless something comes up about her medical issues or her pt/ot/st therapy appointments. Edye is the most amazing little girl and lights up everyone’s life who knows her. You just can’t help but smile when she walks in the room! Hi, all. This is Ellen from the blog Love That Max; I also write for Babble, and I’m the one putting this story together. 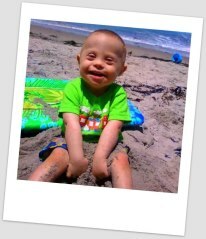 When I first told Rick my idea of doing a slideshow on what people don’t get about kids with Down syndrome, I’d mentioned 8 photos. But, whoa, there is no way I can only include 8 now. All of your photos, and your insights, are amazing. I am going to try and fit a bunch more. Seems like we need a separate website devoted to just this topic! Thank you so much for sharing. My son has a different diagnosis (cerebral palsy) but I relate to so much of what’s been said here. Thank YOU for doing this! I am so glad my son Mack isn’t alone and that there is support!!! All the comments make my heart happy! We don’t worry about the date! That you can, and more! WE ARE THE FAB FOUR! My name is Danelle, the proud mother of Caleb. Our boys are absolutely perfect. 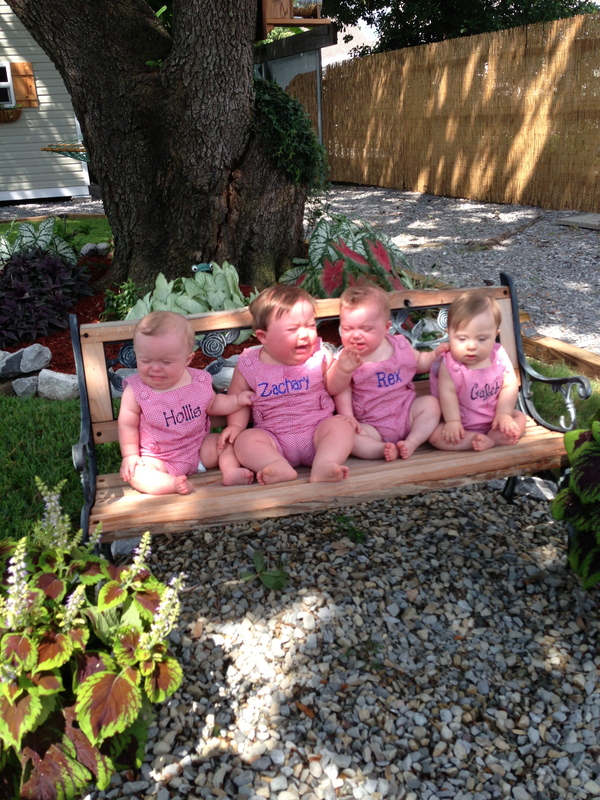 They may have a few more health concerns and they may not reach milestones in the same time as a typical child, yet they are perfect! I could not love my son and these three boys anymore. 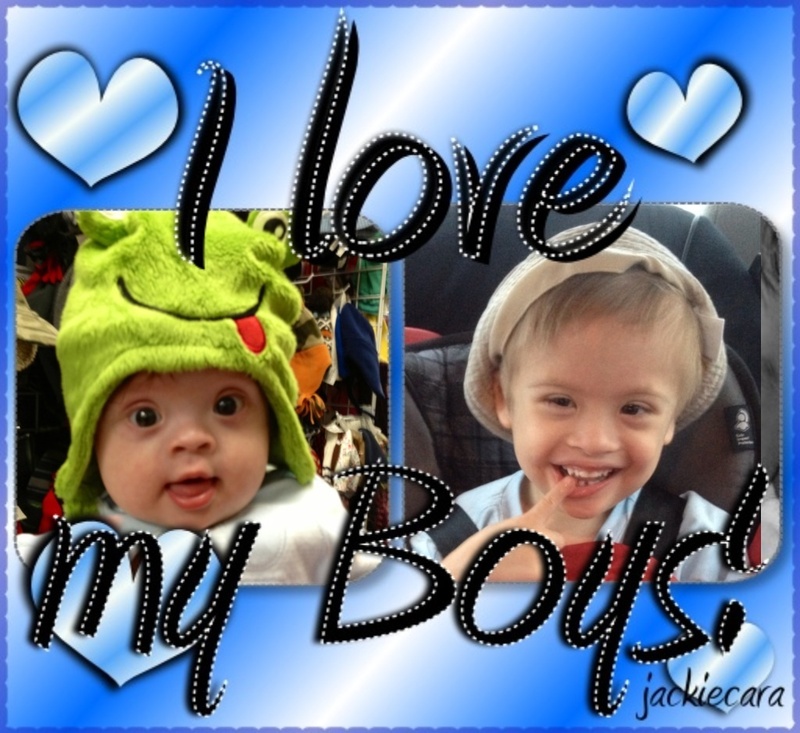 I love these sweet boys! Quote: We are all individuals. We are all UNIQUE. We all work hard to accomplish and achieve our goals! Meet Josiah, 21 months old. Some people just don’t get about kids with down syndrome. They are just like other kids!!!! They are not always happy angels. They have their temper tantrum moments too. Please look them as normal kids. I love my son and his two older sisters. He is 2 years old but he is a tiny little man – under 20 lbs. I still give him puree food because he doesn’t like any food with textures. 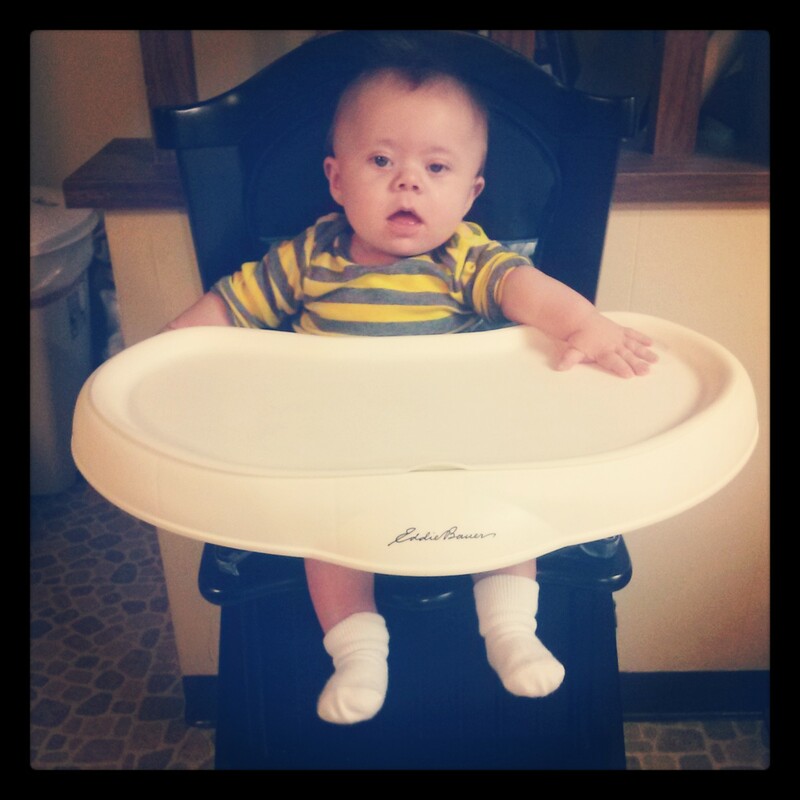 He goes to feeding therapy once a week now and hopefully he will eat like Noah – eggo waffles and apple sauce…. What some people don’t get is that Ryan is more LIKE other children his age than different. He plays and laughs, loves and forms bonds, hurts and cries, learns and explores, even gets mischievous and stubborn at times. I have the same hopes and dreams for him as I do for my other four children. He is. 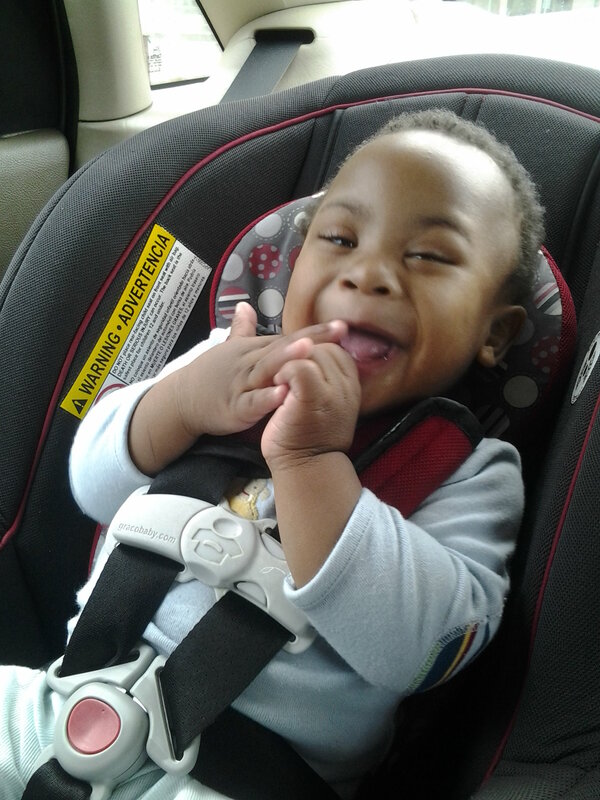 It just some kid with Down Stndrome, he is MY baby, MY joy, and so loved!!! Our sons name is Andrew (Drew) and is 13 months old. He is such a happy and joyful little guy. I want everyone to know that we’re more alike than different. Treat him like any other child; empathy, respect, understanding, encouragement, and LOVE. He can accomplish the world just like any other kid! Theo is 16 months old. We are from Brazil and he is the light of family. He changed our lifes in a complete way bringing joy and happiness to us (mother Catarina and sister Gabriela with 16 y old). I know your bright family …and I love you all ! God bless you . People have often said to me “I don’t know how you do it!” I find that a little weird; parenting is difficult regardless of a child’s ability. Would you say that to me about my son without D.S? 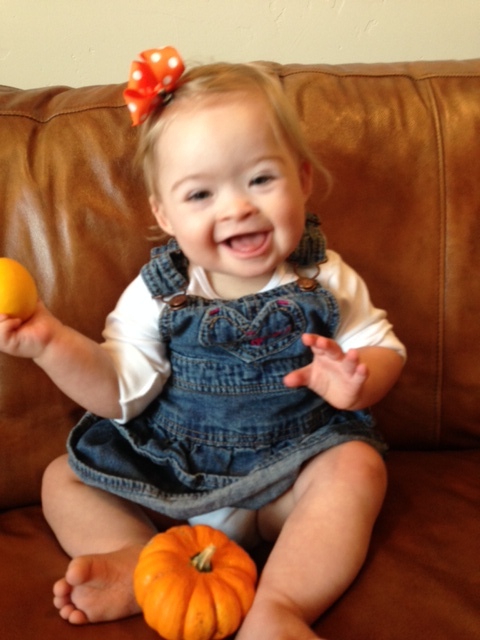 Being a parent to a child with Down Syndrome has been the most rewarding and awe inspiring part of my life! I feel privileged not burdened. My son’s name is Nathan Luka Caraveo, he is 2 years 9 months old, and is the absolute light of our lives. 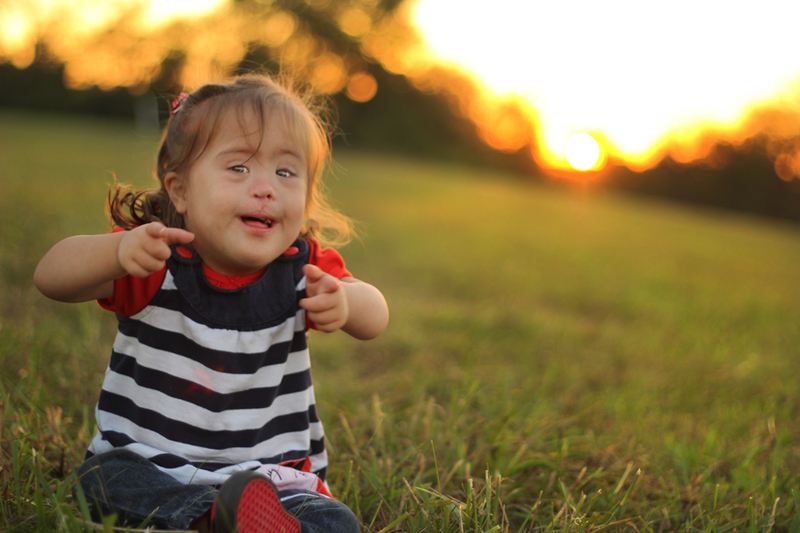 What most people do not understand or know about children with Down Syndrome is that they possess this incredible ability of making a person see life in a completely different way. These amazing children teach us to take a step back and appreciate life the way they do. My son has utterly changed my life and the lives of everyone who has had the chance to meet him. 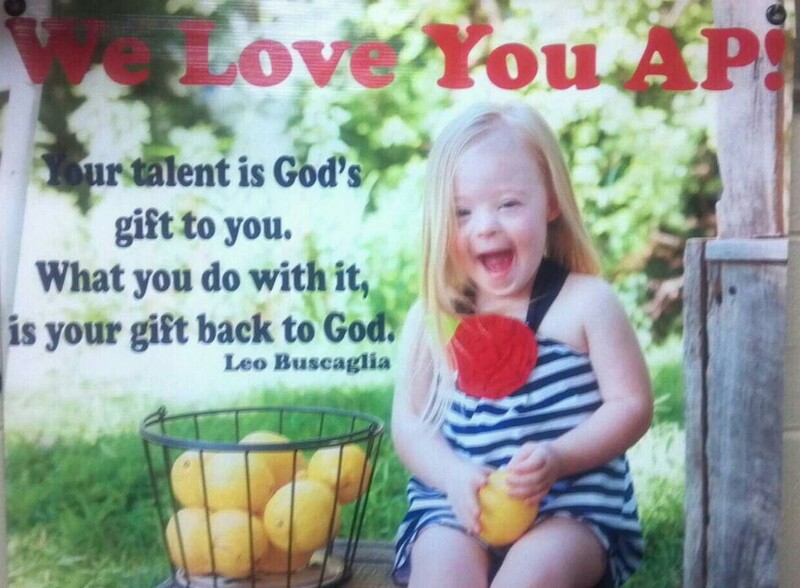 All individuals with Down Syndrome are gifts that keep on giving. Freddie is a Blessing and never a burden. 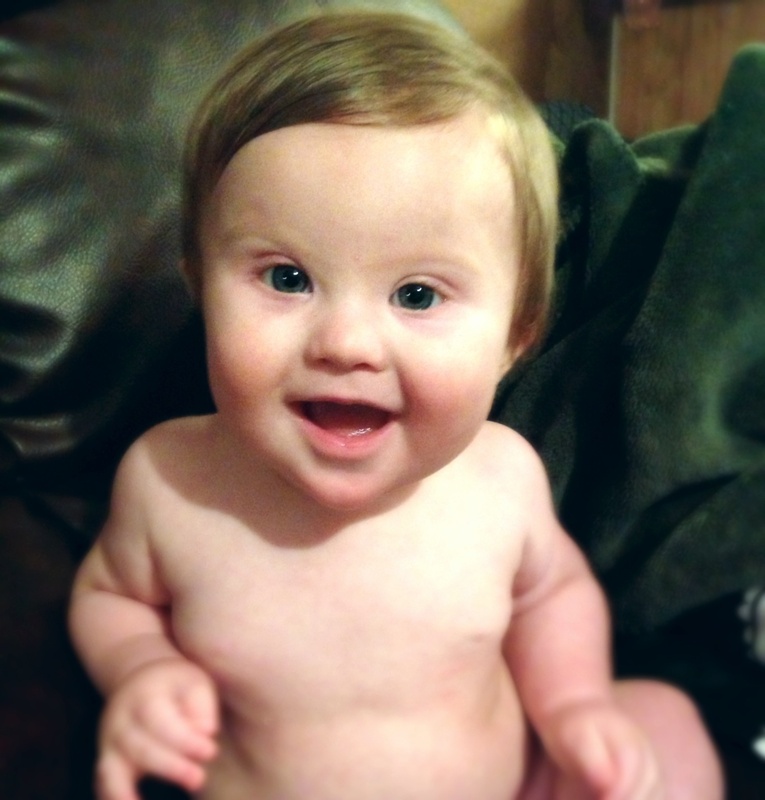 Freddie is Fearfully and Wonderfully Made Down Syndrome and all. Above all Freddie is loved! 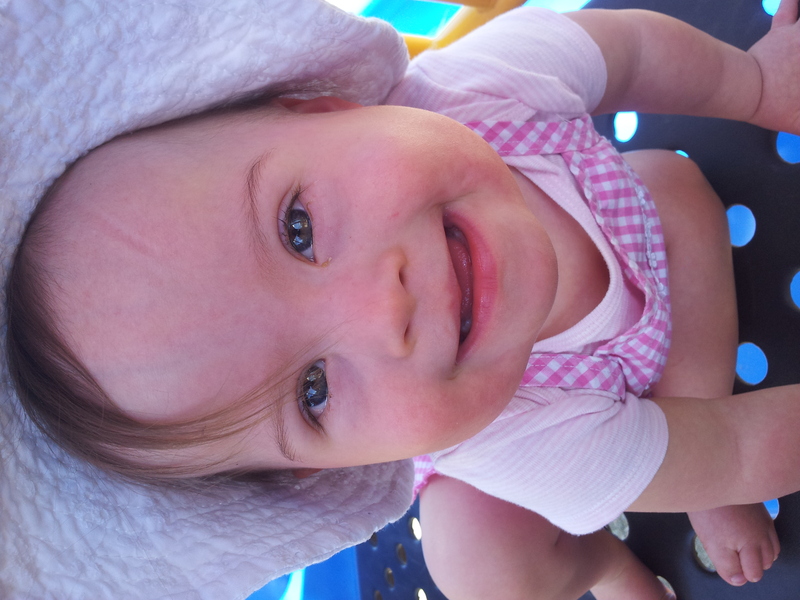 Often times people see the differences in people with Down syndrome rather than the commonalities. We are all unique in our own way, and we should celebrate that uniqueness. Not exclude people because if it. Quote: Don’t fear the unknown, you may find it is exactly what you never thought you wanted. 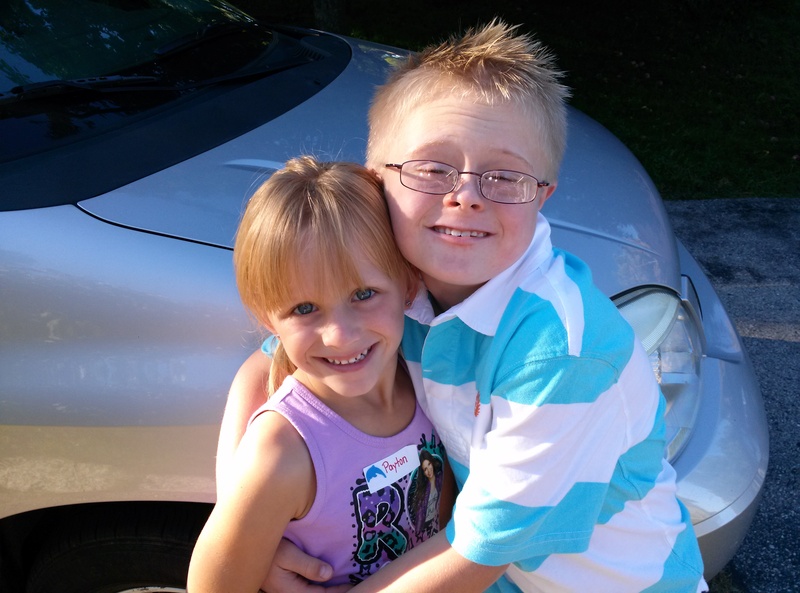 Jacob and his sister Abby are the light of my life, for being just the way they are. 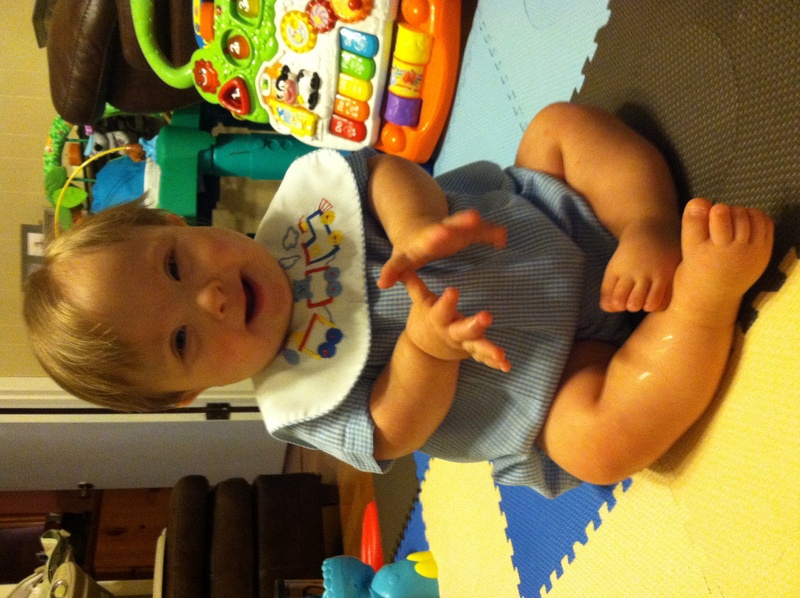 I may not be that far into my journey with Down Syndrome, but I am a better person because of Jacob. I look forward to the rest of our journey and all the surprises he will show me along the way. My older brother Michael is a huge blessing. He has taught me more about life and unconditional love than I could ever imagine. Michael is a very determined young man, a deacon at our church, a successful business man. Michael owns his own recycling business called Aloha Guys Recycling. He is so successful and never gives up, no matter what anyone says. Michael also doesn’t let anyone get in his ways when it comes to achieving goals. He is persistent, determined, and goal oriented. 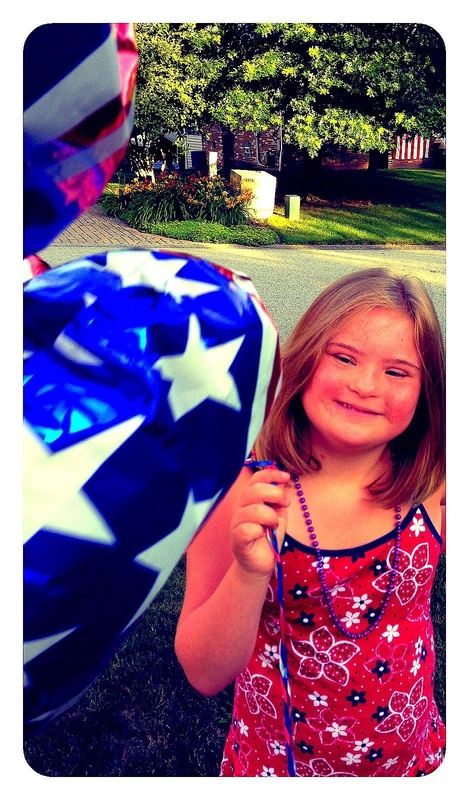 So much can be learned from an individual with Down Syndrome. 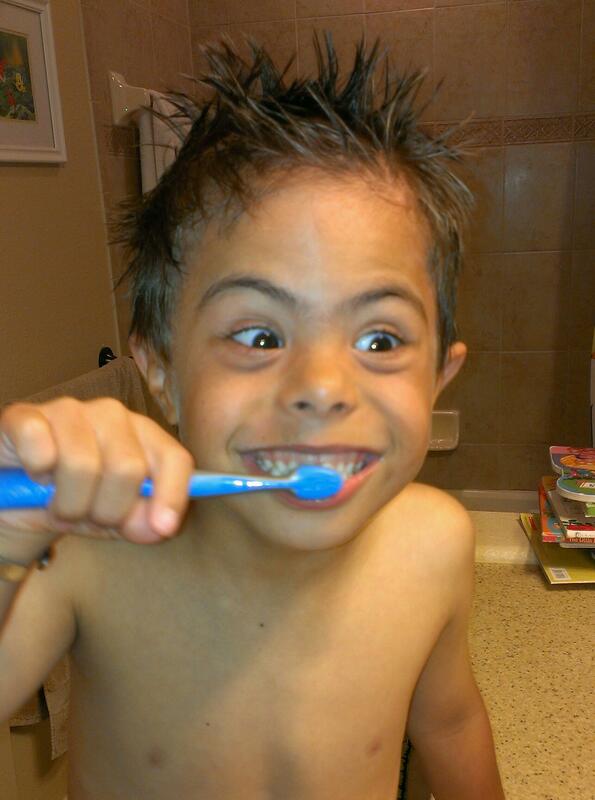 Down Syndrome doesn’t define my brother. He has defined his own life. Michael can light up any room with just his smile and bubbly personality. He is my Hero…I look up to him to be a more caring and loving person. Michael has also taught me to never give up on life! I am one blessed sister to have Michael in my life! I thank God for him everyday! I hope others will see that their are more to individuals with Down Syndrome than an extra-chromosome. He’s still just a baby (like every baby). This generation of individual’s with Down have exceeded preconceived stereotypes and most expectations. There is virtually no limit to what he can accomplish. I forgot to attach Isaac’s picture! So sorry! Hi, my little one is absolute joy. He is no way different from other kids. like all of us, he loves being cuddled, cries,smiles and laughs as well.There is no day when he doesn’t make his nurses smile when i take him to hospital for appointments.My boy has given a meaning to my life. he has changed me from a believer of God to a strong believer. Its undoubtedly a joy to have a child because I don’t see anything down in him. its all up syndrome as he cheers me up with his lovely smile. This is my son, Kyden. He is 6 years old. I’ll never forget one particular day that I took my son to the grocery store. As usual he was smiling and waving at the other shoppers as we passed them by. I was enjoying his typical outgoing charm and the usual happy response from strangers…until we reached aisle 5. You see, aisle 5 contained a mean, gruff, unapproachable looking man who was shopping for soda. Silently, I hoped my son would pick up on these vibes and take a temporary hiatus from his usual greetings. As our cart rolled past the man, my worst fears came true as Kyden began waving extra-enthusiastically and even shouting “HI”!! Not immediately, but after several of Kyden’s acknowledgements, the man looked up and smiled warmly. His eyes even seemed to become a bit watery as he greeted Kyden in return. Suddenly, I felt compelled to offer a kind “hello” to this man as well. As I turned the corner down aisle 6, I couldn’t help but wonder if Kyden’s greeting had been the only one which that man had received in quite some time. Based on the man’s unexpected response, I was actually pretty sure of it. I realized that I was placing limits on my kindness; limits which Kyden didn’t seem to possess. My son had taught me an invaluable lesson about widening my perspectives…which is EXACTLY what I advocate for on a regular basis for Kyden. Having an open mind and a heart of acceptance must go both ways. 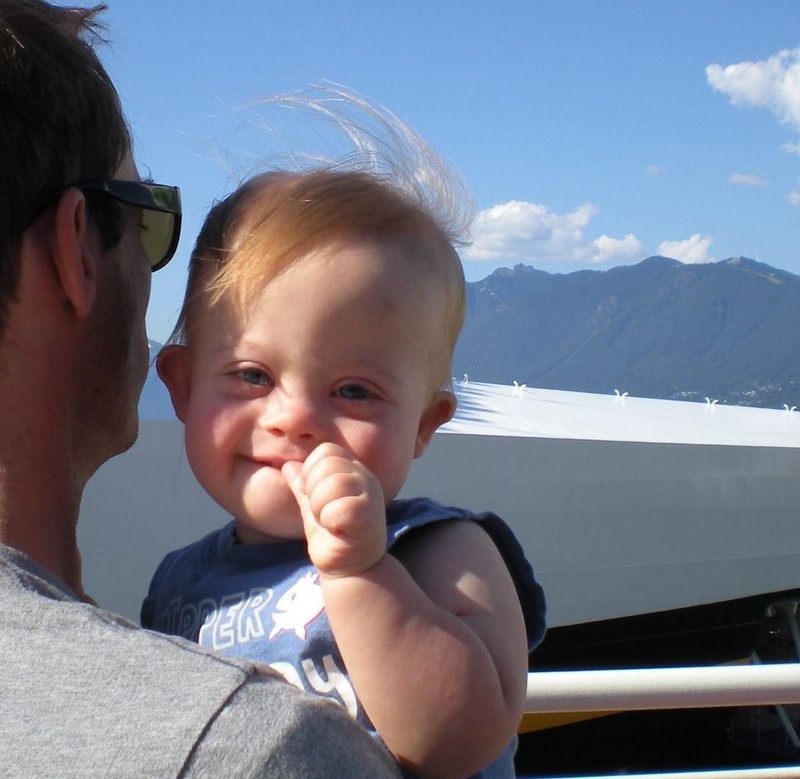 I want people to know that my son and others with Down syndrome are not just flat – happy people, in fact as a new parent that thought horrified me. 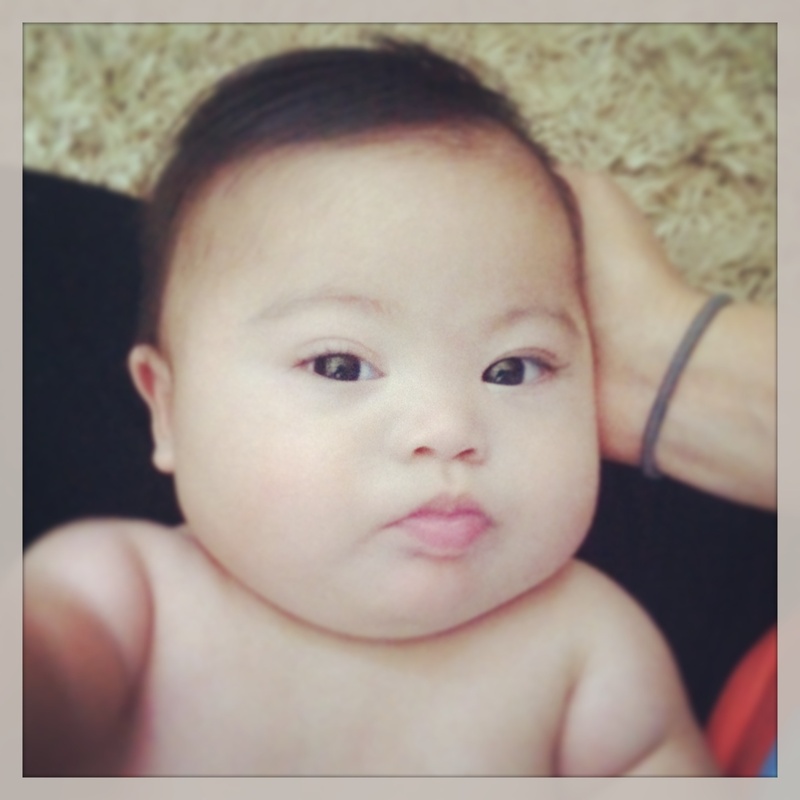 People with Down syndrome are as complex, and socially aware individuals as any one of us typical people. 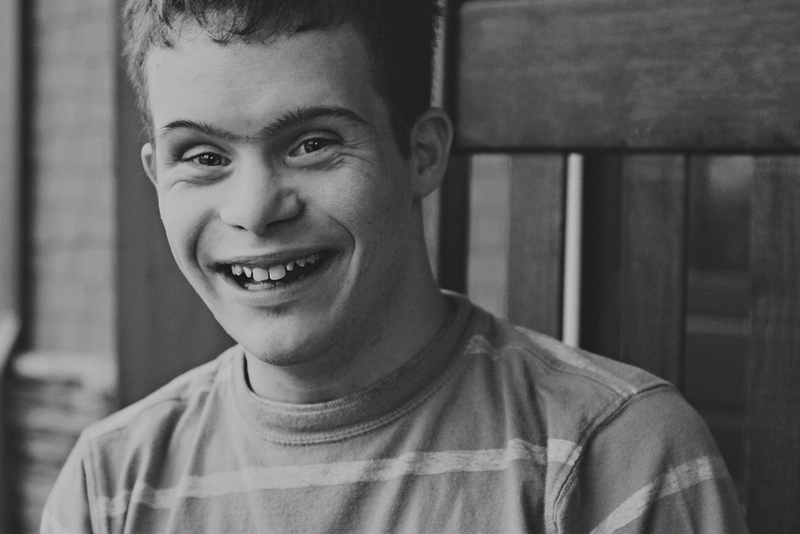 I have now had the privilege to meet individuals with Down syndrome who embody such a variety of personalities, the grumpy old man, the defiant teen, the shy tween, the mischievous sister, and with everyone I meet I’m not disappointed to find they are just like you and me. Sam can win a staring contest, hands down! When he looks at you, he studies everything and takes in so much more than you will ever know. 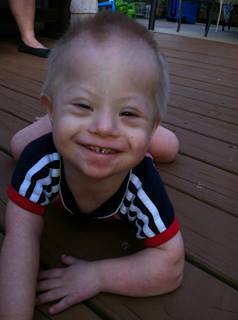 One thing I notice about most people with Down syndrome is that they will truly live life to the fullest if given chance! 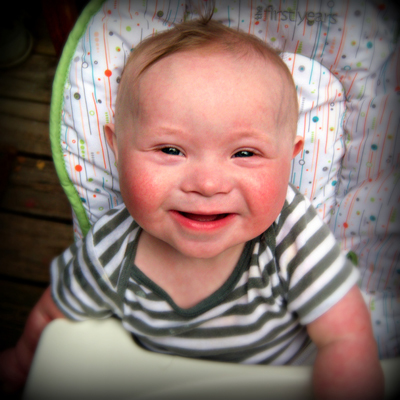 I’m so thankful that God gave Sam to me…my life is changed for the better….forever. Sorry the picture didn’t upload earlier. While his smile can quickly light up a room or make any day better he is not always smiles and laughs. 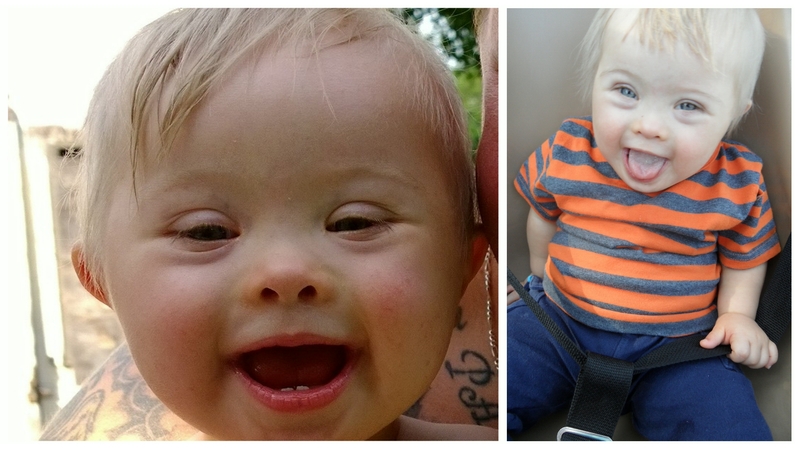 He is more alike most 2 year olds than different and kids and adults with Down Syndrome have their ups and downs like all of us! 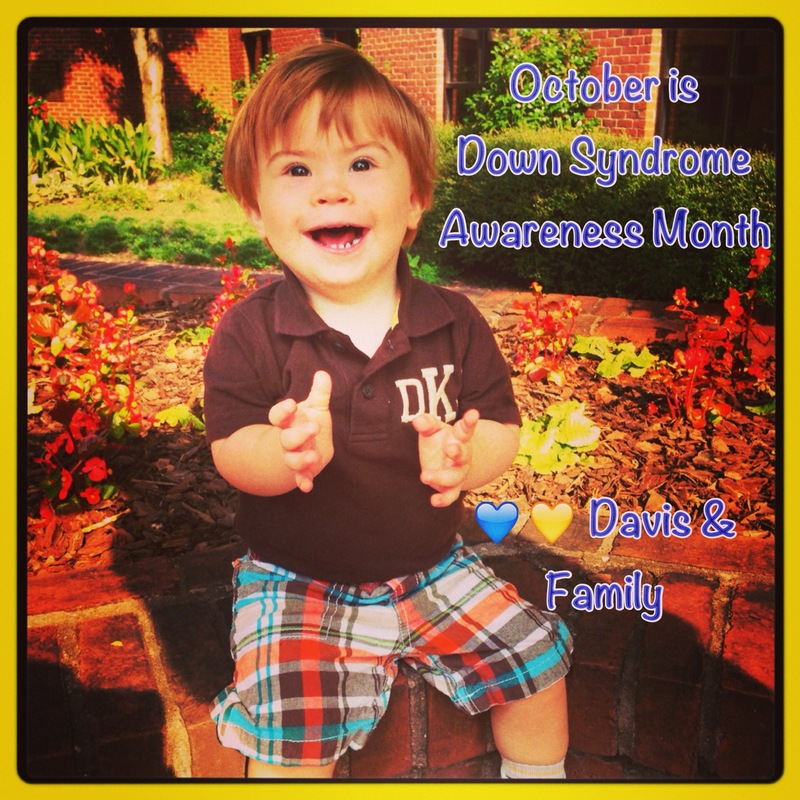 Happy Down Syndrome awareness month to all! Here’s to making the world a better place for everyone! This is Jonathan. He is 2.5 years old. I find that the most common question is why is he so delayed in his walking compared to his twin brother, Antonio? I answer them that Jonathan is like any other individual. He has his own mind. When he makes up his mind to walk, he will! 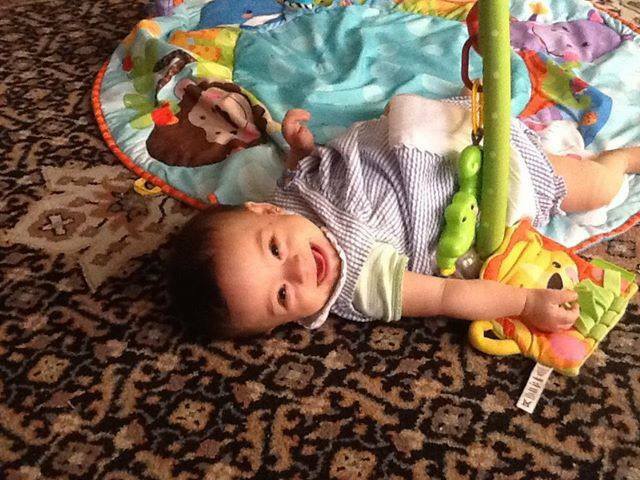 Until then, he enjoys crabbling and crawling at lightening speed and lighting up the room with his smiles! Hello! This is our wonderful son Finn and he is 9 months old and such a great little boy! 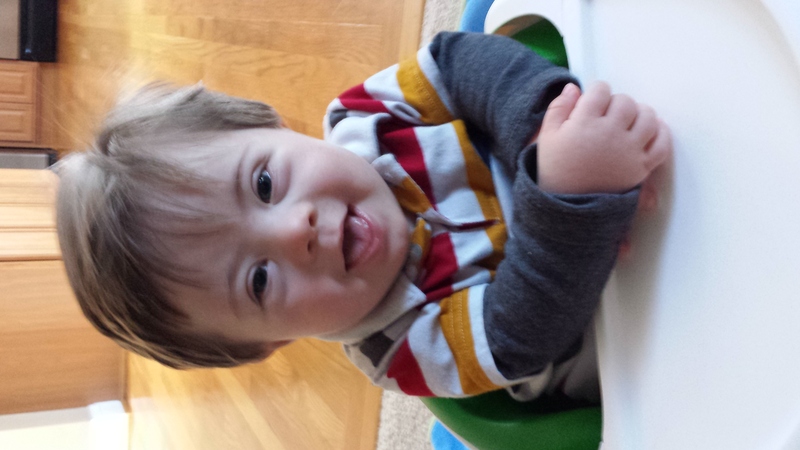 What people don’t get about kids with Down Syndrome is that they really are just like any other kid or baby. And their parents have the same hopes and dreams as they would for any other child and you should treat them as such. Every new parent just wants to hear the same thing, congratulations on your new beautiful baby because they are beautiful kids! 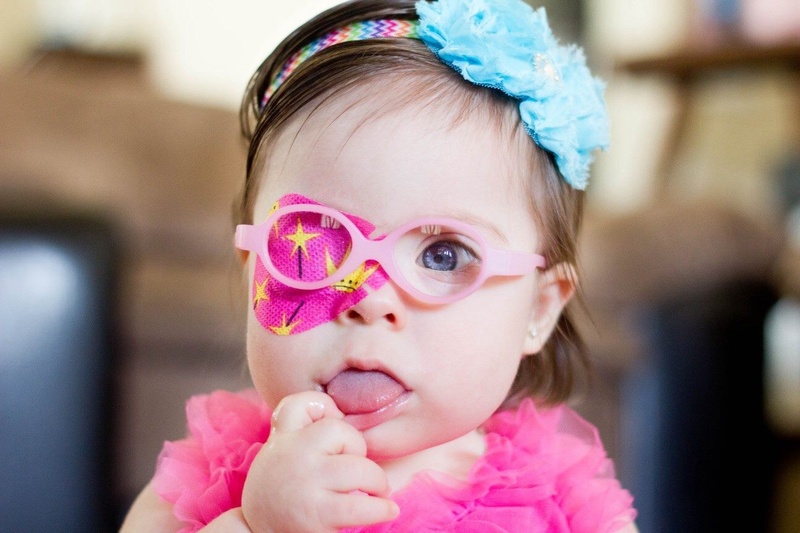 Quote: When I tell people that Georgia has Down Syndrome, their first response is “oh I’m so sorry.” And I say…”Why” I think people who are not familiar with DS think that it’s some terrible disease. When it’s really not that at all. My daughter is awesome and amazes me every day. She is such a blessing to me. He’s still just a baby (like every baby), and there’s no need to fear the little differences. This generation of individual’s with Down have exceeded preconceived stereotypes, and most expectations. There is virtually no limit to what our children can accomplish. This is Hunter, and he is 18 months old. 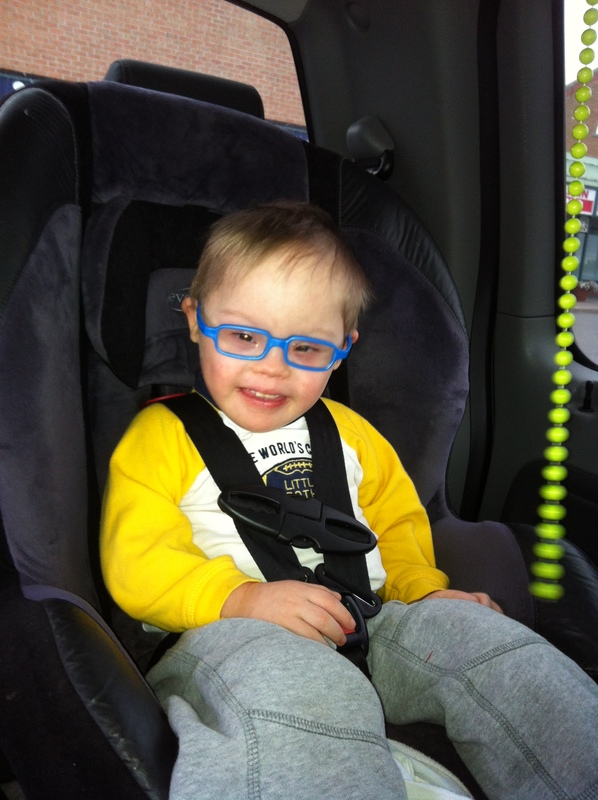 Hunter is not a Down Syndrome Child, he is not Downs, and he is not a “downie.” Hunter is Hunter!! He is who he is first. 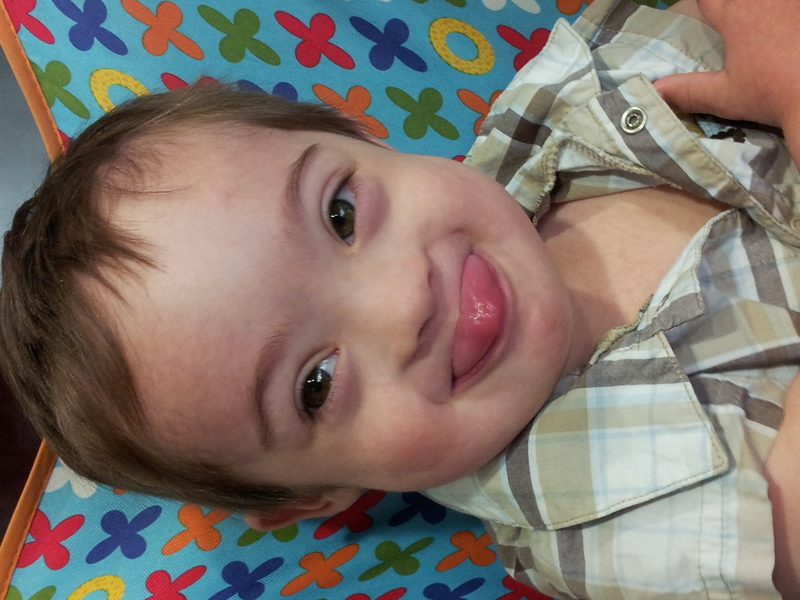 Down Syndrome is just a diagnosis, and is secondary to who he truly is! 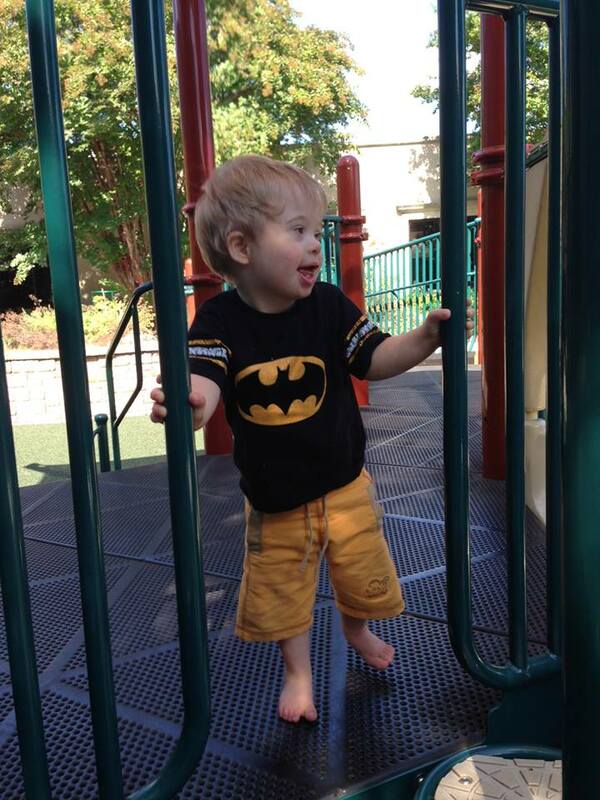 I want people to know that just because a child or an adult has Down Syndrome doesn’t mean they are all the same. 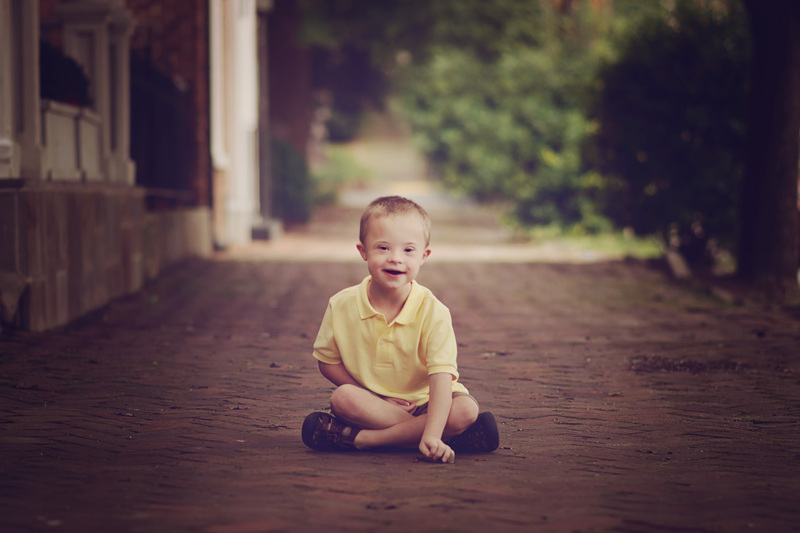 Each person whether they have Down Syndrome or not have their own personality. 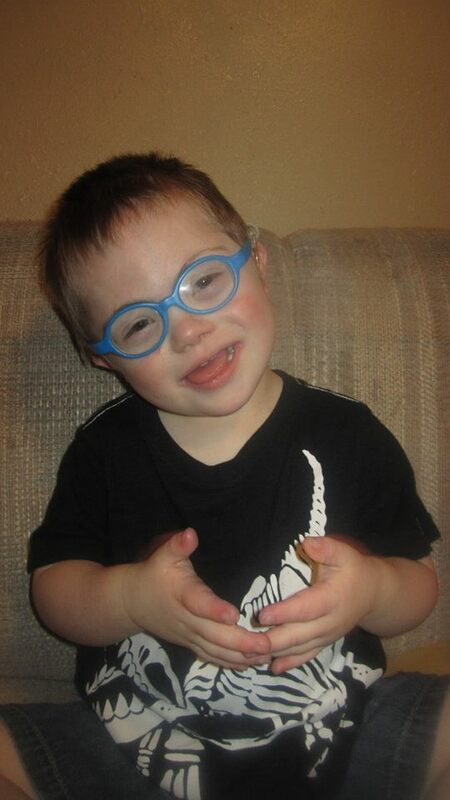 Don’t discredit a child or adult with Down Syndrome until you get to know them they can and will surprise you. 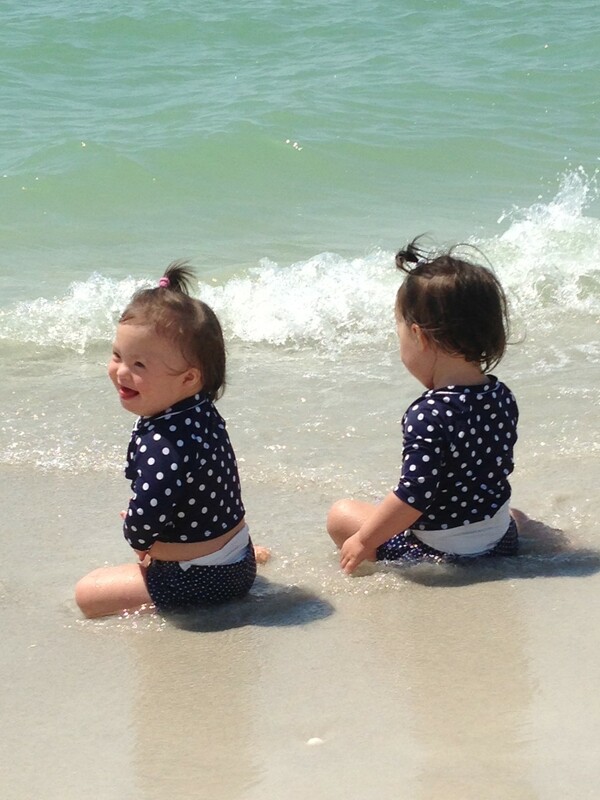 I have twin daughters – Harper & Micayla – who just turned two. 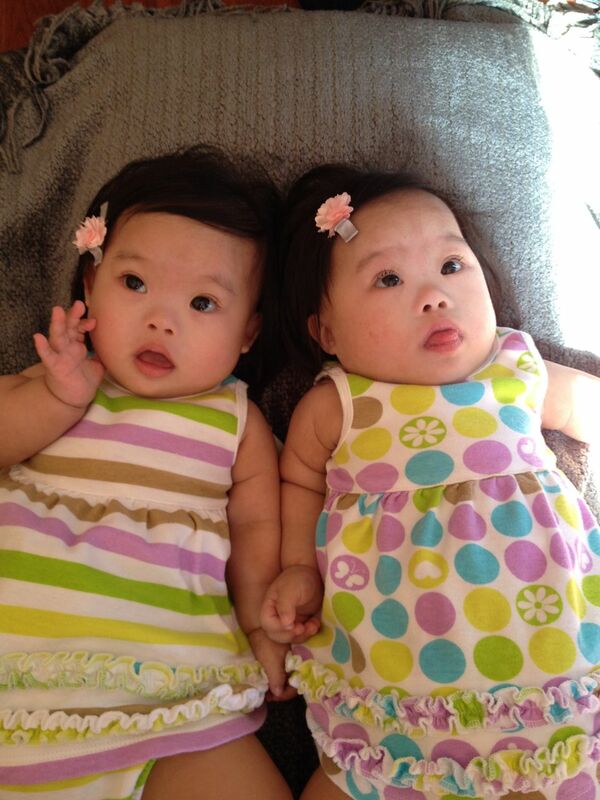 Both of my daughters have Down Syndrome. What I have learned is that many people are not aware there are different forms of DS – each unique. Raising my girls has provided me with the great opportunity to educate people on the different types of DS, and while each type has its own characteriestics, they all share the common element in that our kids are also “typical” in that they like to have fun, and grow and learn on their own schedule like any other child. 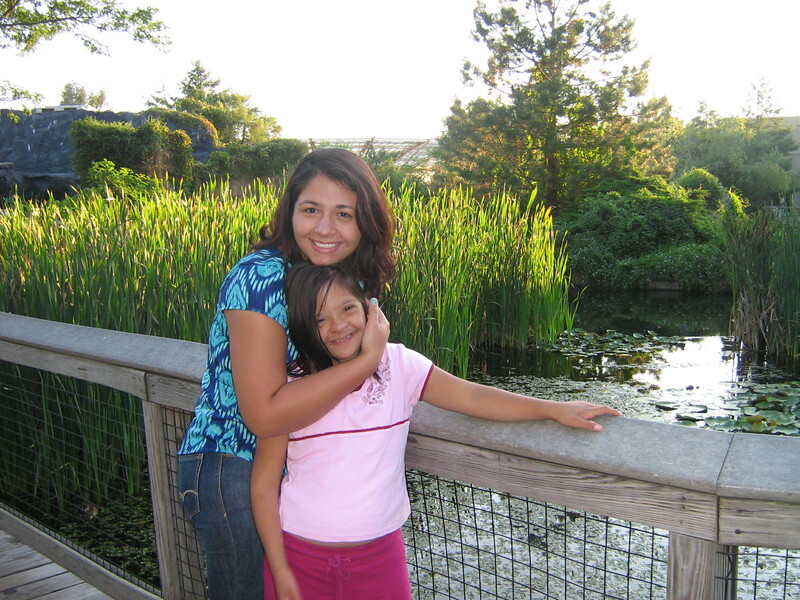 My daughters have provided me with the opportunity to educate and help remove stereotypes. 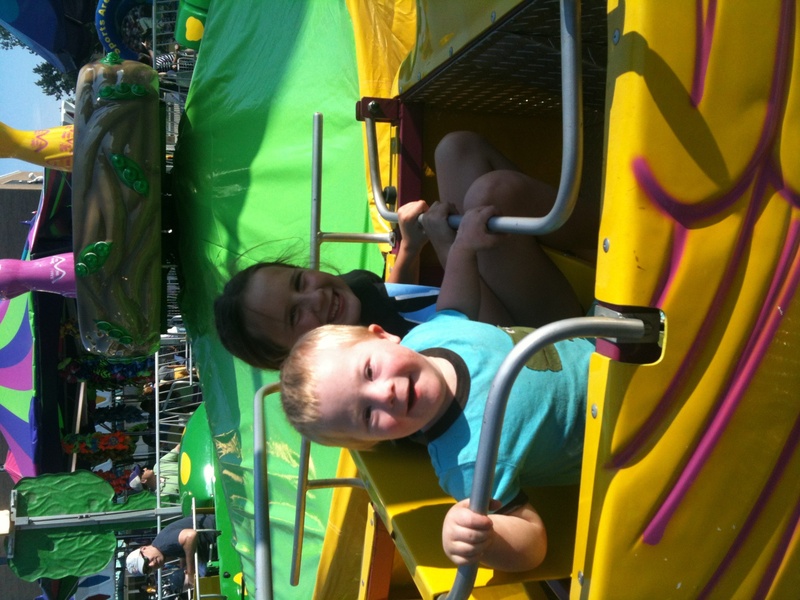 Don’t forget that 97% of siblings of kids with Down syndrome say it has made them better people. 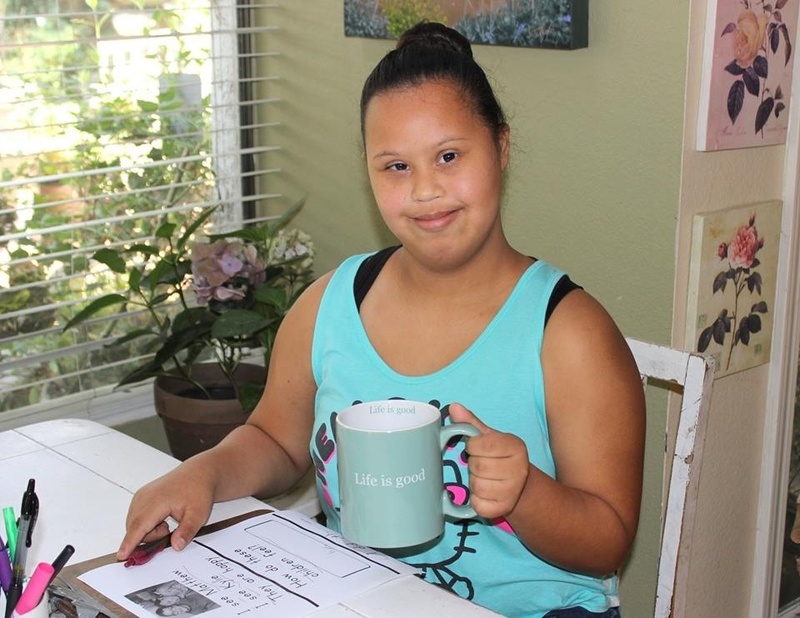 Having a sibling with Down syndrome made Gabbi want to become a nurse. Meet Shaun James or “S.J. as his friends and family like to call him! My husband and I just want the world to understand that our son is just like any other 21 month year old little boy. 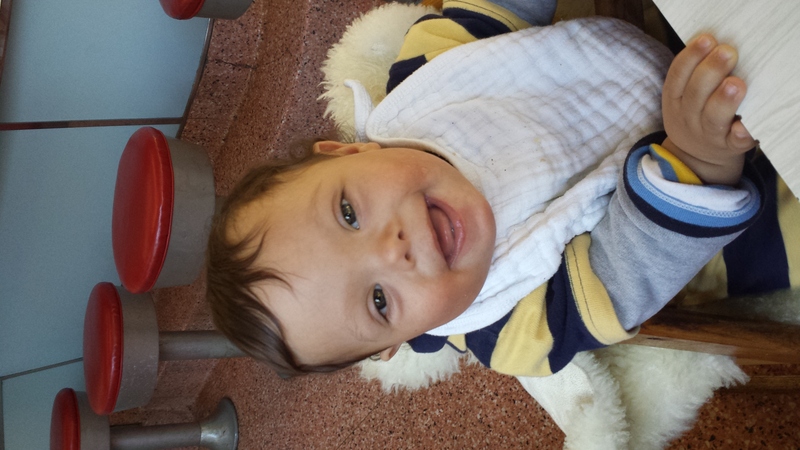 When we first got the Diagnosis after he was born we were shocked and scared and cried for days. 21 months later we are in love and blessed beyond words. I feel ashamed now that I even felt that way. I know in my heart that its normal to be scared and worried what to expect at first. S.J has met every milestone. Yes it takes him a little longer, but watching him work so hard and have the determination and then to watch him succeed is priceless. I just want all parents that get a prenatal and postnatal diagnosis that its going to be ok. Our son has made us better in everyway possible. 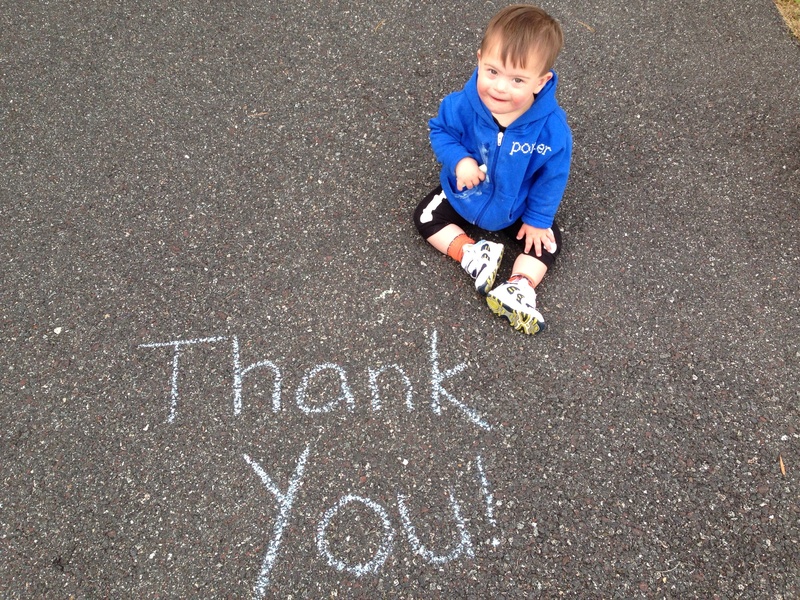 I want the world to know that children with down syndrome can do anything with a little love, acceptance, and kindness. Everyone told me that my son probably would not walk until he was 2 maybe 3. My son walked at 17 months and is almost running!! Thank you to people like Rick Smith and Babble for spreading awareness with projects like this. We are blessed beyond words and the world needs to know it!! 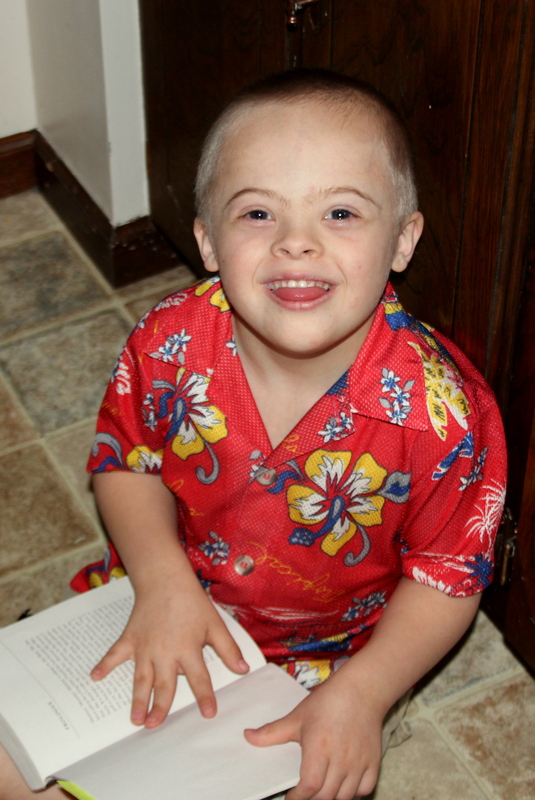 •Not only are children with Down syndrome teachable, but they are amazing teachers as well. My son has taught us to look at the world in a whole new way. He has taught us to be appreciative, patient, loving, understanding, and compassionate. We love you guys! Thanks for all you and your family do. She is the gift you never thought you wanted, but then realize you could never live without it. It is life changing, and your heart will grow in ways you never thought possible. It is amazing how she can make you look really good, even when you don’t feel like your life deserves to look that way. It is a certain sparkle that she brings to your life. It’s hard to explain, but even when you feel like you are in the darkest level of despair, the sparkle never ceases to shine. Your inner self loathing will disappear because she loves you without abandon, and she will bring amazing people into your life who also love fully and deeply. Sometimes people think n even say that DS are retarded or even call them mad….but I say that actually they as really the real angels due to them the world still survives. 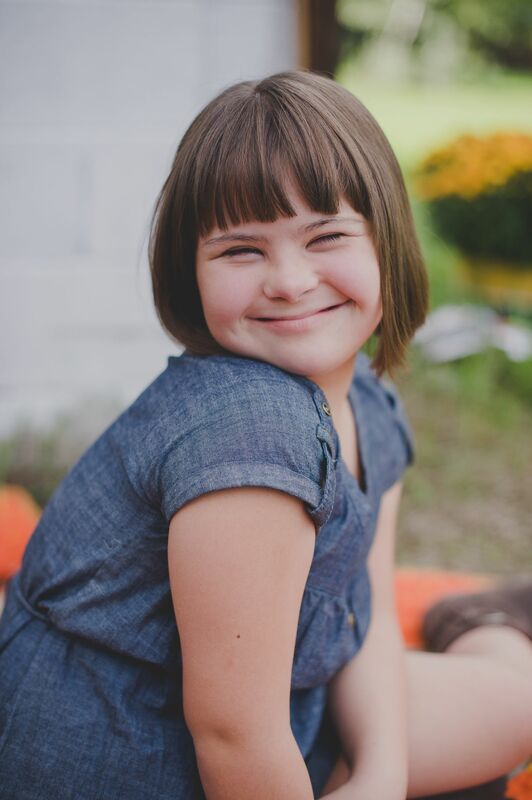 A quote about what people don’t get about kids with Down syndrome: The ting that I find amazing about my daughter is her determination. I look at her when she trying to pull herself to a standing position and I see that look in her eyes , that s he will do it and master it no matter what. I feel that she is telling me never ever underestimate what I can really do or achieve. Hi I wanted to share a picture of my son Kolston. He is 15 months old and is truly a blessing. Something I think alot of people don’t know about DS is that they can actually do anything anybody else can do. I know when we had Kolston we didn’t understand ourselves or really know what to expect with our son having DS. Everything you read is scary and you don’t realize everyone is different even us. We love Kolston more than anything and love watching him grow with our girls. His sisters absolutely adore him! My daughters name is Lucia. 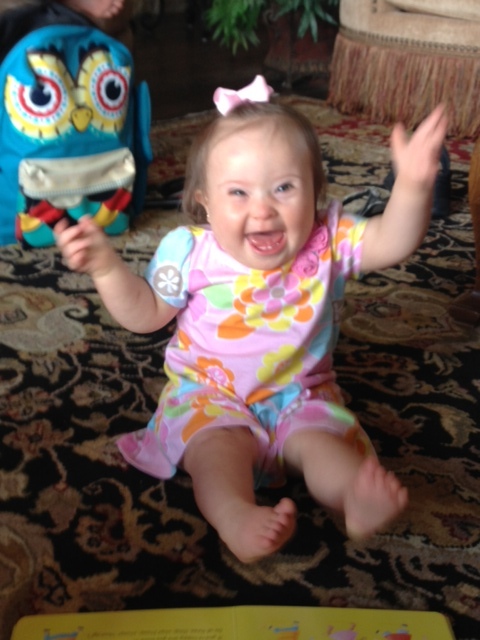 There is nothing special about my child with down syndrome and yet every bit of my child is special to me; much in the same way as there is nothing special about my “typical” daughter and yet every bit of her is special to me. They are each unique, they each will face specific challenges and they are both loved immensely. People don’t get how proud I am of my little guy. How he makes everyday of my life so much brighter. Occasionally, when we will be walking down the street, I will feel people’s eyes on us. And they give us looks filled with pity. I want to shout at them “don’t pity me, he is my child, he is my joy, and I love him like any mother would love their child”. But instead I just smile and let James show off his lovely personality when we pass, and he says “hello” with a huge smile. I wish people would take time to get to know him and not be frightened by his differences. He is a human being just like everyone else and and has his own unique thoughts, desires, feelings, and quirks. He is perfect just the way he is. As a parent with 2 little guys with DS I just want everyone to know that it’s not as hard as everyone thinks it is. Just given boys a chance and they will win you over. Joey, age 9. Joey is an awesome son, brother, grandson, nephew, friend and student. Joey does everything his siblings do. Joey is an excellent speller and speaks very well. 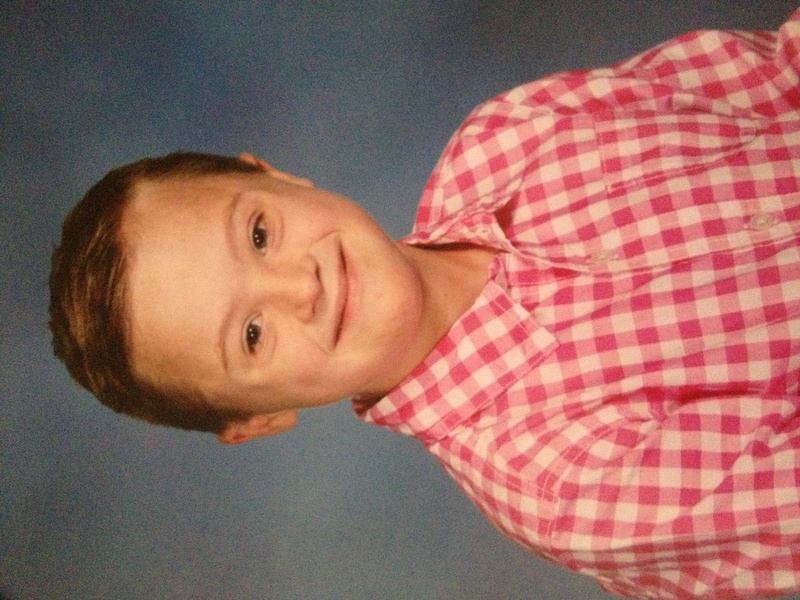 Joey swims, runs, bikes to school, bowls, plays basketball, 4-square, martial arts, rides horses, track and field, yoga and loves music – playing drums,guitar and piano. Joey rocks our world and we are so blessed! 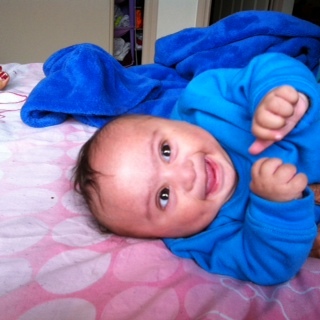 Our son Dylan is 4 months old and he is the best baby in the world. Every person grows up to be a unique individual, so why should Dylan be any different. Too many people probably feel sorry for us as if he’s a burden or “broken”. Nothing can be further from the truth. Every child will be challenging at some point. But he will be loved and adored like any son should be and he will grow up to live a fascinating and rich life that, in his eyes, will be just as amazing as all of ours. All we can do as parents, family, or society in general, is love him and give him the best opportunity to be all he can be; nothing more, nothing less. 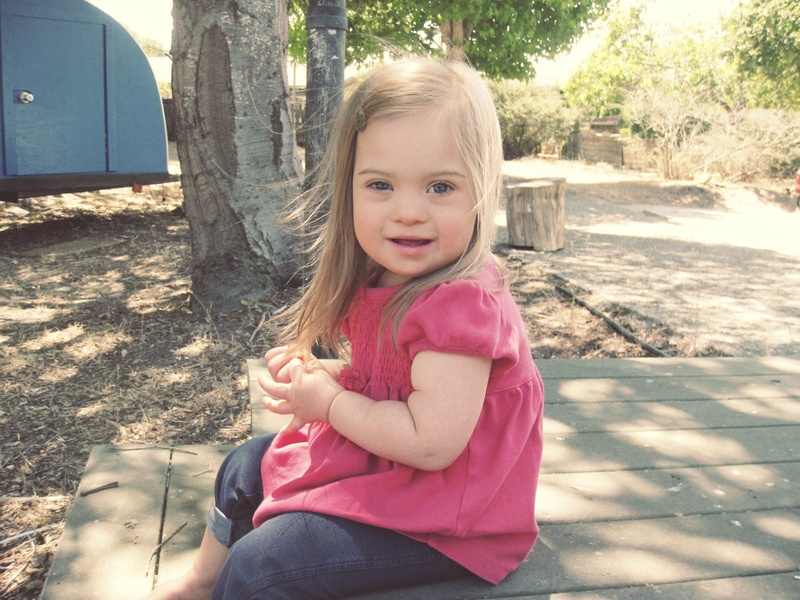 What people don’t get is that despite some different characteristics, features, and challenges; Down Syndrome is just a title however they are indeed PERFECT. Not many people can light up a room when they smile? Their courage, strength, and will power to never give is a Mind Blowing. I am in love with all these beautiful faces above, it makes me so happy to see all of them! This is Boaz and he is 2 years old. Boaz also has Type 1 Diabetes. 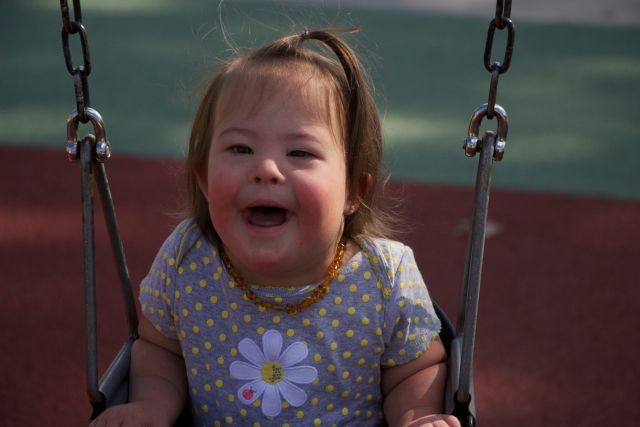 Most people think that children with Down syndrome are always happy, but that is not always true. Boaz does have a joy that he spreads like wildfire, but even so, he can fuss and pick on his brother just like every other child. 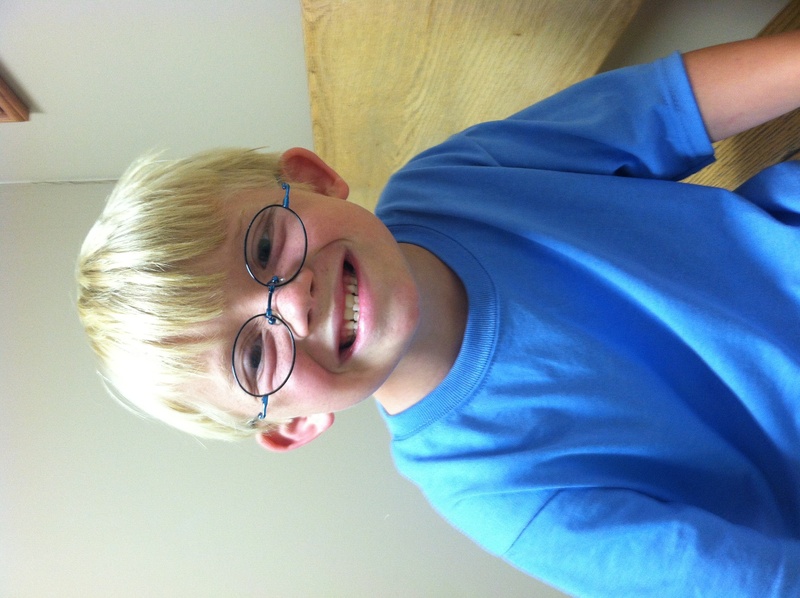 We love Boaz so much, he is the strongest little man we know! It is not about “Inclusion”, it is about being “included”! It is not about “Inclusion”, it is about being “included”! 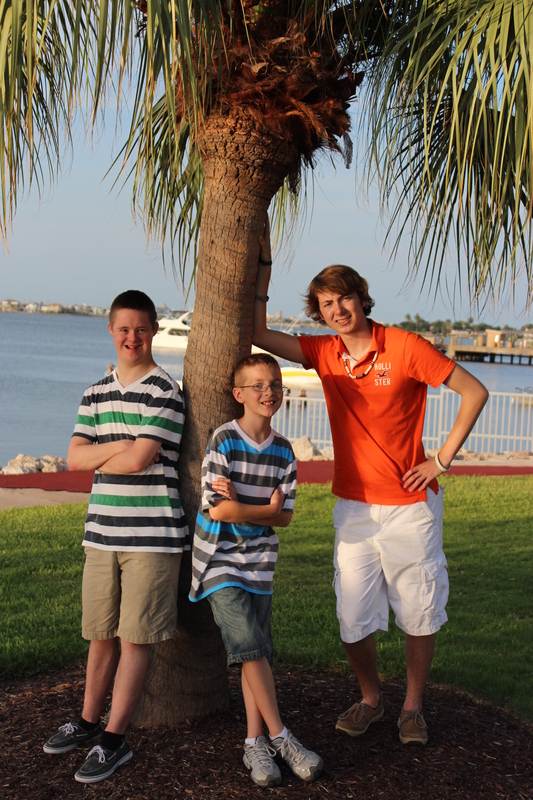 Dane with his brothers, Zach (17) and Joseph (11), who always INCLUDE Dane! My daughter’s name is Janalynn Burns. She is 2 years old. 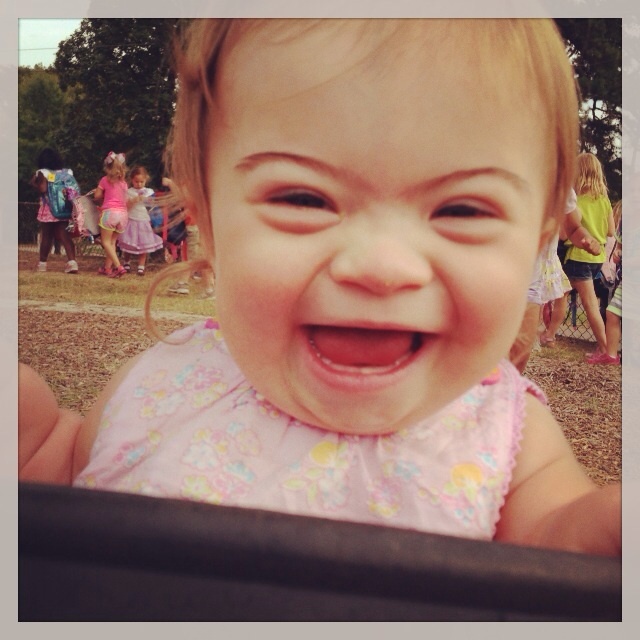 One thing people don’t get about Down Syndrome kids is that they are so loving. When someone we don’t know smiles at Janalynn she wants to go to them and give them a hug. Walking through the store she waves at everyone and says “Hi”. And when they don’t see her she keeps waving and saying “Hi” until they say “Hi” back. She is always putting a smile on people’s faces. And that’s how it has been with any person or child I have encountered with Down Syndrome, always the most loving people I have met. It is not about “Inclusion”, it is about being “included”! 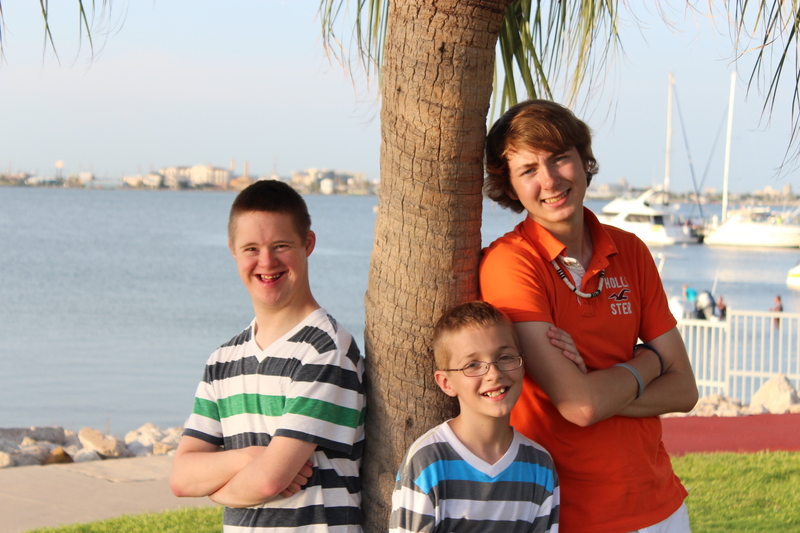 Dane with his brothers, Zach (17) and Joseph (11), who always ensure that Dane is INCLUDED! The thing that people don’t realize is my son is the biggest flirt and bats his beautiful brown eyes to get every girl to smile! 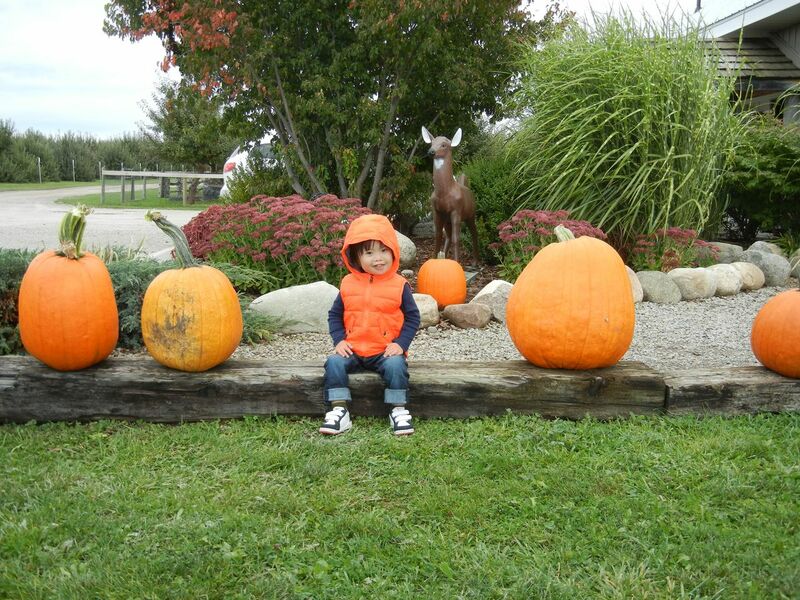 Please add this picture to my comment…..
Hi, my son’s name is Eduardo, he’s a 3 yr old beautiful, perfect little guy. What people doesn’t get about Lalo is that he is not sick or abnormal he is just teaching us a new and wonderful way to live. We are the privileged ones because he is the one who chose this family to live with and we are very grateful he came to our lives. 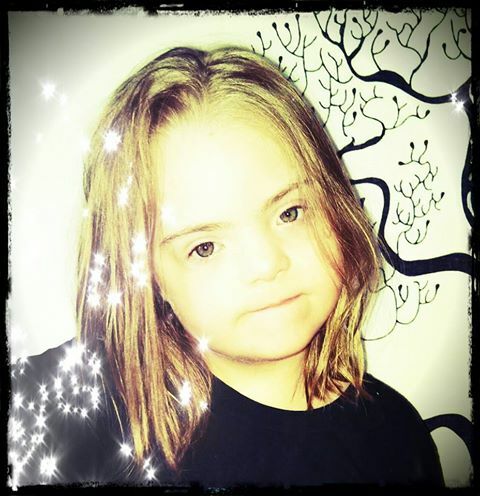 My almost 37 yr old daughter, Susan, who just happens to have Down Syndrome and brown hair. Why do I mention brown hair? Because it’s simply a part of who she is – just like the DS. What people don’t get is that she is just like everyone else; good days, bad days, likes, dislikes. Some people with DS will do great things; others will get by. Some people “WITHOUT” DS will do great things, others will get by. Can’t imagine not having this wonderful daughter, as well as her 2 wonderful brothers! Ayden is 13 months old and the one thing we want people to know is he is our child and we feel the exact same way about him we feel about our other children! Yes, we were a little shocked in the beginning but then they put that baby in your arms and it doesn’t matter what’s going on with them. It’s just unconditional love, no different! This is Hayden. Age 6. Beyond the shock and tears, It is a life changing gift of pure love and joy. What a blessing he is to our family. He is the light of our lives. 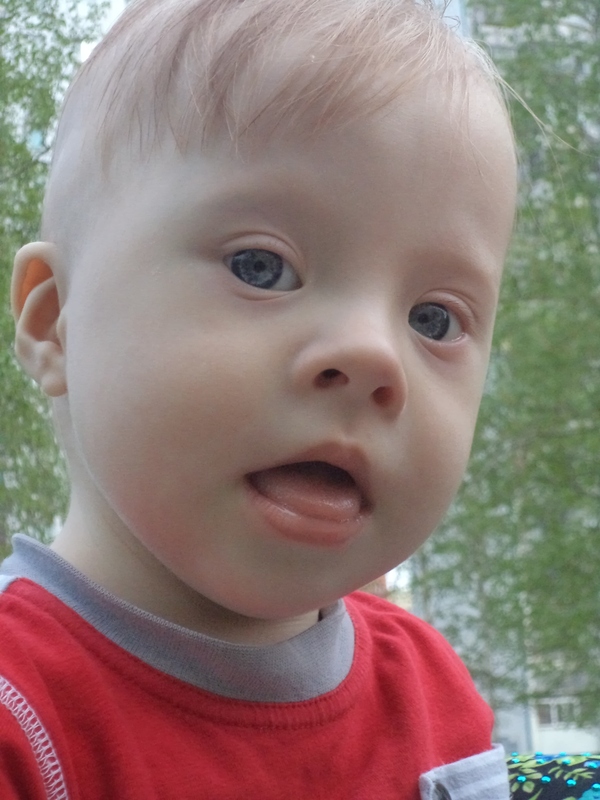 Our baby’s name is Clement, he is 1 year and 3 months, we live in Russia, in the Northern city of Nizhnevartovsk. During pregnancy, we knew not that the Lord has planned for us, a great miracle in the form of a tiny man with Down syndrome! Many years our country was practiced the refusal of our children, thank God now the situation is changing dramatically due to such families as you! We haven’t had a moment of doubt, that our baby is a great blessing from the Lord! Thanks to our boy we found ourselves in a world filled with unconditional love, joy, hope, new acquaintances, emotions and sensations. This can be compared with a beautiful unexplored planet, which is full of pleasant surprises where we are guests and discoverers! 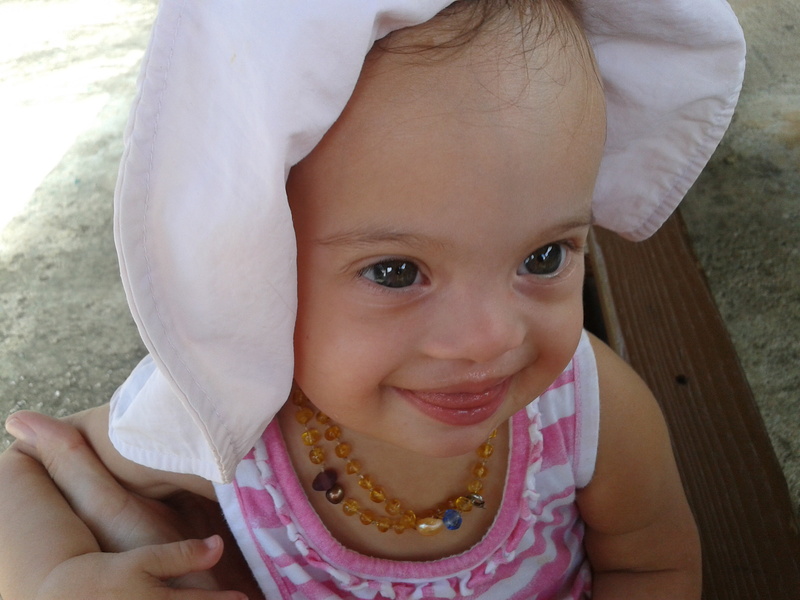 We believe that there will be times when each family will dream of such a great blessing, as people with Down syndrome! I am no mystery, I am Gods perfect creation! I am no mystery, I’m Gods perfect creation! Please realize my lovely, sweet Katy wants to be included. She wants friends, but wants understanding, too, that sometimes things don’t come as quickly to her as they do to others. That she will try with all her heart, but what takes others to get in an hour may take her a day. But she won’t give up and she will get it. Katy is 9 and lives in Delaware, Ohio. My son’s name is Caleb and he is 14. He says a lot of witty and funny things that you would not expect. The one thing I think they world needs to know is that Caleb wants to have friends, go hang out with the guys. He has feeling too, as it has been said ” We are more alike than different”. He wants the same things other boys his age do, he really just wants to be included. Our son Trip (Robert Alan Pickering III) is 2 1/2 years old. 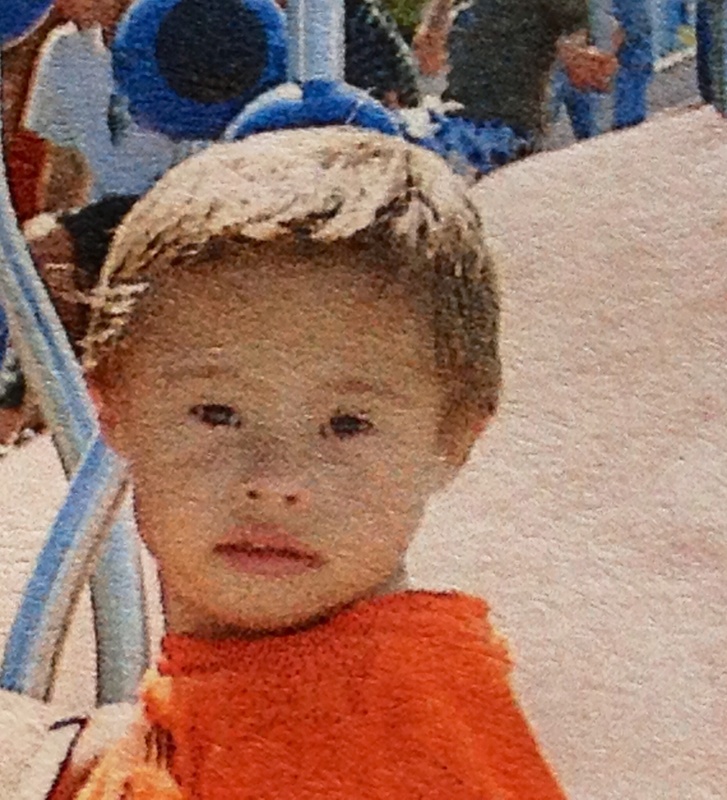 We did not know he had Down syndrome until he was born. Very similar story to yours. Trip has made our lives full of wonder and joy. Things that we were told would take him longer, have not. He walked at 18 months, he is now in the process of potty training. 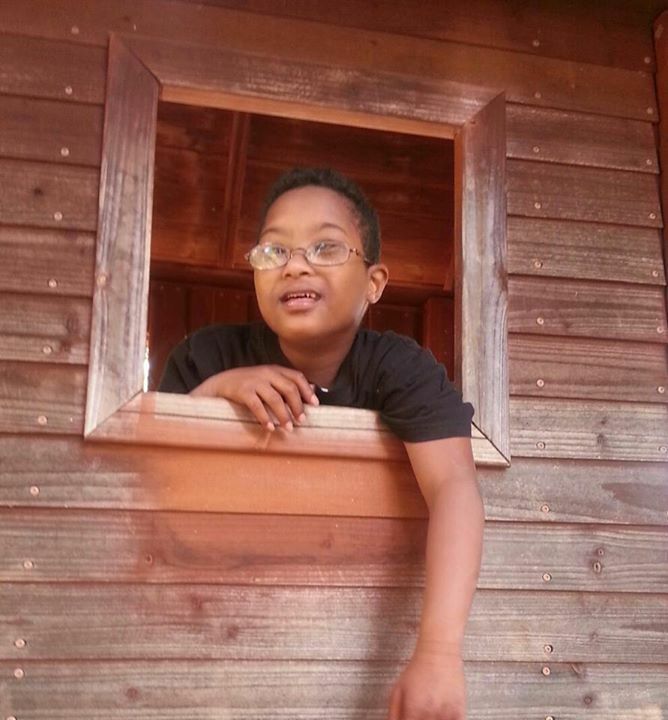 He uses sign language to communicate, he is actively learning both English and Spanish. 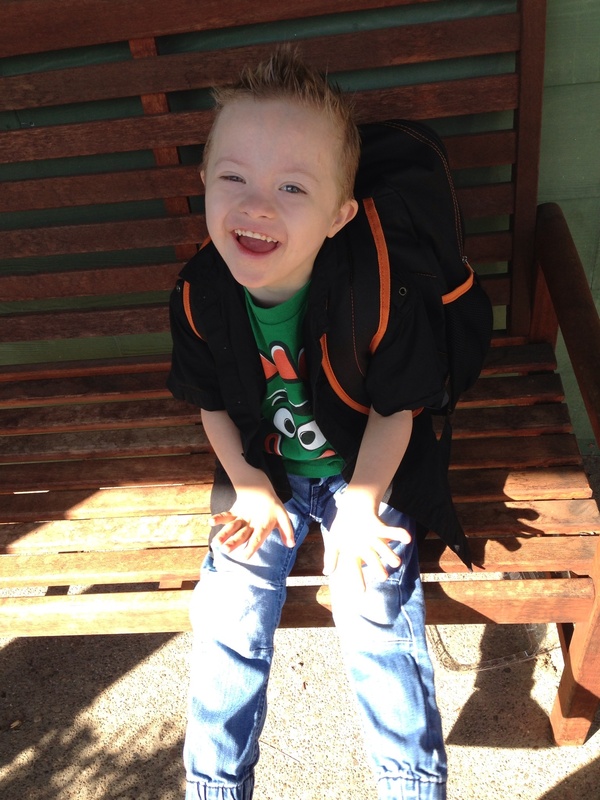 He dances when he hears music, he loves to have books read to him, and is learning to play gently with our small dog. One thing that he does is say hello to everyone. He has yet to meet a stranger. Anywhere he goes, he brings joy to people. He is so darn cute people can’t help themselves but want to say hello and smile with him. We know that he will grow up to change perceptions, lives and be an example of what a person of different abilities can accomplish. 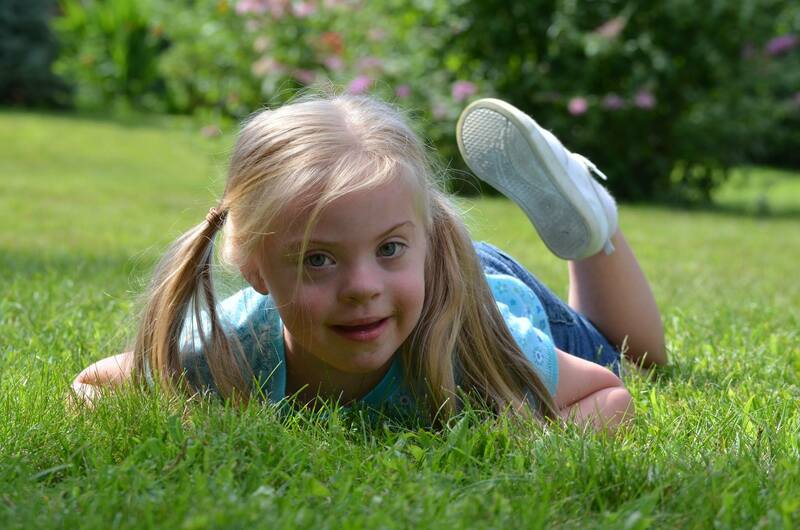 I would want everyone to know that not everything is about Down Syndrome. Carson is just Carson and I would never wish him to be anyone else than who he is. As a mother, there are many times I forget about the diagnosis and have to laugh when I am reminded. It’s not the first thing we think of when we think of our son. The diagnosis is important and it does play a role, but its not all encompassing or defining. Everyday, Carson shows us that all our fear is/was pointless. My son is Dawson he is almost 12. I think the thing that I hate the most that ppl say to me is that he will always be with me. Never leave home. To that I say he can do whatever he wants but if he lives with me forever that’s ok too. 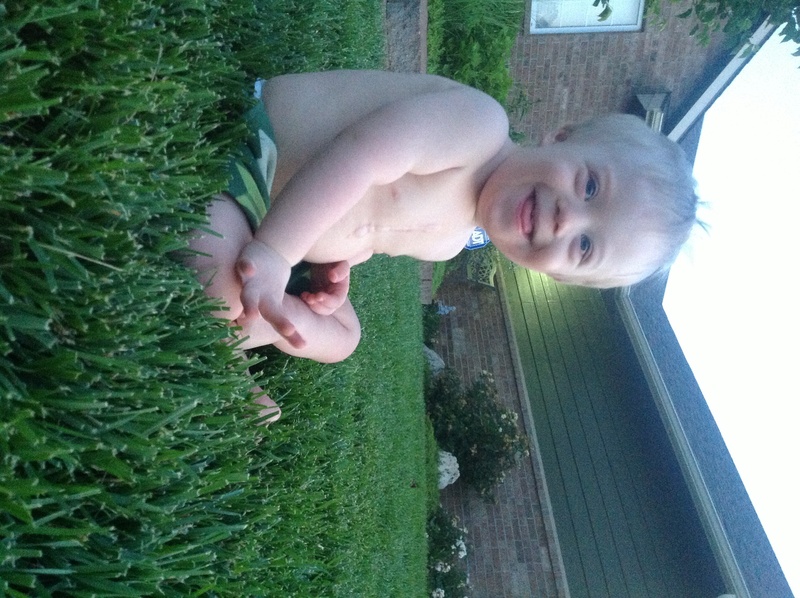 The one thing I want the world to know about Down Syndrome is that it doesn’t define who Drew is. First and foremost he is a child who needs to be loved and adored like any other child. 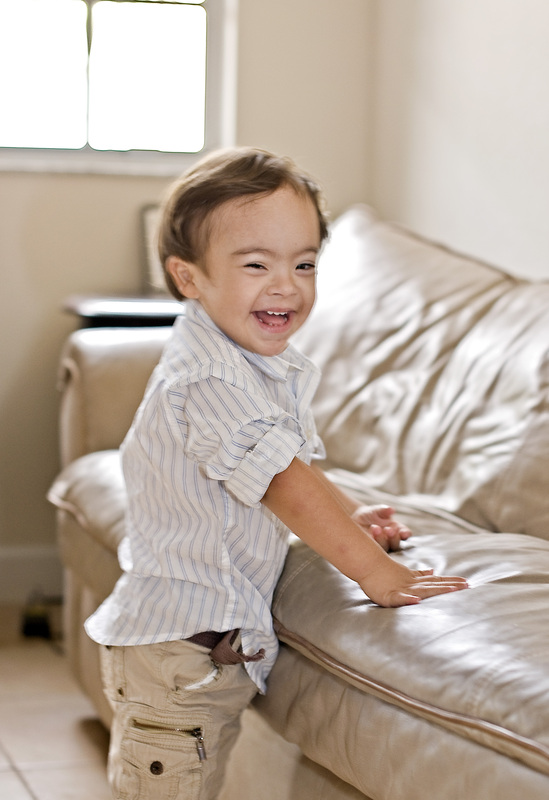 He gets into mischief and has his moments like any other toddler and his smile and giggle is absolutely contagious. 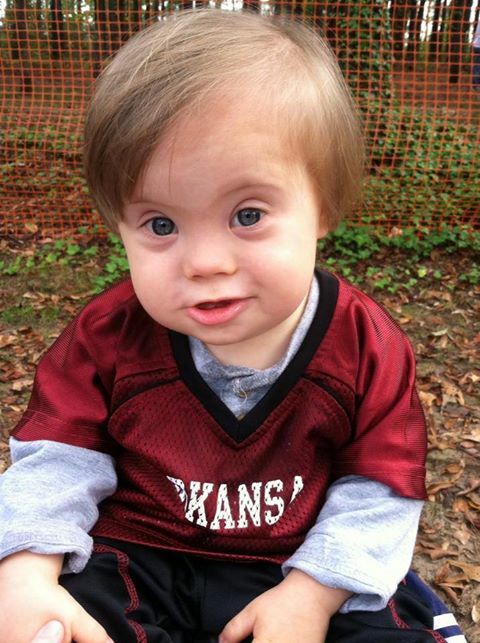 We didn’t find out Drew had Down Syndrome until the day he was born. Now that Drew is in our life we can’t imagine it without him. Drew’s family loves him for who he his. Extra chromosome and all. The sky is the limit for anyone with a disability. They just need to be given the chance to live up to their potential. Drew is not a burden he is pure sweet joy.